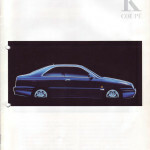 Lancia Kappa Coupé by Centro Stile Lancia under Enrico Fumia. 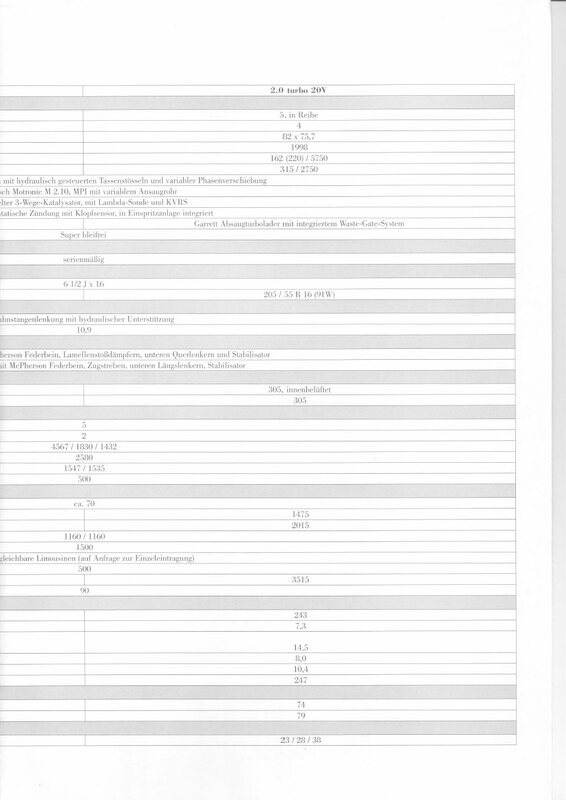 3,263-3,271 cars made. 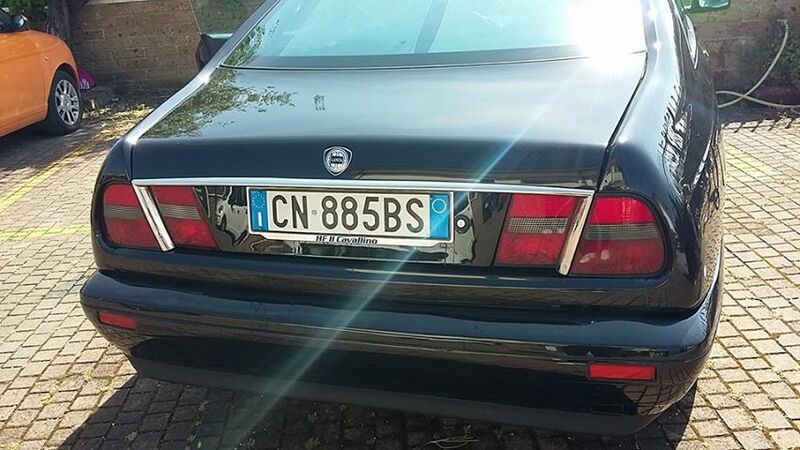 Tipo 838. 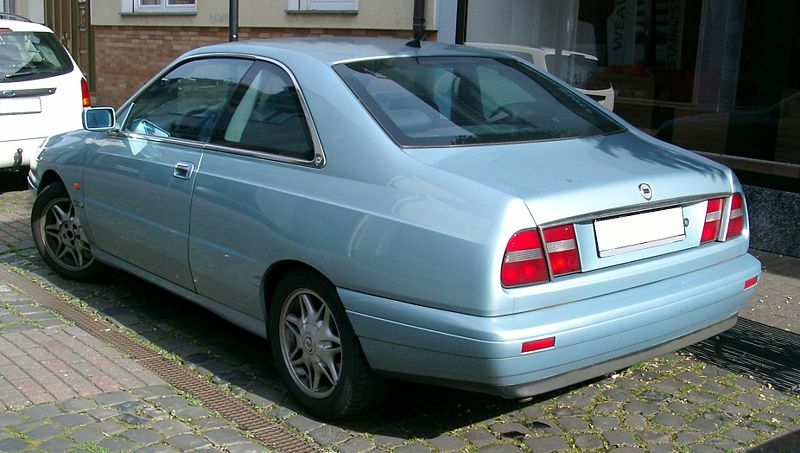 Based on Kappa Sedan. Built by Maggiora. 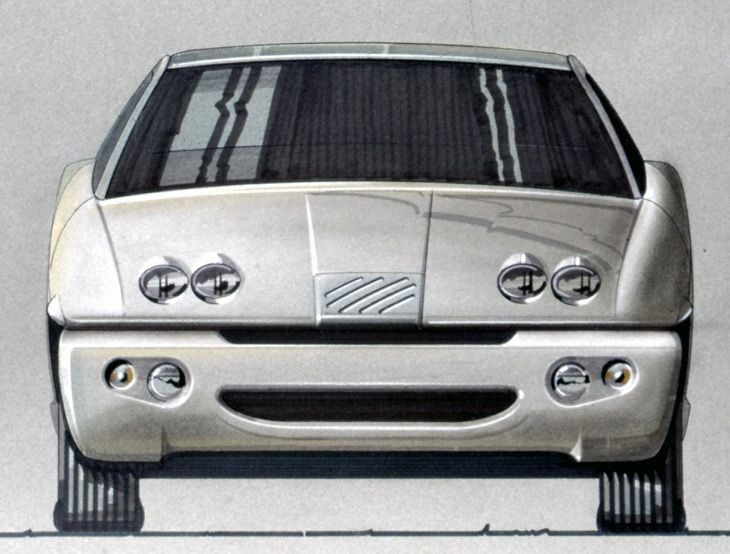 Designed by Centro Stile Lancia, built by Maggiora SRL. 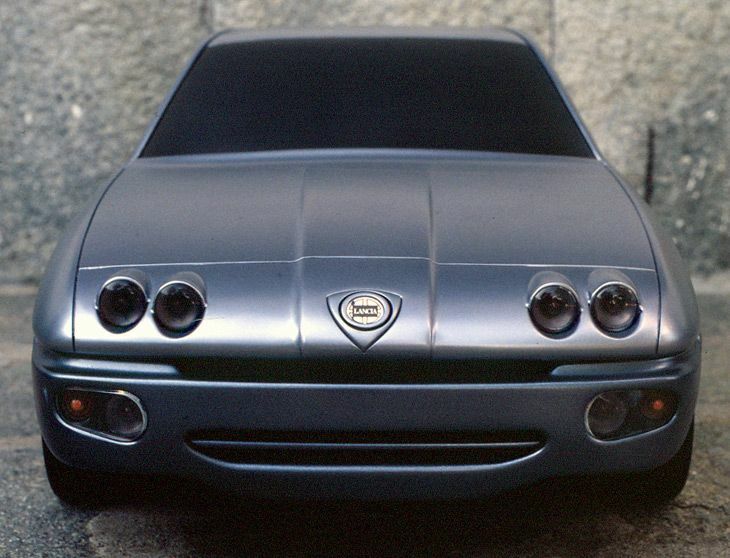 Fiat CEO Paolo Cantarella decided that a coupé should have more sporty character and… shorter wheelbase. 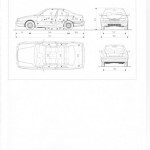 In case of a car based on the limousine underpinings it was not the best idea, because it visually enlarged the front and rear overhangs. 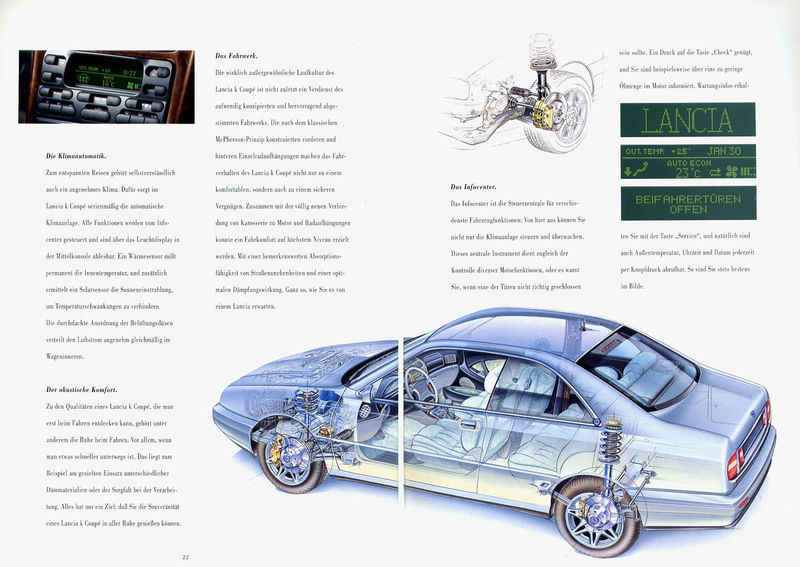 Car looked like being constantly on the two-page layout. This alone is belived to be the most important flaw that brought low sales. 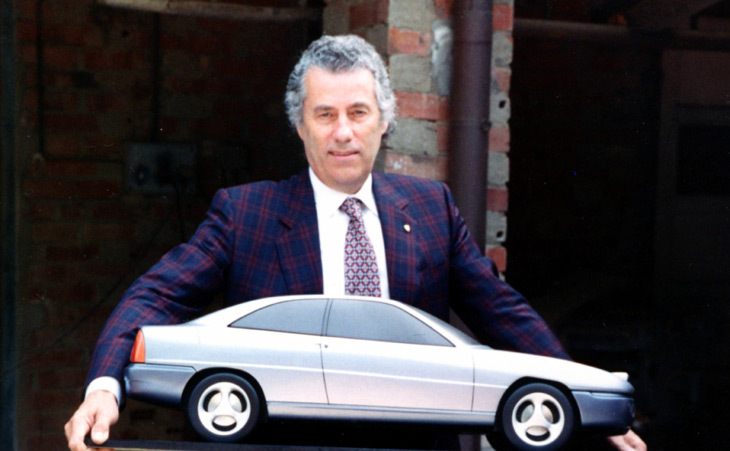 Director of Centro Stile Lancia at that time was Enrico Fumia, later replaced in 1996 by Michael Robinson. 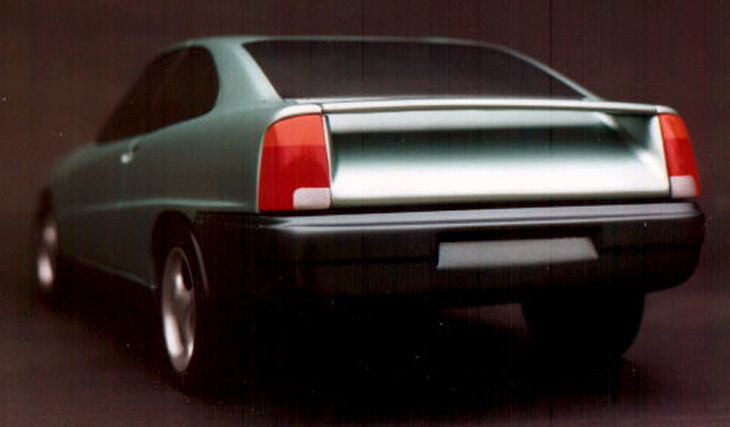 Most characterful are rear-end fins, reminiscent of Lancia Flaminia. 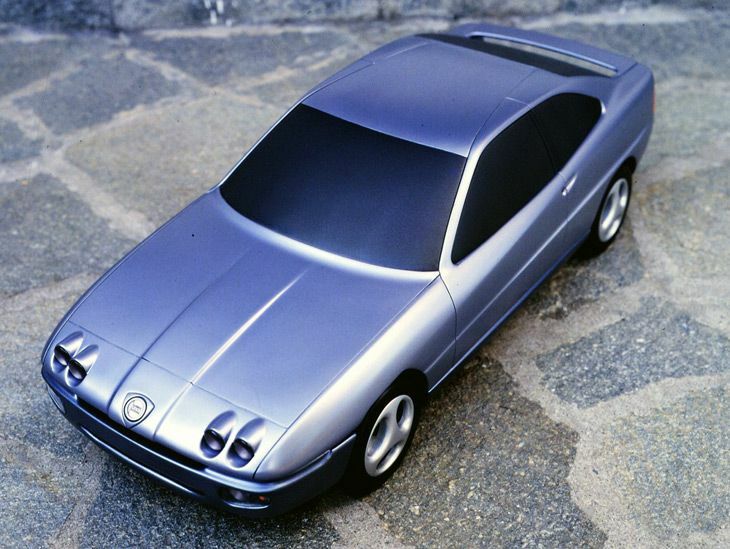 In spite of rumours, Maggiora was not responsible for its design. 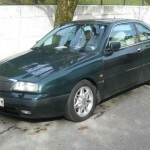 Front end is identical to sedan version. 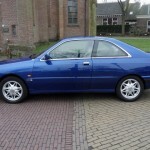 Sedan had 2,700mm wheelbase, whilst the coupé has 2,580mm wheelbase. Independent suspension, struts all-round. 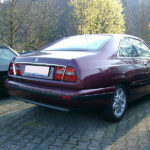 Rear lamps came from then-current Delta, separated by a chrome strip. 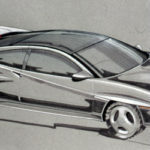 Bertone Kayak presented, based on k.
Production starts in July at Maggiora Plant (old Lancia plant) in Chivasso. 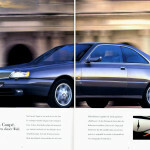 February 1997: Presentation at 67th Geneva Motor Show. Sales begin. M/Y. 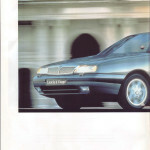 1998 is presented with new 5-cyl 20V turbo engine. 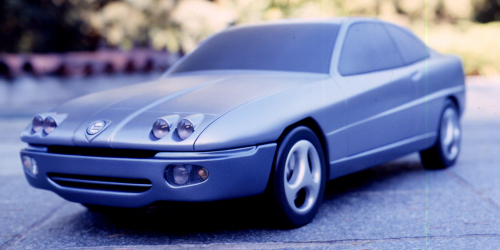 2.4 JTD prototypes are built. 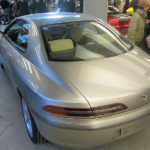 Production ended in April, due to low interest in car and declining sales. 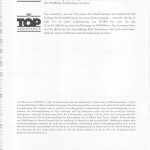 108.656.0.0 – LX 3000 V6 C.A. 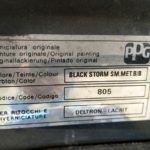 838B.000 838CD M2 | 3000 V6 24V C.AUTOM. 838CD11A 14 M2 | 3000 V6 24V C.AUTOM. 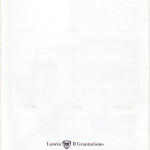 108.686.1.0 – LX 3000 V6 C.A.GAMMA’98 STEP A 838B.000 838CD11A M2 | 3000 V6 24V C.AUTOM. 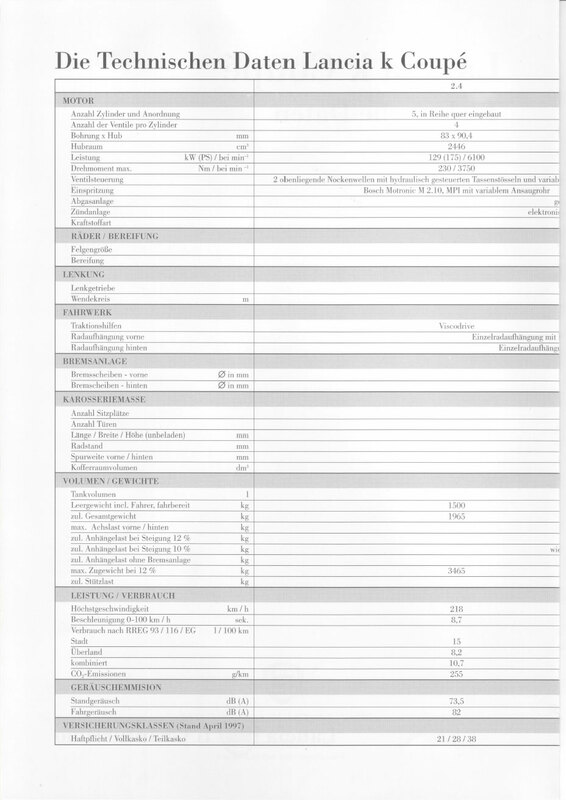 3 trim levels available: LS (16V 2000 and 2400), LX (3000) and Turbo (20V 2000). 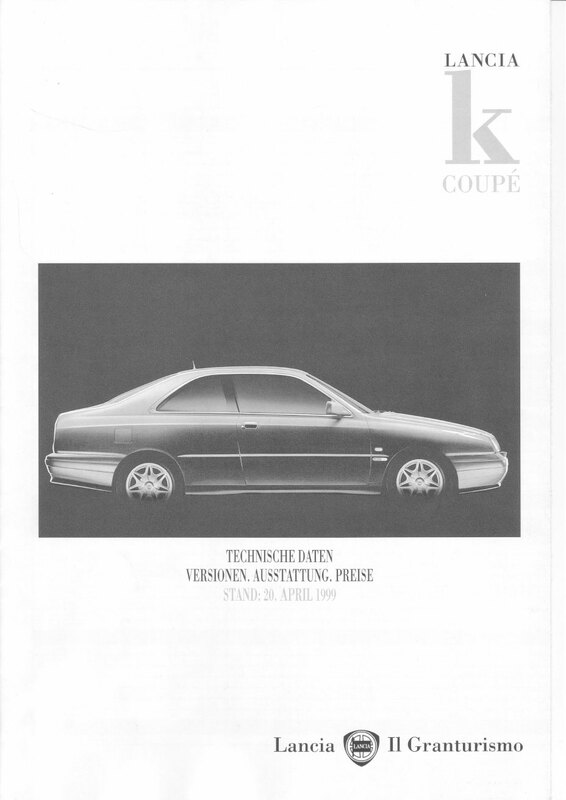 It seems there was no LE version coupé. 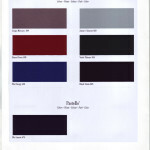 Mats colours: Grigio chiaro (c), Grigio scuro (s) or Bordeaux (b). 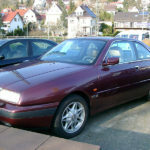 4 and 5-cyl engines are Fiat-derived and 6-cyl engines are Alfa-derived. 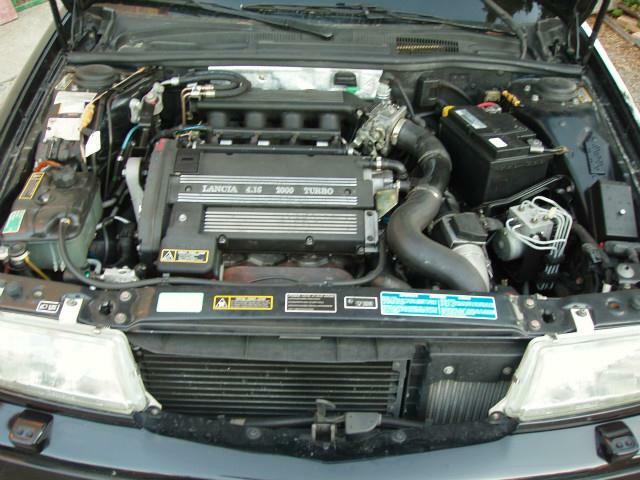 4-cylinder 16V turbo engine is based on Fiat Twin Cam engine. 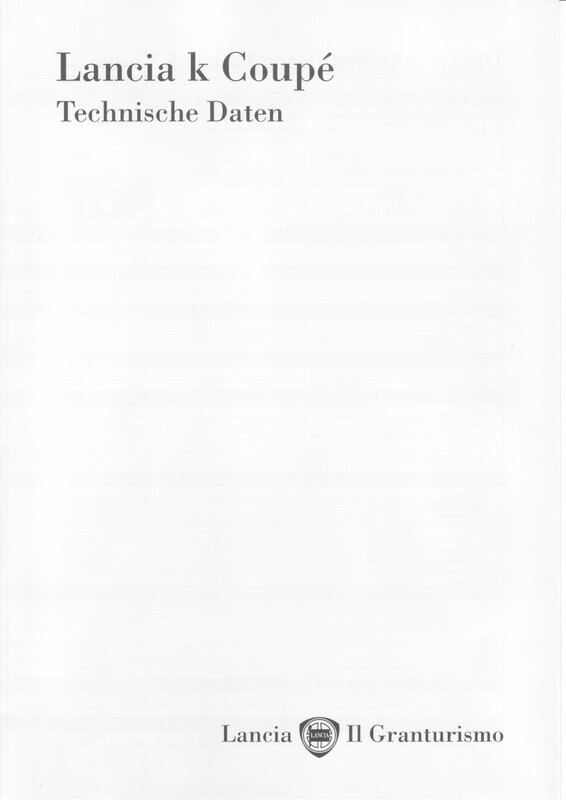 Same power as in Thema. 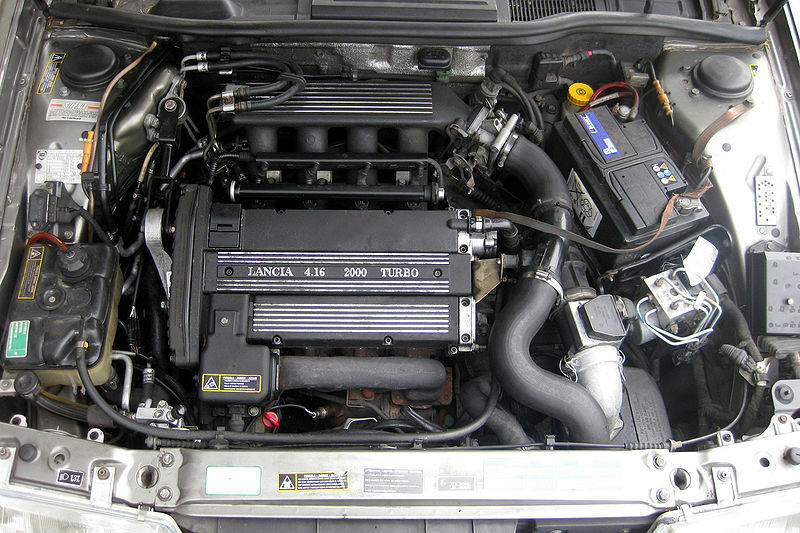 5-cylinder 20V turbo are derived from Fiat and have the same power as Fiat Coupé. 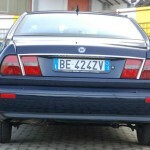 3.0 V6 24V is a detuned (204 PS instead of 220PS) Busso V6 engine derived from Alfa Romeo. 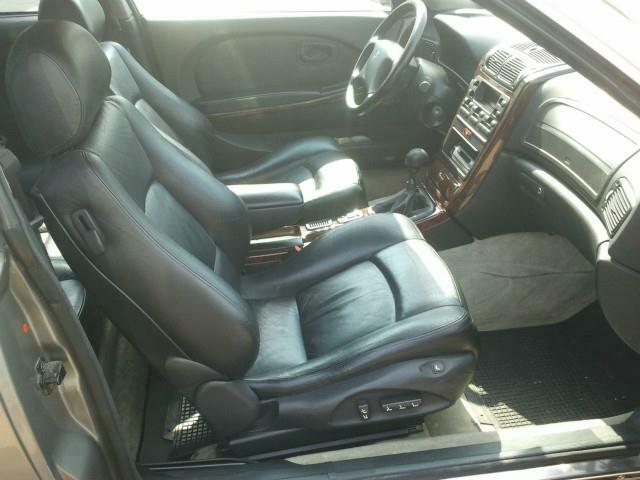 It uses a 4-speed ZF 4HP-18EH automatic transmission and differential. 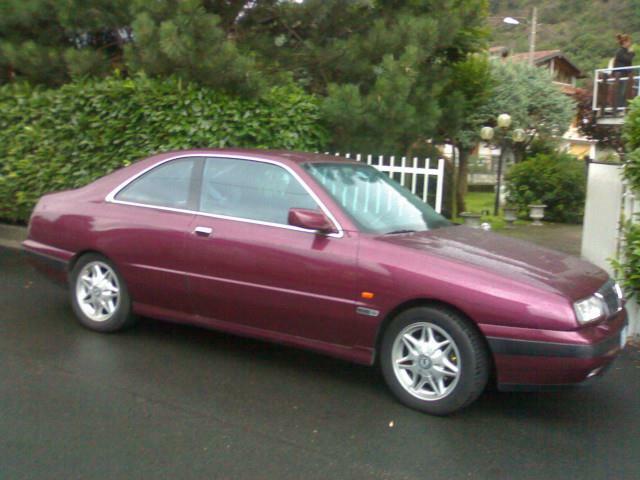 Later updated to ZF 4HP20 (Comfortronic). 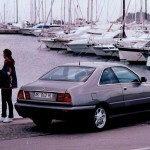 In 1998 a few cars were factory fitted with 2.4 JTD engines. More information soon. 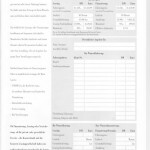 VIN numbers not registered in ePer. 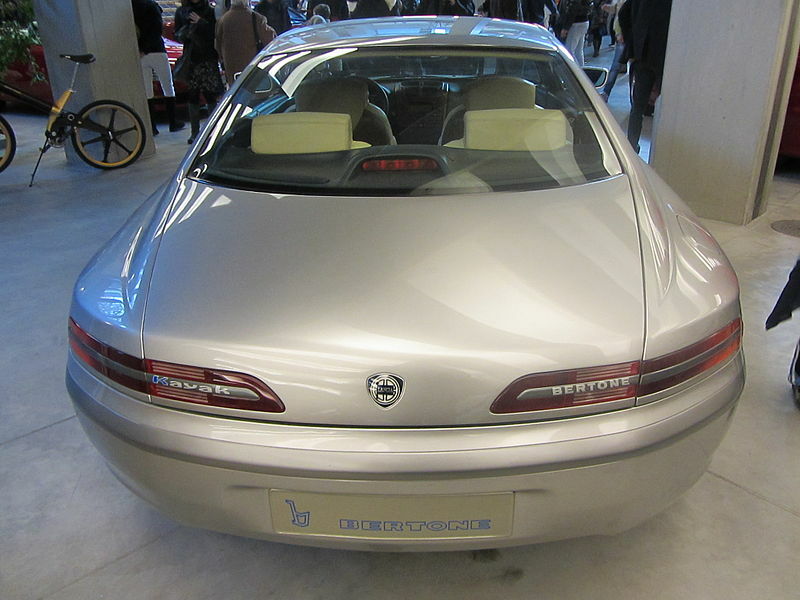 Bertone Kayak (1995-1996) 2 made. The focus of attention on the Lancia stand at the 67th Geneva International Motor Show goes to the Lancia k Coupé, a car dedicated to the purest interpretation of the sophisticated concept of “Granturismo”. 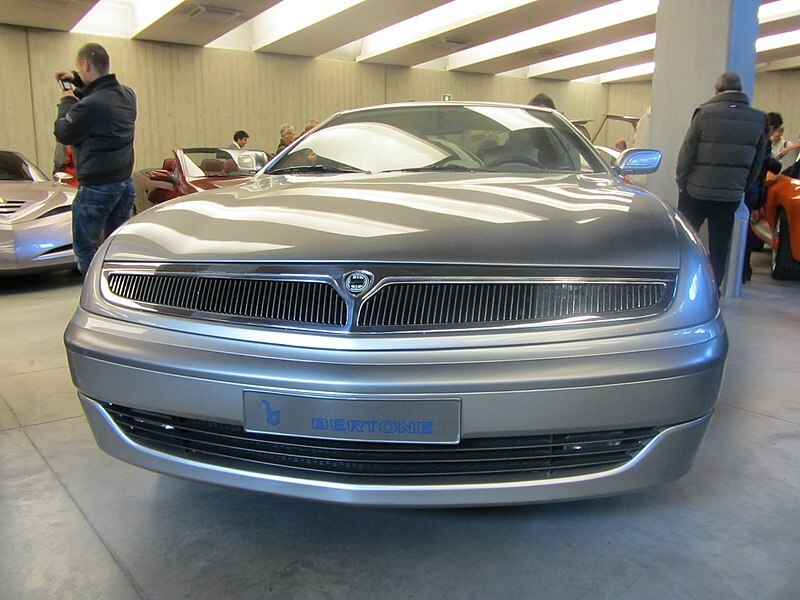 The centre of attention on the Lancia stand is the magnificent Lancia k Coupé which is due to be launched on the market. 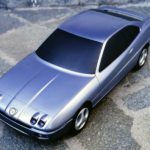 The model is dedicated to the purest interpretation of the concept of “Granturismo” and achieves its goal with sophisticated understatement and great character at the same time. 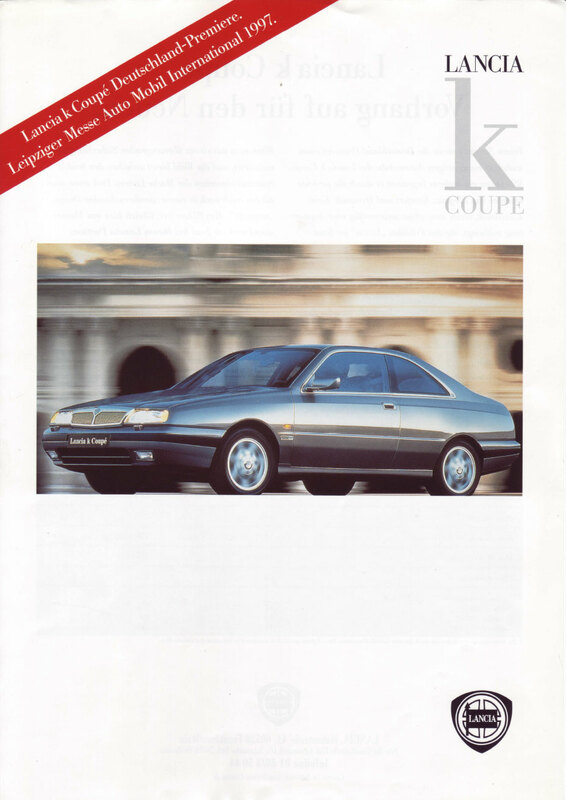 High-performance engines, maximum comfort, total safety, a single exceptionally sumptuous equipment level, advanced styling and technological solutions are just some of the immediately appreciable characteristics of the Lancia k Coupé. 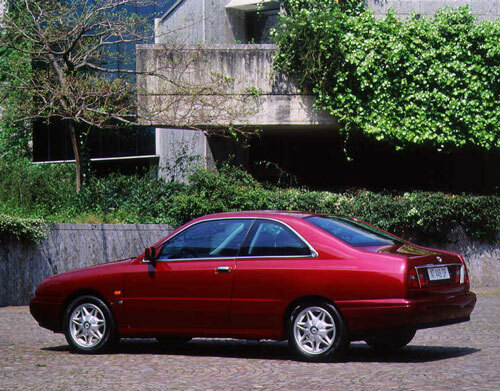 Its modern lines are not, however, above calling up styling echoes from the brand’s past, such as an elegant hint at rear fins, intentionally recalling the unforgettable character of the Flaminia. 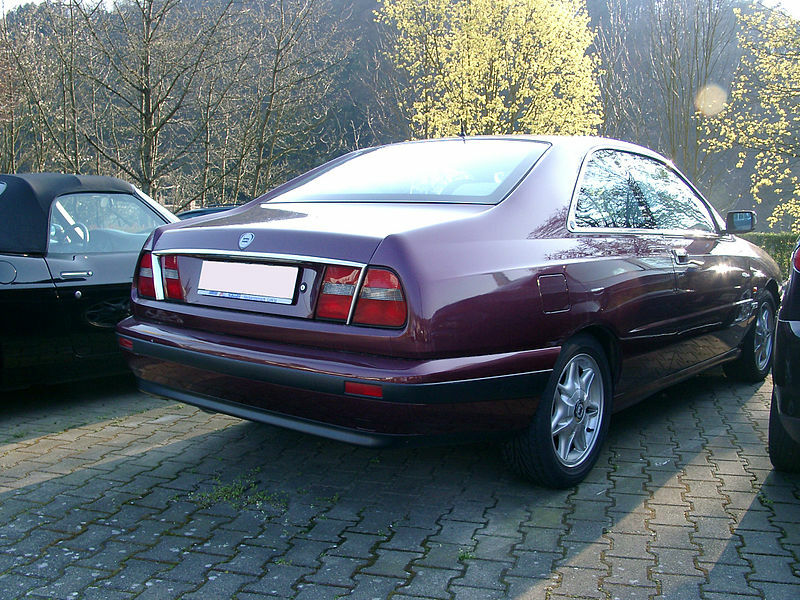 The Lancia k Coupé is shorter than the saloon, a consequence of the shortened wheelbase (12 centimetres) which makes it more manageable and compact. 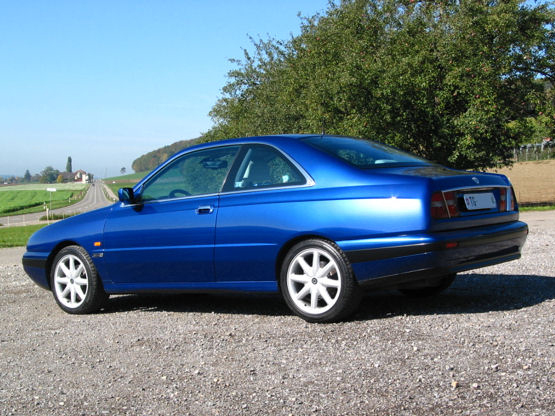 The height has also been reduced to give the Lancia k Coupé a more penetrating aspect and visually emphasise one of its strongest characteristics: its excellent stability and roadholding. 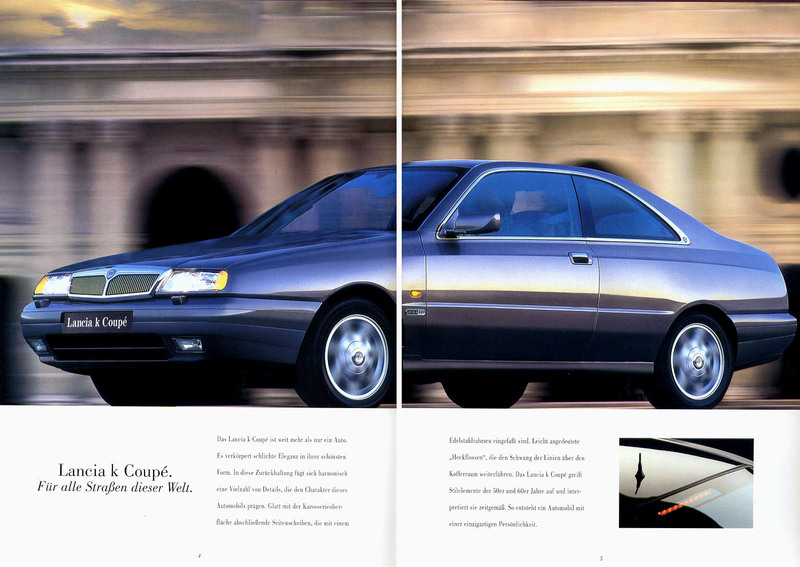 There will only be one equipment level, even more luxurious than the saloon’s LX trim. What’s more, a series of important optional extras will be available in addition to the comprehensive standard equipment, enabling customers to personalise their vehicles to the full. 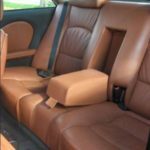 These include an electric sunroof, leather upholstery offered in the Kaleidos leather option by Poltrona Frau, a car alarm, radio with CD player, wiring ready for a mobile phone and the Servotronic system (the latter is standard on the 3.0 automatic). 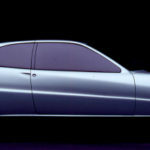 The stylistic and functional features distinguishing the Lancia k Coupé include frameless windows – a sophisticated yet traditional design solution on this type of vehicle, which not only enhances the styling of the Lancia k Coupé but achieves exceptional comfort too. Because when you close the door, the window actually moves up a few millimetres, compressing the weather strip to make a perfect seal. Conversely, raising the handle makes the window move down, enabling the door to open. 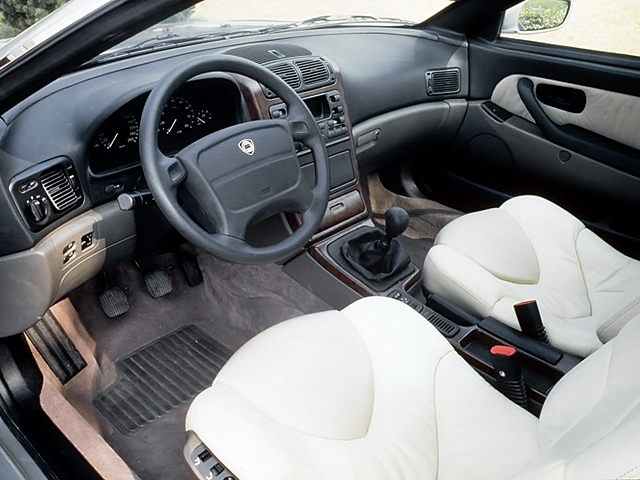 The interior of the Lancia k Coupéis not only characterised by meticulous attention to detail in the creation of exceptionally distinguished and elegant surroundings, but also benefits from a series of design features which significantly boost passenger comfort. 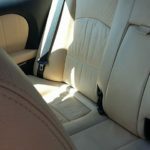 A typical example is the electric front seat which automatically moves forwards when released to offer more convenient access to the rear seats before returning to its previous position. 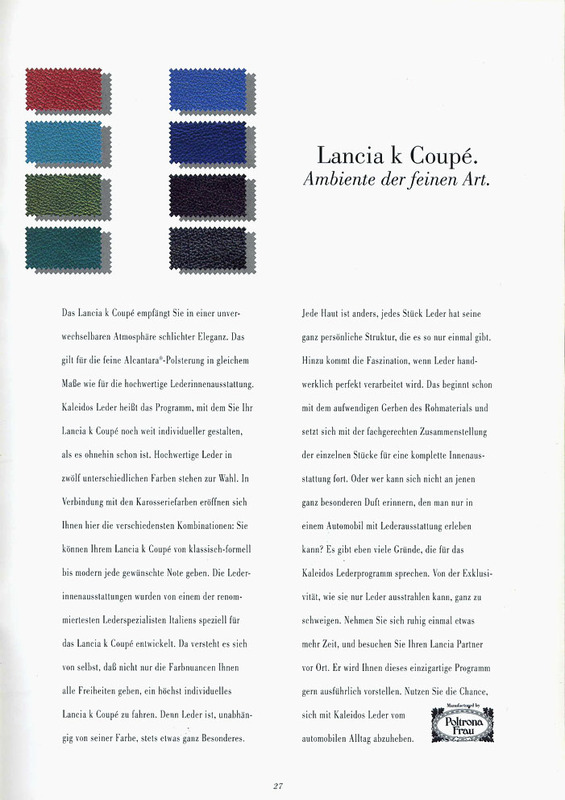 The Lancia k Coupé is available in six new metallic colours in addition to Lancia blue, not to mention a choice of four different colour options for the standard Alcantara interior. 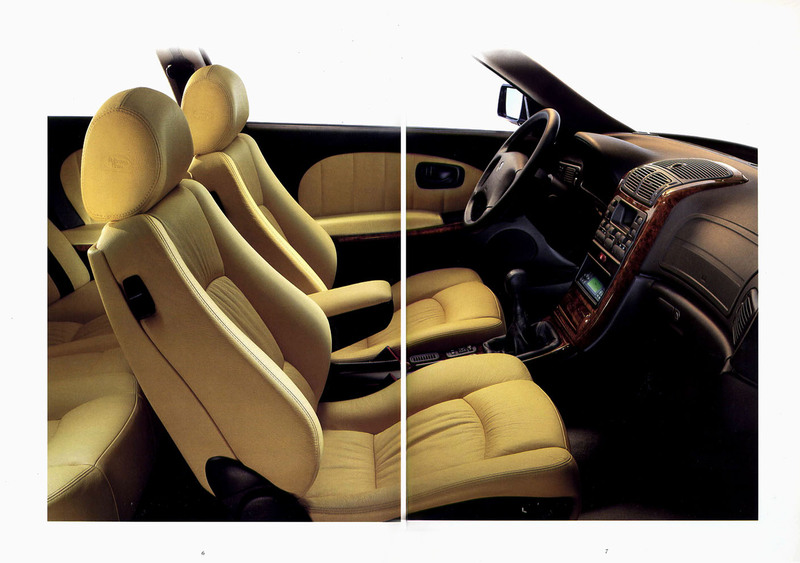 While on the subject of the interior, you not only have a choice of Poltrona Frau leather upholstery, but the Lancia k Coupé is also available and indeed on show in Geneva as a world preview, in optional Kaleidos leather by Poltrona Frau. 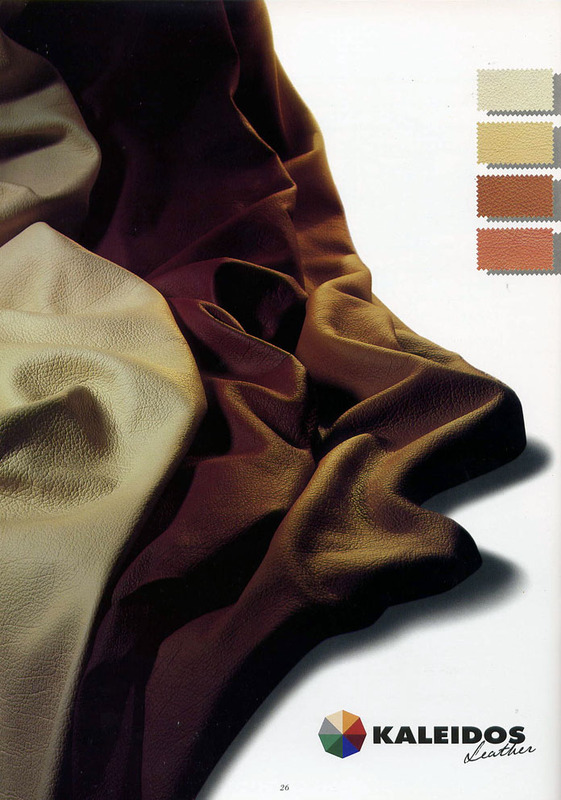 Similar to the Kaleidos body colours for the Lancia Y, Kaleidos leather allows customers to choose the interior of their car from 12 different colour options. 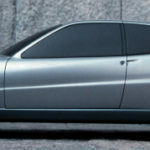 Two models of the Lancia k Coupé will be on show at the 67th Geneva International Motor Show, one with a 3.0 engine and automatic gearbox and the other with a five-cylinder 2.4 engine fitted with several of the many accessories available in the Lancia Lineaccessori range. 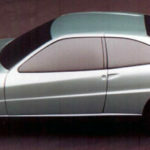 Lancia‘s return to the prestige coupé market, (the last model was the Gamma Coupé), is marked by a pure embodiment of Lancia style: cracking performance and great driving satisfaction in a car with a sophisticated personality.The new car’s commercial goal is to make its presence felt within a fast-growing competitive scenario. 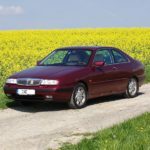 This elite Coupé will fulfil the twofold aim of completing the Lancia k saloon and SW range while also carrying on a proud tradition by following in the footsteps of illustrious predecessors such as the Flaminia Coupé and the Gamma Coupé. 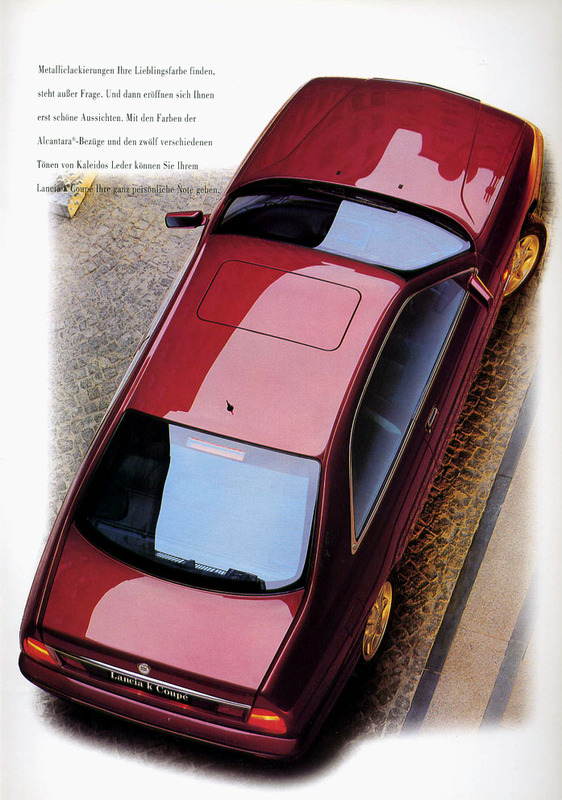 The Lancia k Coupé‘s style and engineering set it at the very peak of its category. 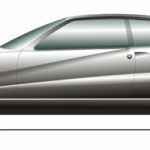 This new Lancia will be able to take on the best of the competition within the elite Coupé arena. 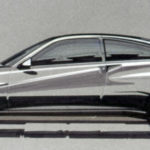 It will benefit from a head start in terms of advanced technology (controlled damping suspensions and gas discharge headlamps), comfort (four comfortable Recaro seats and a saloon-standard luggage compartment), structural integrity and hence vehicle safety (torsional rigidity of 160,000 kgm/rad). The car may also be personalised with exclusive options such as the 12 different coloured Kaleidos leather interiors by Poltrona Frau. 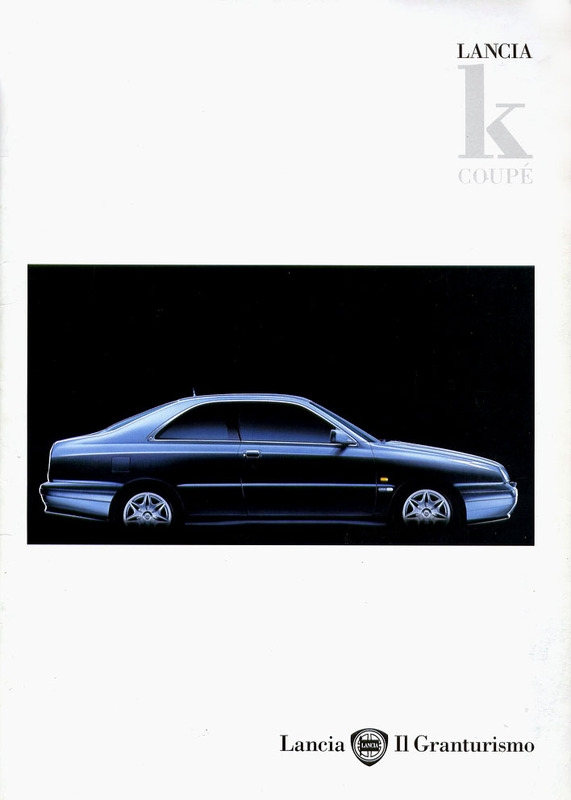 The Lancia k Coupé offers all the attributes of a Lancia k saloon, plus distinctive traits of its own which all add up to a unique, special car: original styling with discreet references to trademark Lancia features, short wheelbase and highly individual interiors. 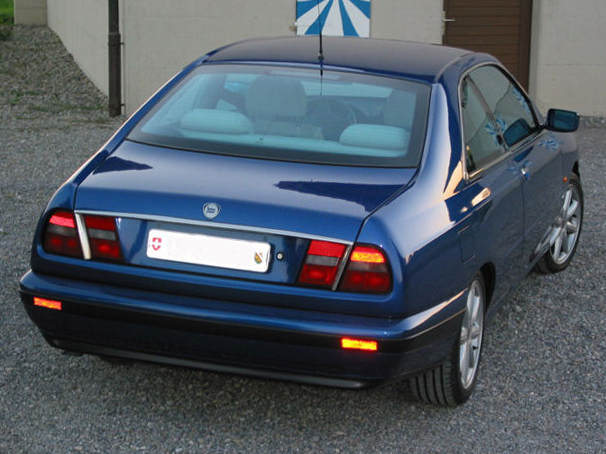 The Lancia k Coupé comes in just one version with comfort as standard. 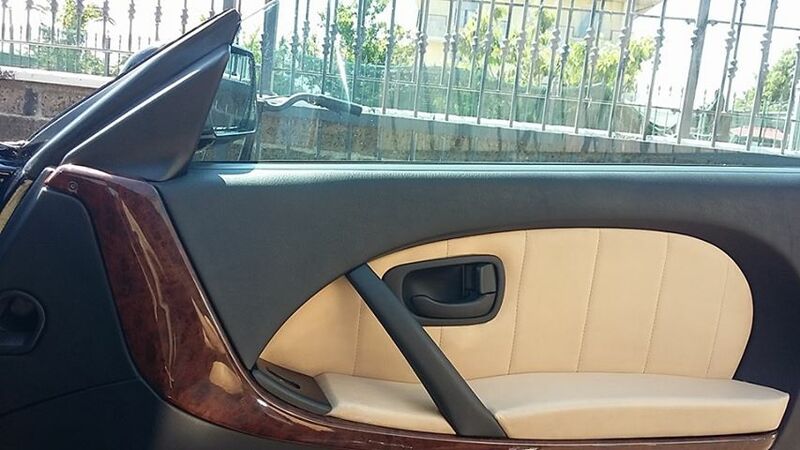 Features include a driver and passenger air bag, automatic air conditioner, provision for a car radio and car telephone, remote controlled door opening and closure, light alloy wheels and wide tyres, electrically controlled Recaro seats in Alcantara and metallic paint. 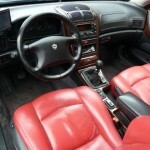 Other high-tech extras can be added as a matter of personal choice. The options list includes: controlled damping suspension, state-of-the-art gas discharge headlamps and an electrically operated sunroof. 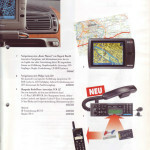 Accessories include: “Viasat”, an innovative satellite locating safety and rescue system, and the up-to-date Route Planner system. 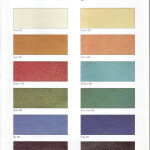 The customer can also choose leather interiors crafted by Poltrona Frau. 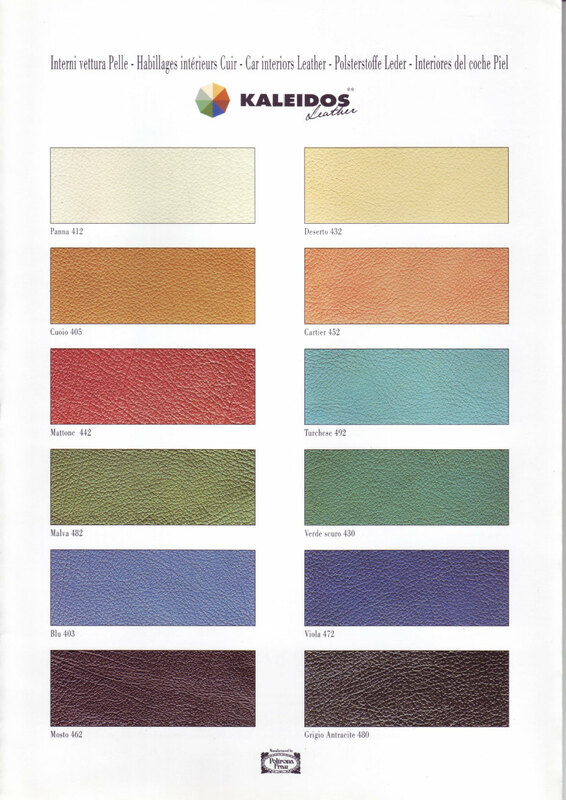 The 12 colours in the Kaleidos leather option range may be also matched with three different carpet shades for a completely individual interior. 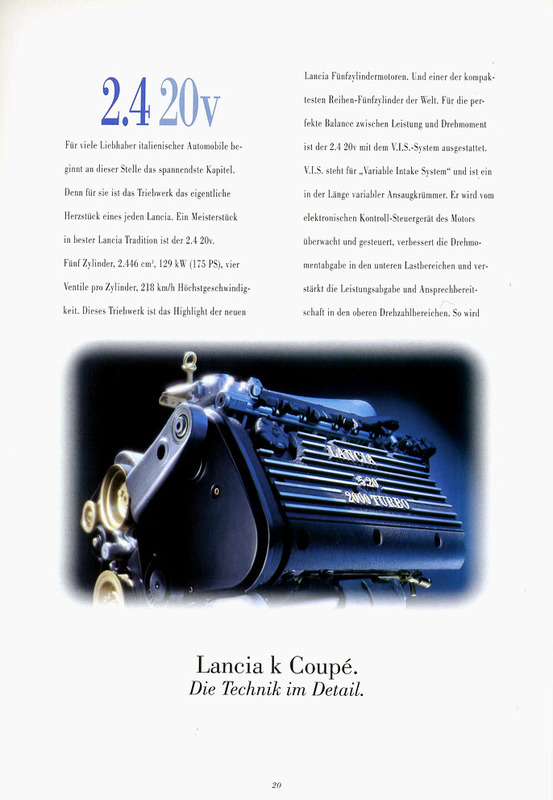 The Lancia k Coupé engines offer coupé-standard performance while sophisticated engineering maximises active safety, as one would expect from this glowing interpretation of Lancia style. Powerful and reliable power units ensure that the new car is capable of the lively responses one expects from a Coupé while never exceeding the bounds of good taste. 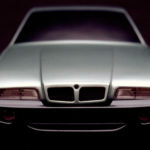 Peak performance on a par with those of the Coupé’s leading rivals is provided by three engines with different characters. 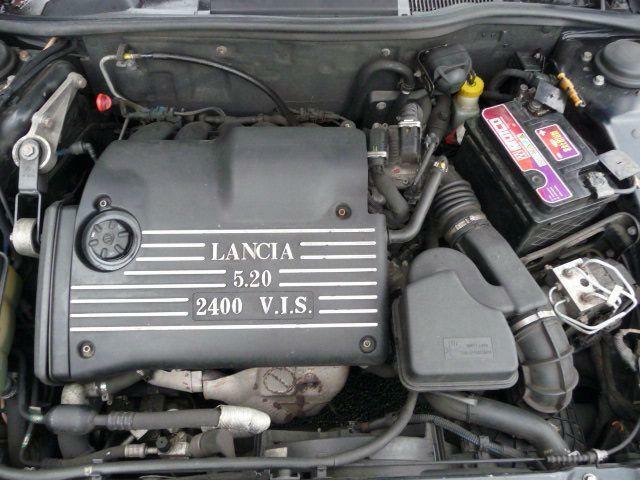 The lively 2.4 five cylinder 20 valve unit with modular manifold delivers 175 bhp. 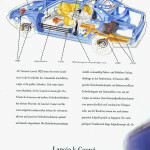 It propels the Lancia k Coupé to a top speed of 218 km/h and from 0 to 100 km/h in 8.7 seconds. 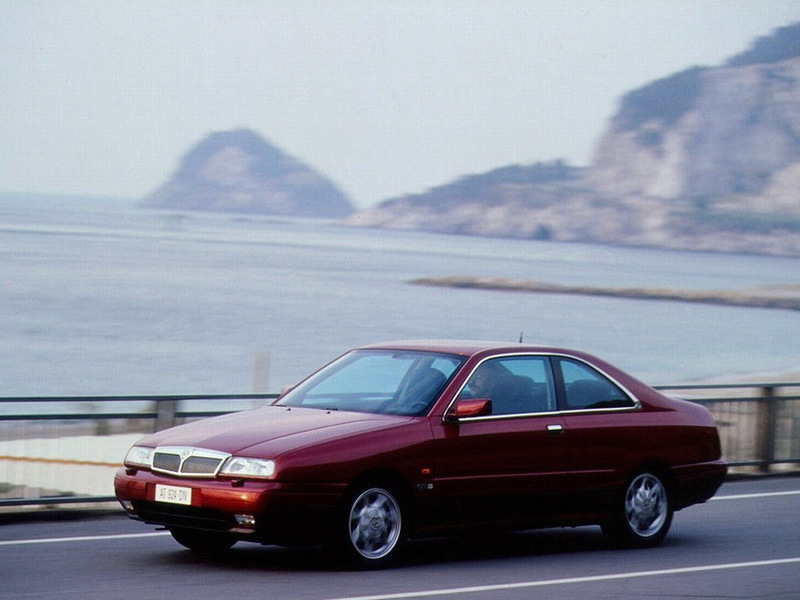 The Lancia k Coupé can also be equipped with a 205 bhp 2.0 turbo engine capable of a top speed of 235 km/h and acceleration from 0 to 100 km/h in 7.3 seconds. It covers a kilometre from a standing start in 27.5 seconds. 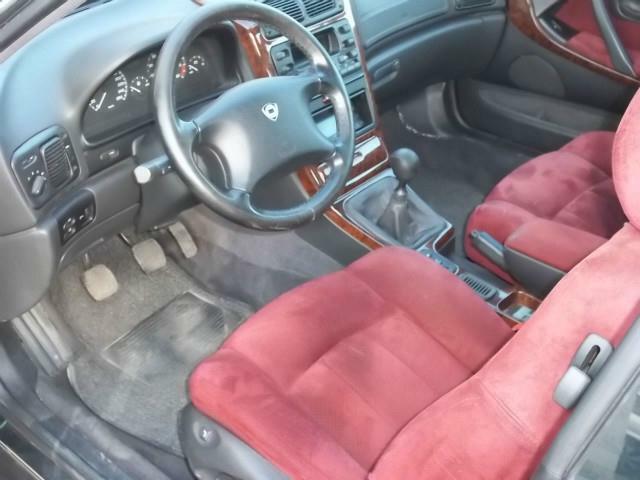 Finally, the superbly engineered 3.0 V6 24 valve 204 bhp unit is matched with an electronically controlled four speed automatic transmission to permit a top speed of 220 km/h and outstanding driving satisfaction. 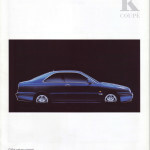 The Lancia k Coupé is designed to appeal to the most demanding of customers. 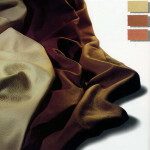 This commitment is evident in great attention to detail and painstakingly thorough manufacturing standards. 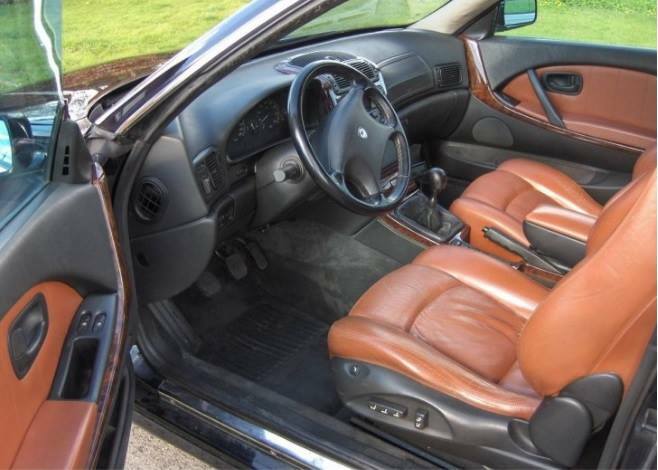 This car has been designed and developed to offer the very best of everything: performance, comfort, safety, sophisticated engineering and exclusive specification – plus all the perfect poise of a decidedly upmarket vehicle. 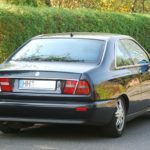 The Lancia k Coupé will go on sale from the beginning of April in Switzerland, followed by Italy and other European markets. The sales forecast is about 3,000 units per year. 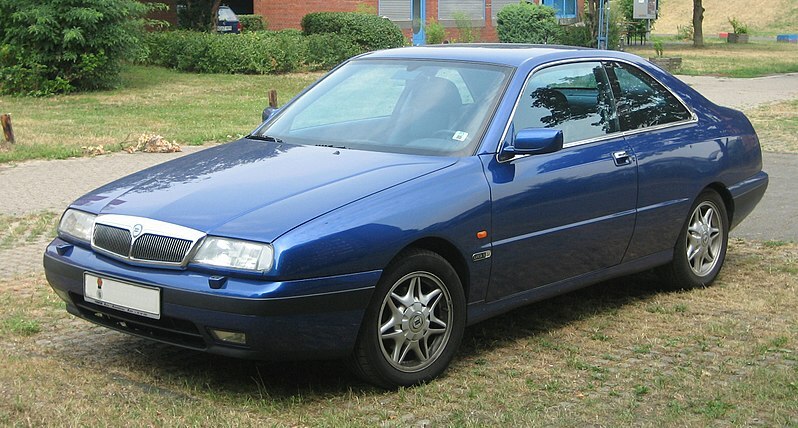 The new car is a two-door Coupé derived from the Lancia k saloon. 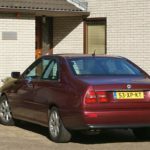 Only the front overhang of the original model is preserved because all other sheet steel parts are original: side panels, roof, door pillars, rear wheel arches and boot lid. 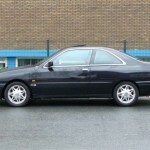 The Coupé is shorter than the saloon (4.56 m instead of 4.68 m) because the wheelbase has been reduced by 12 cm (from 270 to 258 cm), and the car is 37 mm lower. 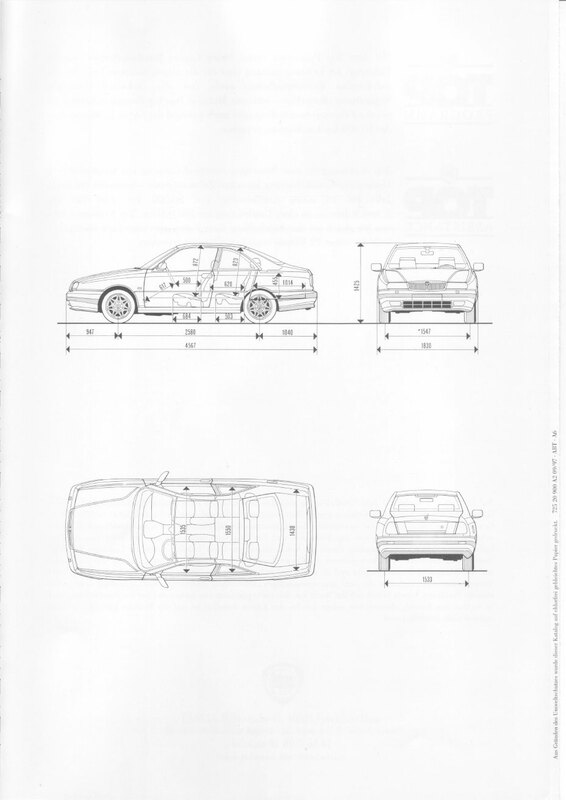 Together with the smaller ground clearance and lower front pillar, these dimensions give the car a more aggressive appearance while still maintaining plenty of room at the front and rear. 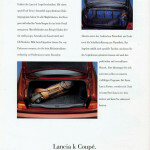 Two of the Lancia k Coupé‘s main characteristics are apparent at first glance: excellent quality and great road-holding. 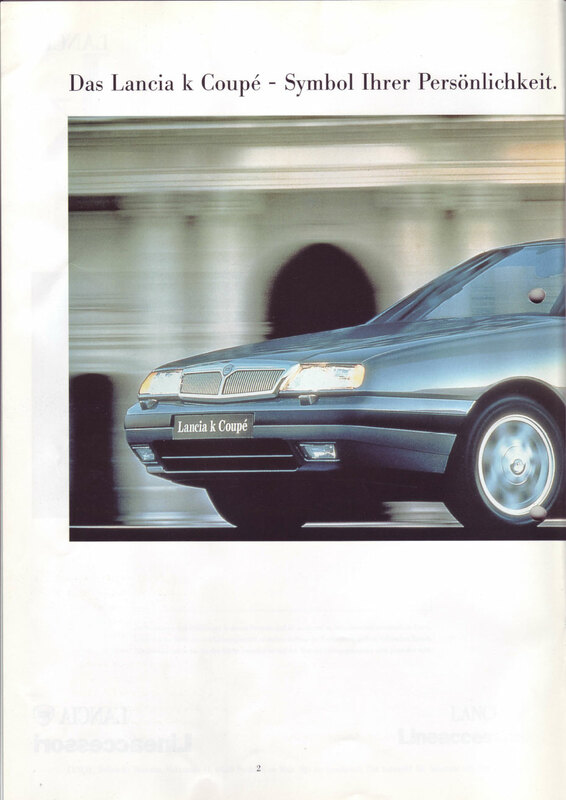 A product of the Lancia Style Centre, the Lancia k Coupé‘s classically styled chrome front grille and bonnet immediately declares the car’s kinship to the saloon. 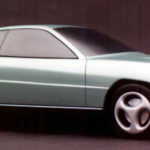 The rest of the car assumes its own distinctive personality, with side panels which alter in width two-thirds of the way down to divide the lower part from the roof panel. The clean lines are accentuated by side windows framed in stainless steel. An impression of continuity comes from the fact that the glass is unbroken by the unobtrusive, black pillar. The back window is raked and flanked by two tail fins. 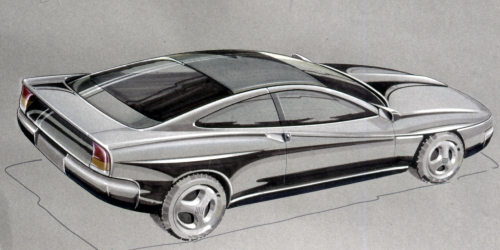 Although barely accentuated, these are a discreet but unmistakable reference (like the window frames) to another celebrated Lancia of the past: the Flaminia Coupé (the rear end of the vehicle is completed by horizontal tail-light clusters, as on all recent Lancia cars). These frame the number plate; also framed in chrome. 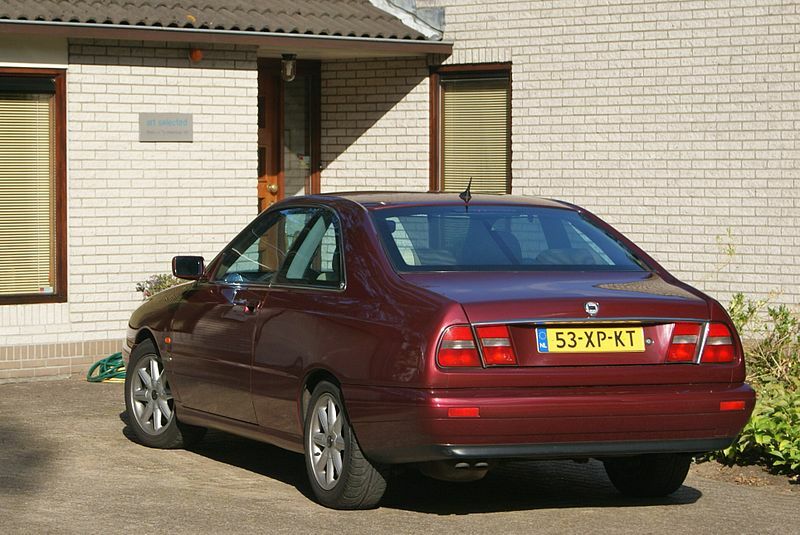 Shorter, more compact and easier to handle than the saloon, the Lancia k Coupé maintains the same overall generous dimensions of the flagship, distilled into a slender, stylish form (CD is 0.31). 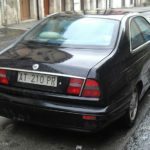 The overall impression is that of an up-to-date car given extra appeal by a few classic retro Lancia touches, such as rear fins or chrome parts (frames, door handles). These references to glories of a bygone age add light and emphasis to details otherwise overlooked. 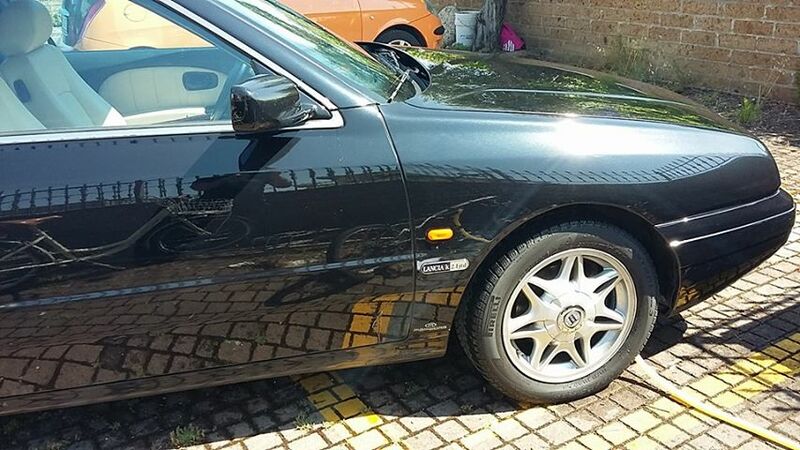 The vehicle exterior is completed by 16″ alloy wheels in a brand-new seven-point star design and low-profile tyres. 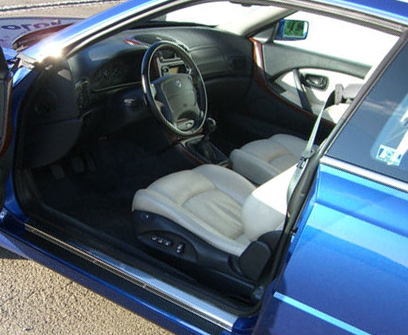 The Lancia k Coupé doors feature flush windows (i.e. 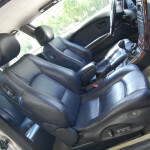 without a surrounding frame) and are generously sized to allow convenient access to front and rear. 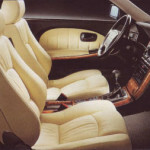 The Coupé cabin differs from that of the saloon, because the shape, trim and design of many components have been changed. The facia and central console, for example, are in a stylish, uniform, anthracite grey, enhanced by parts in wood from renewable resources. 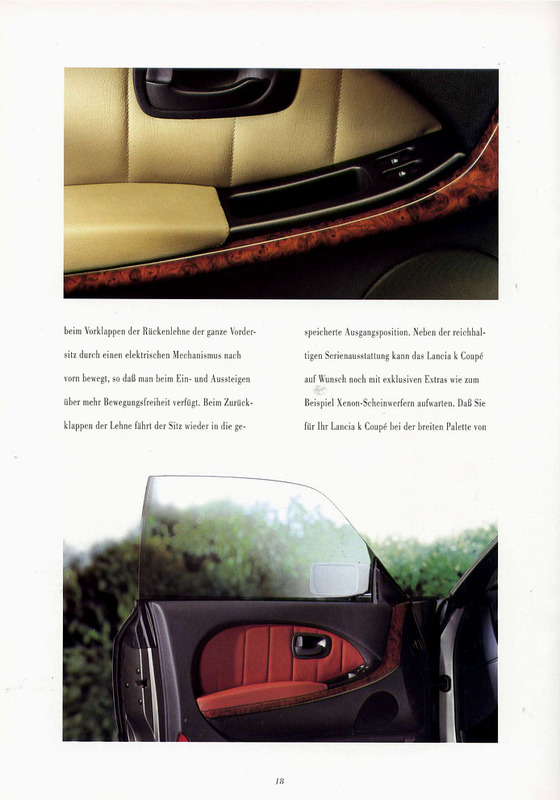 Redesigned parts include pillars, roof, rear panels and distinctively-shaped door panels which add an individual touch to the Lancia k Coupé interior. 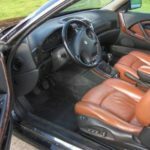 The door panels actually include a central drop-shaped element trimmed in Alcantara or leather while the seats are framed in anthracite grey. 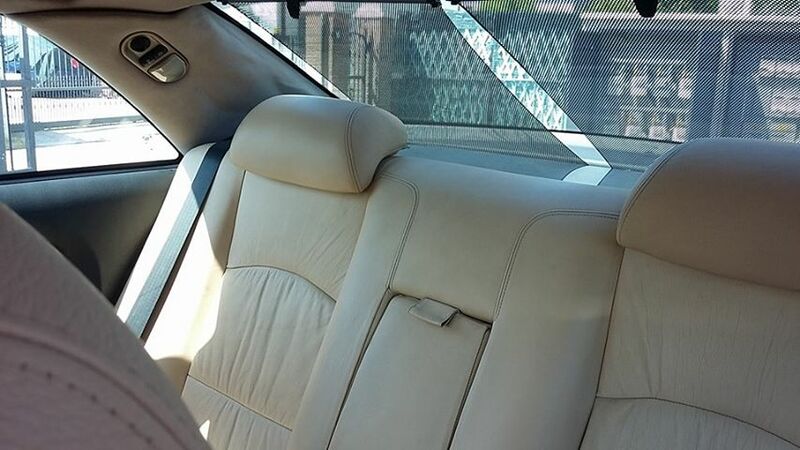 An arm rest with electric window controls (also trimmed) and document tray are located at the foot of the panel. 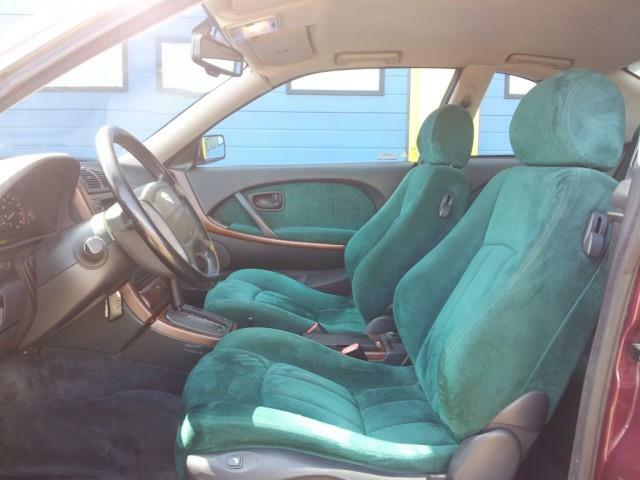 The front seats are made by Recaro. 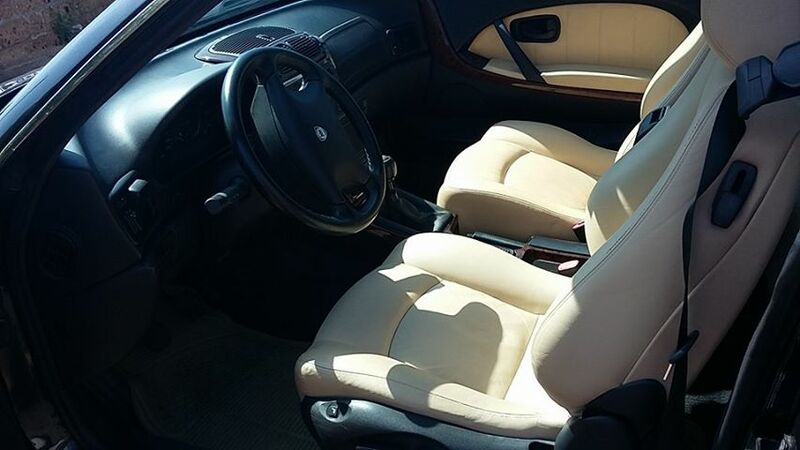 Produced specially for the Lancia k Coupé, they satisfy the twofold functions of ensuring comfort and beauty of form, while their profile is designed to hold drivers and passengers in their seats when this lively thoroughbred performer is put through its paces. The foam padding compresses at different rates and includes ergonomic recesses to place passengers in the best possible position. The seats are also fitted with a sophisticated electrically-controlled tilting system, which will be discussed in the section on comfort. 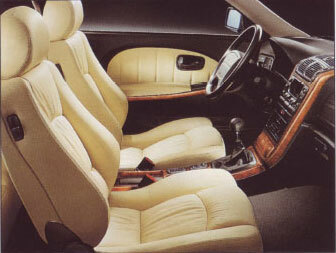 The equally comfortable, all-enfolding rear seats have been produced in accordance with the most up-to-date constructional criteria and are fitted with an anti-submarining beam in the frame (to hold passenger in place in case of a crash), removable cushion, removable central arm rest and ski compartment closed by a flap. 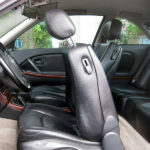 A high seat-belt attachment leaves room for a system designed to extend the belt to occupants to make it easier to grasp. 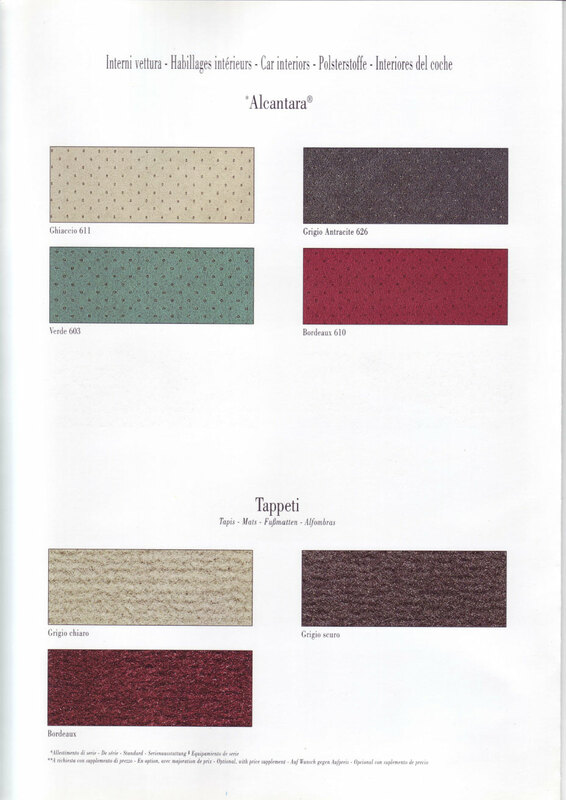 This array of creature comforts is completed by a one-piece carpet with its own mat and driver’s footrest (three colours are available: bordeaux, light grey and dark grey, matched with different seat trims). 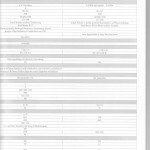 To guarantee all the performance requirements are delivered, customers are offered three petrol engines derived from the saloon units. 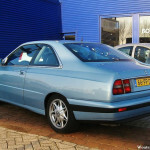 These include a 175 bhp 2.4 five cylinder, 20 valve unit with manual gearbox; a 204 bhp 3.0 V6 24v with automatic transmission and a 205 bhp 2.0 four cylinder turbo 16v with manual gearbox.To guarantee all the performance requirements are delivered, customers are offered three petrol engines derived from the saloon units. 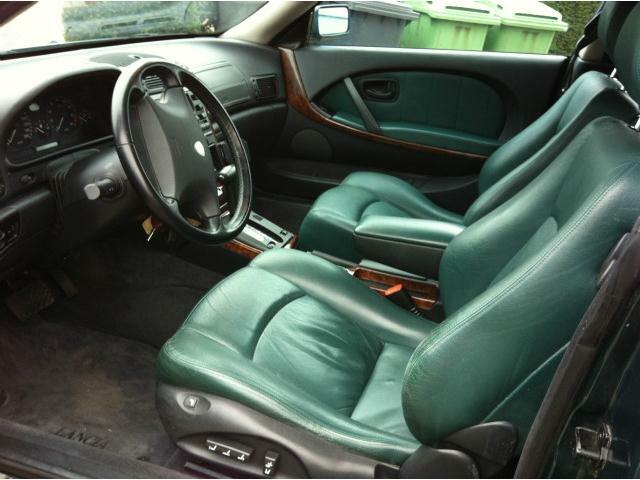 These include a 175 bhp 2.4 five cylinder, 20 valve unit with manual gearbox; a 204 bhp 3.0 V6 24v with automatic transmission and a 205 bhp 2.0 four cylinder turbo 16v with manual gearbox. These power units offer different technical specifications and characteristics, but share the same attributes of power and reliability. Because the capacity is divided between five cylinders, this unit is lively and flexible. Interestingly enough, it also features a variable length intake manifold and very compact combustion chambers, which confer great flexibility, better pickup and a smooth torque curve at low speeds. 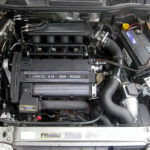 A product of state-of-the-art engineering, the 2.4 five cylinder 20 valve unit features a ductile cast iron crankcase (lighter and quieter) with cylinder liners designed to improve cooling, a crossflow cylinder head, self-regulating hydraulic tappets and electro-hydraulic variable valve timing. 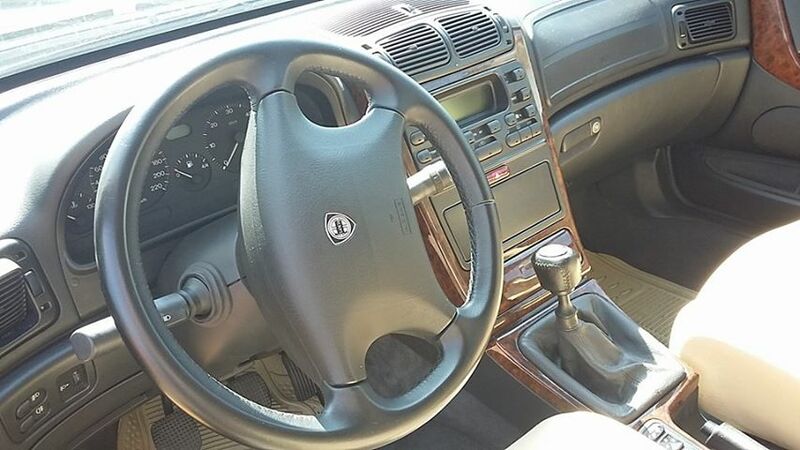 The timing and drivebelt tensioners are automatic, the ignition system has individual coils per cylinder and the unit is also fitted with twin knock sensors, latest generation Motronic ignition, air flow meter with thick film sensor. Built for peak performance, the 205 bhp 2.0 turbo unit gives the Coupé a top speed of 235 km/h, accelerates it from 0 to 100 km/h in 7.3 seconds and covers a kilometre from a standing start in 27.5 seconds. When picking up from 60 km/h in fifth gear, this engine is capable of allowing the car to cover a kilometre in 31.2 seconds. 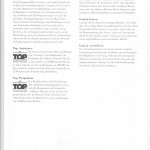 Fuel consumption figures are 7l per 100 km at 90 km/h, 9l at 120 km/h and 11.2l/100 km over an urban cycle. This engine owes its prompt responses to the very low moment of inertia offered by the T25 turbine. 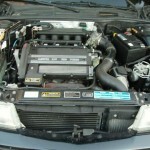 The unit also offers excellent intake fluid dynamics (turbocharging efficiency and fuel returns benefit as a result) two ignition coils per cylinder pair (for greater system reliability), a new Motronic injection setting (to improve low speed driving, with performance unchanged at high speeds) plus a particularly efficient and quiet catalytic converter. 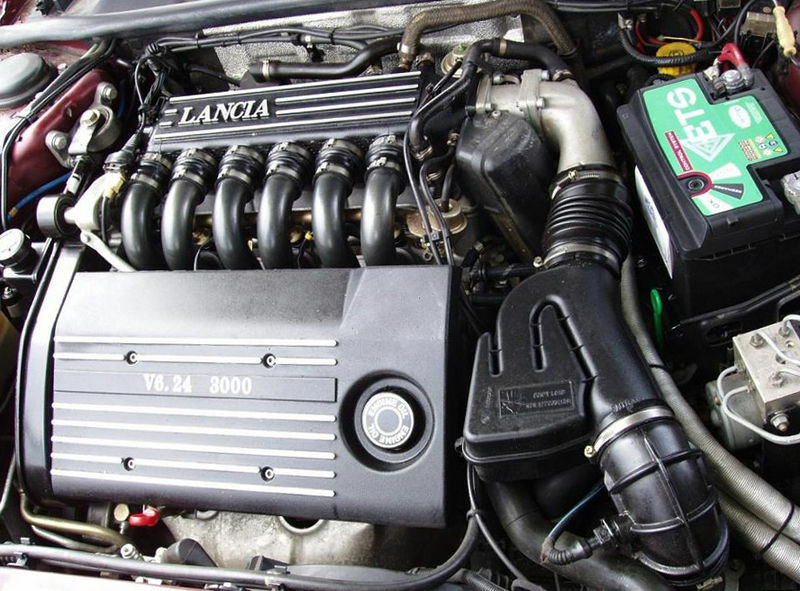 The array of Lancia k Coupé engines is completed by a 204 bhp 3.0 V6 24v unit, capable of giving the car a top speed of 220 km/h. When propelled by this engine, the new model accelerates from 0 to 100 km/h in 9.8 seconds and from 0 to 1000 metres in 30. 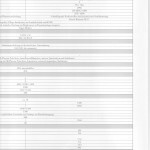 Fuel consumption figures are 7.5l/100m at 90 km/h, 9.5 l at 120 km/h, and 13.9 l/100 km over an urban cycle.. 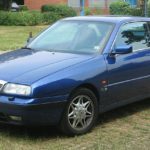 The three litre, six cylinder Lancia k Coupé features an aluminium crankcase, cast iron cylinder liners, monobloc cylinder head in aluminium alloy and four overhead camshafts, which operate four sodium filled valves per cylinder by means of hydraulic tappets. 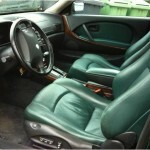 The injection system is a phased sequential Motronic type, complete with static ignition and individual coils. 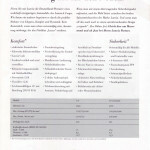 The long-lasting spark plugs are fitted with twin platinum electrodes. 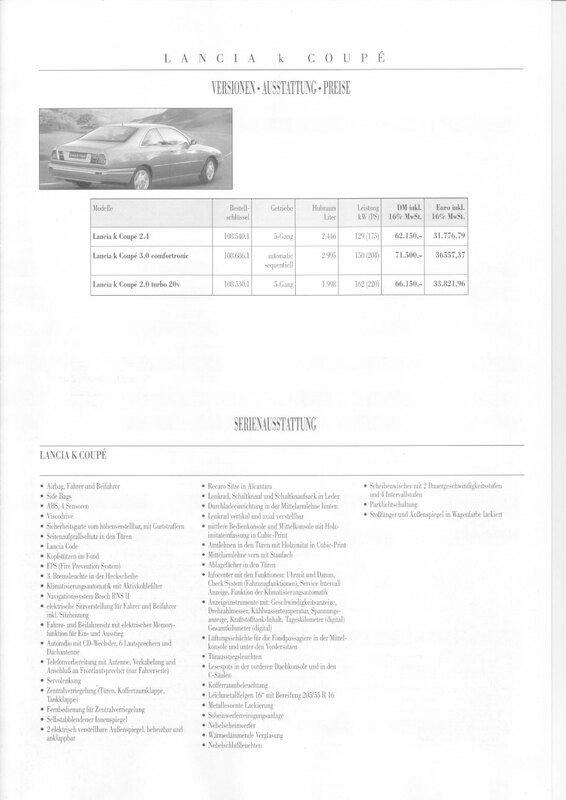 These few specifications should be enough to tell you that this superbly engineered power unit is able to offer superlative Lancia-style driving satisfaction to even the most demanding customers. This approach is confirmed by the fact that the power unit is paired with an electronically controlled four-speed transmission (ZF 4HP 18). 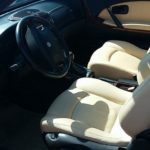 This solution means that gearbox, injection and ignition are all integrated to ensure the car responds more promptly and smoothly to the accelerator. 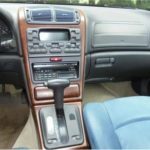 The transmission can also be set to three different settings so that engine potential can be exploited to the full under all conditions. When set to Normal, the gearbox offers a very comfortable drive and good fuel economy, while still allowing lively take-off to be alternated with stretches of smooth driving on long trips. 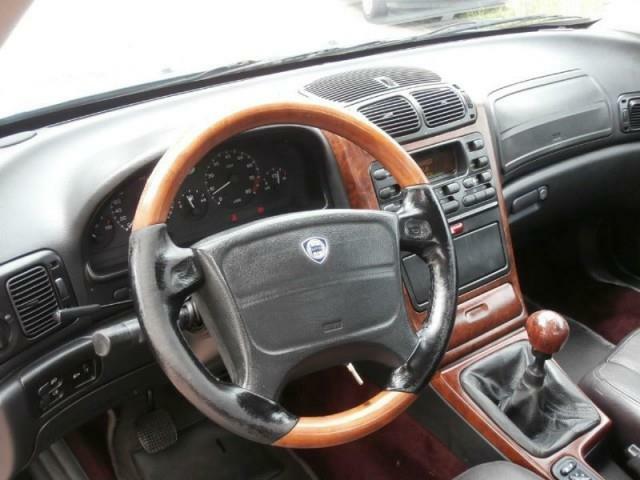 Power is the setting of choice when higher power is required and the driver wishes to exploit all the drive torque of this six cylinder Lancia to the full. The Ice setting makes for an easier drive when the road is slippery and particularly in snow and icy conditions. 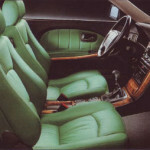 One would naturally expect a car of this class and prestige to meet the most severe international safety regulations. 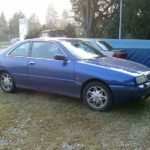 The Lancia k Coupé does not disappoint and passes all the most severe tests, including front and side impact, door intrusion and roll-over tests with flying colours. 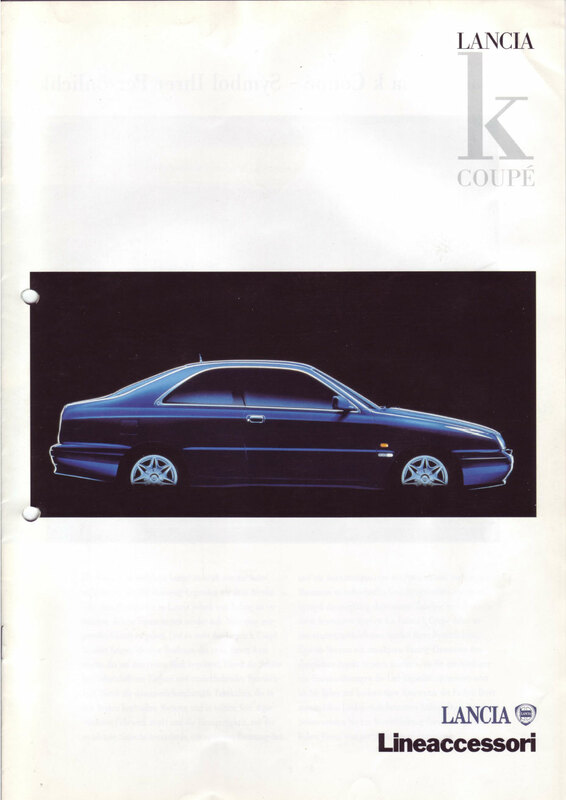 It is worth emphasising that the torsional rigidity of the Lancia k Coupé is 160,000 kgm/rad, i.e. 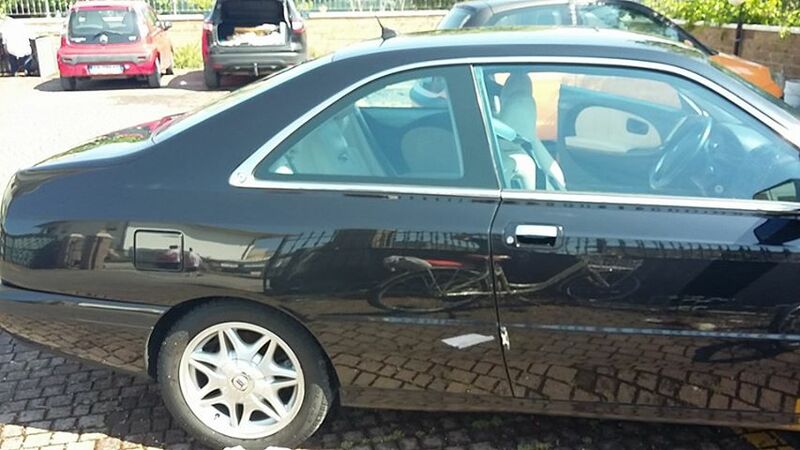 higher than the already excellent result achieved by the saloon, while flexional rigidity is 800 kg/Nm. A vehicle can only offer total protection to its occupants when all safety aspects are covered (preventive, active and passive). 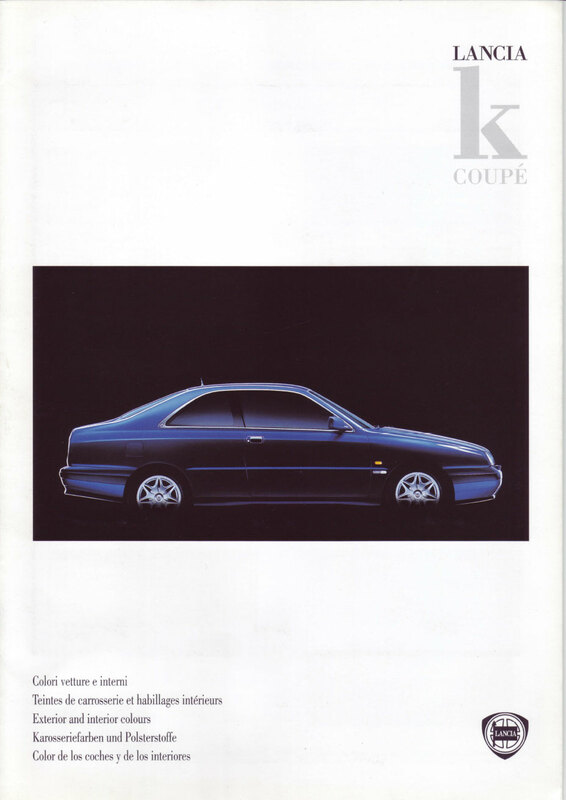 In this sense, the Lancia k Coupé leaves no stone unturned. 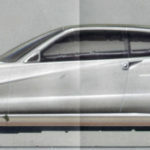 The car is fitted not only with ABS as standard and highly efficient suspension capable of stabilising the car even when grip is lost in a corner, but also such details as a narrow third brake light built into the screen printing at the top of the back window in order not to limit visibility. 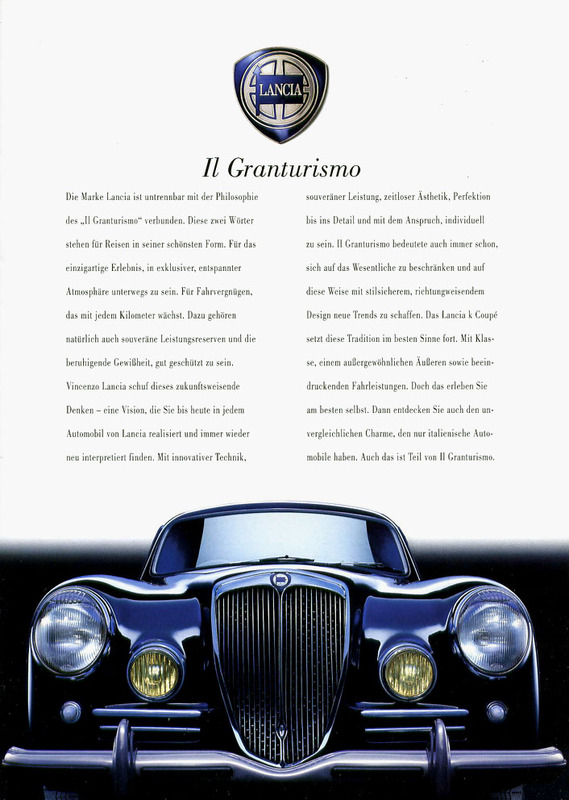 The Lancia k Coupé is shortly to be offered in most European markets with another innovative option important for car safety (only sold in Germany to date): gas discharge headlamps improve the quality of emitted light. The bulbs of gas discharge headlamps are brighter than conventional bulbs, distribute the light beam more effectively and last longer. The customary filament inside the bulb is replaced by two electrodes spaced a few millimetres apart and immersed in low pressure xenon gas. 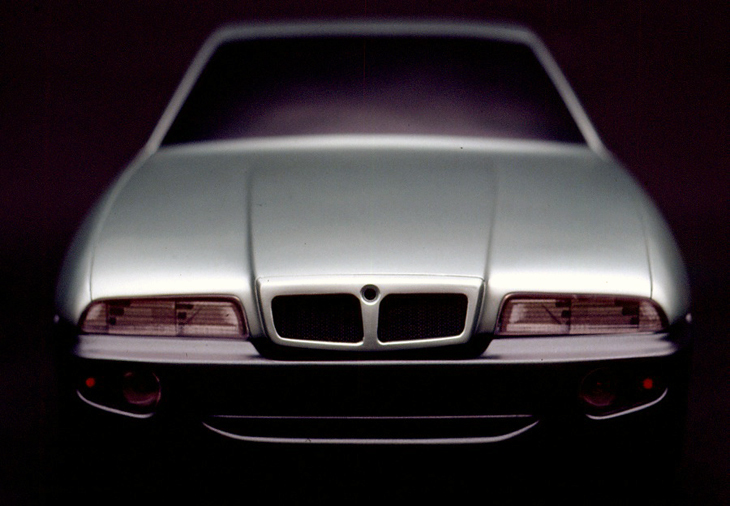 The results achieved by gas discharge headlamps compared to conventional headlamps may be summed up by a few statistics: light beam brightness doubles from 1,500 to 3,000 lumen, efficiency almost quadruples from 25 lumen per watt to 85, while duration doubles from 1,500 to 3,000 hours. 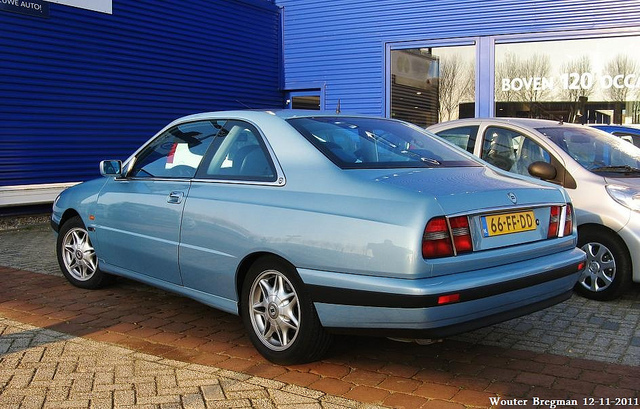 It goes without saying that a great Coupé derived from a flagship and made by Lancia is bound to offer excellent overall comfort. 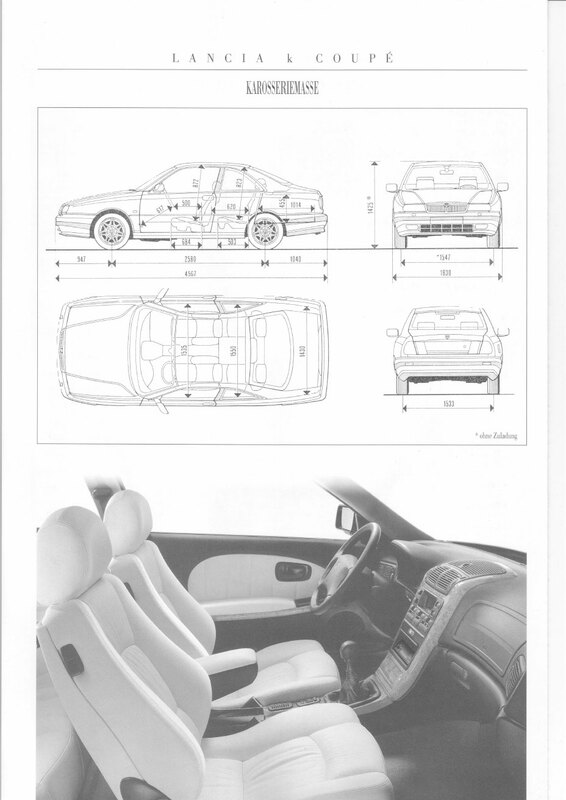 In this car, the quest for outstanding driver and passenger comfort has been met by innovative and sophisticated technical solutions and unprecedented attention to detail. 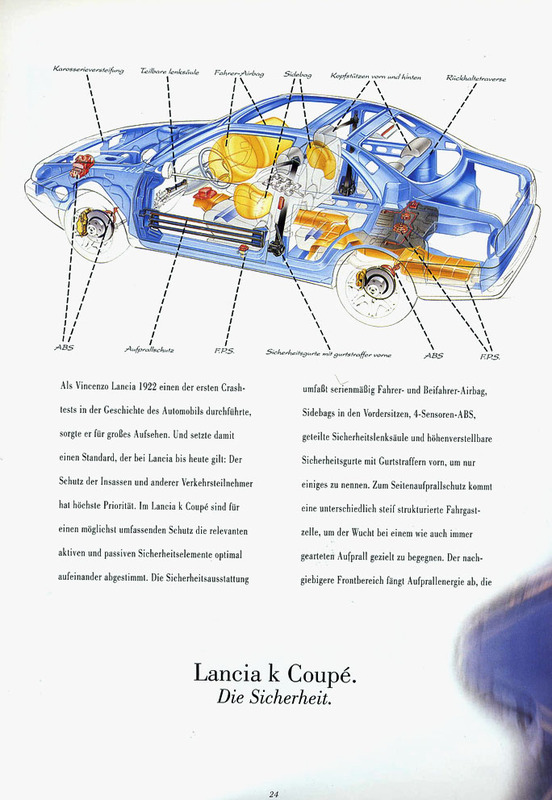 On the Lancia k Coupé, a vibration-free drive is ensured by the characteristics of a body built with above-average torsional and flexional rigidity, as we have seen. Wind noise has been eliminated. 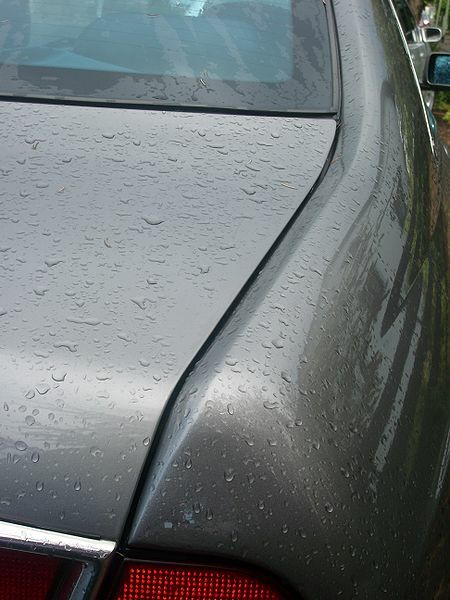 Lipped seals beneath the doors extend to meet the sheet steel side strip, while a clever automatic system at the top ensures the side window fits neatly into the upper seal. 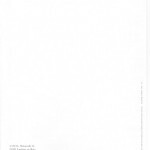 This system is operated by an electric control unit. 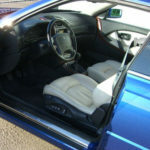 When the door is closed, it is pushed up a few millimetres to engage with the upper door compartment seal and thus ensure a perfect seal against air, water and noise when the car is in motion. 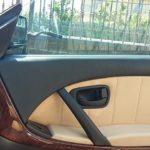 When the door handle is released to allow the occupants out of the car, the window drops automatically by the few millimetres necessary to allow the door to be opened. 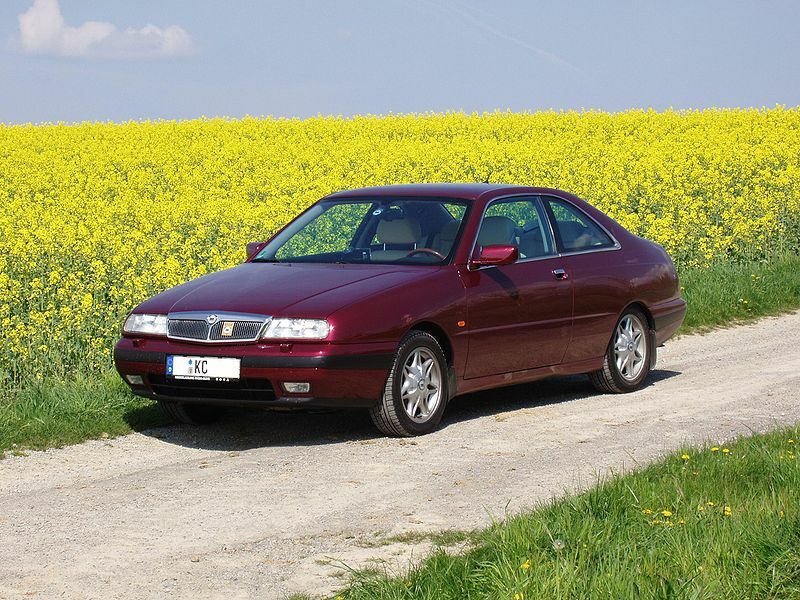 To ensure the highest level of climatic comfort, the Lancia k Coupé is equipped with an automatic climate control system with pollen filter, together with a system of large outlets. These can easily be positioned in any direction. 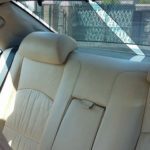 All the vehicle windows are made out of high absorption Solextra glass able to minimise heat transmission inside the passenger compartment. 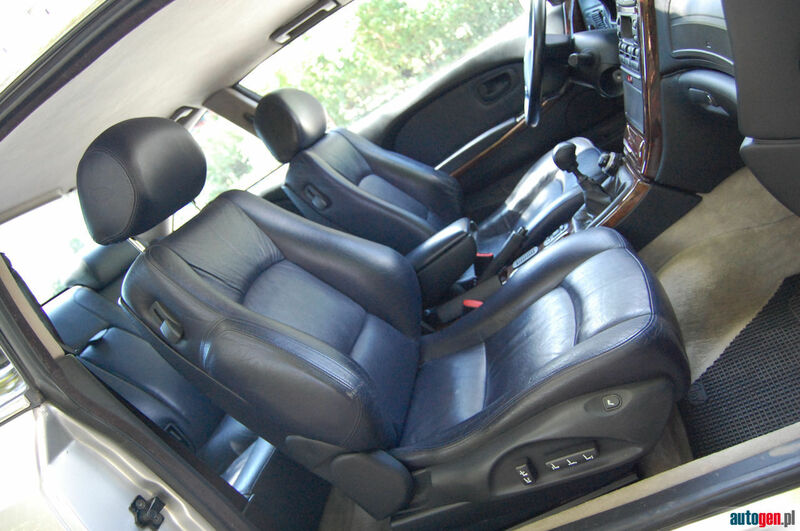 Car comfort also means a roomy environment with a well-proportioned ergonomic interior. 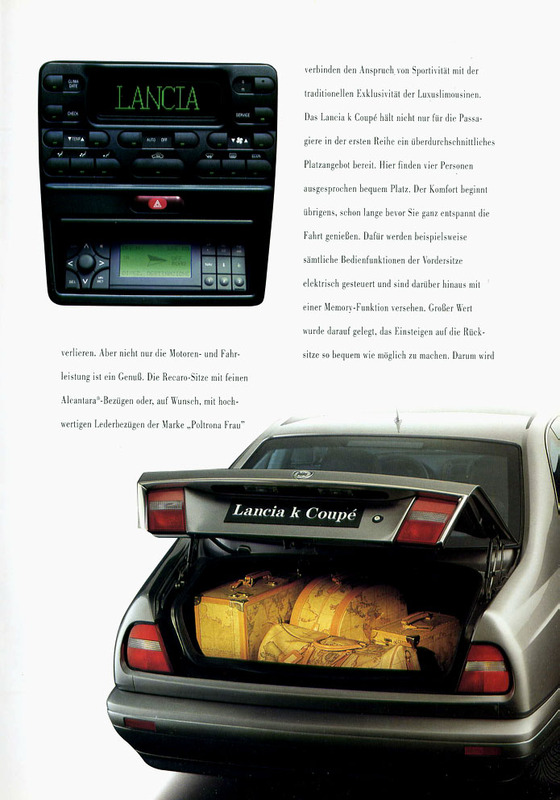 The Lancia k Coupé ensures plenty of passenger room (1490 mm at the waistline, 872 mm in height and 832 mm in length) and plenty of luggage space (500 l, like the saloon). 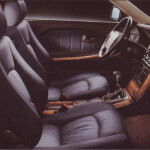 Comfort also means being able to get in and out of a car easily without any effort, even when passengers are in the back seat of a two-door Coupé. 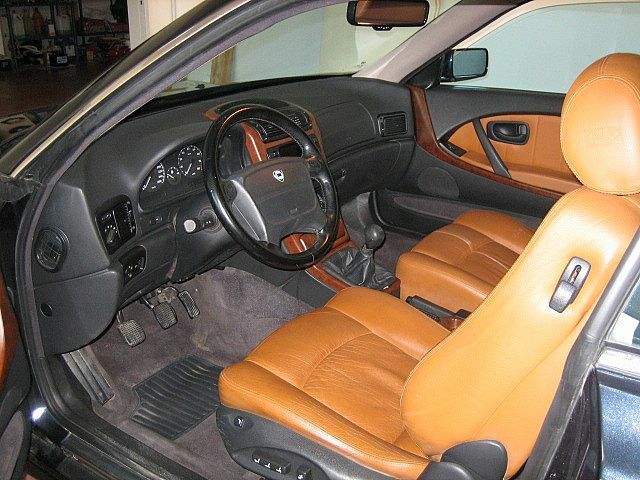 This operation normally involves folding the squab down and pushing the front seat forward (and releasing the front seat from its guides in the process). On the Lancia k Coupé, however, the seat is moved forward automatically by an electric motor when the squab is pushed down. 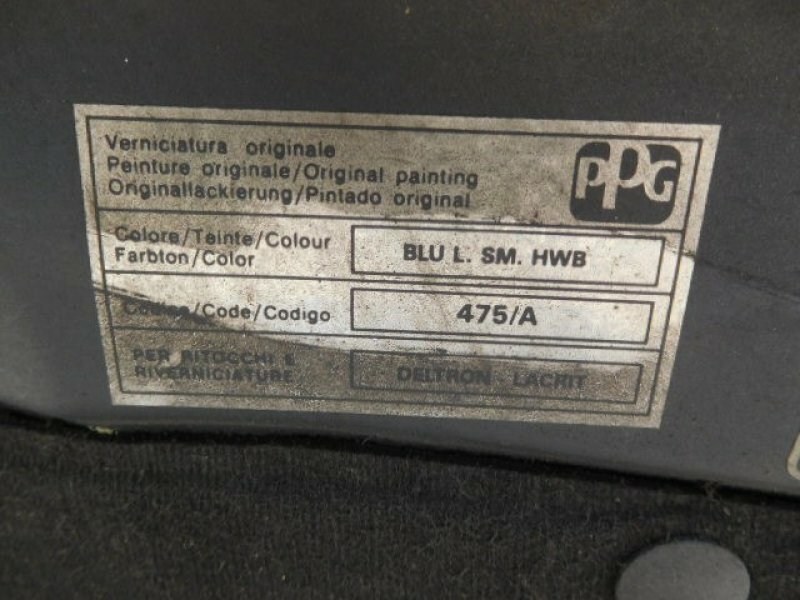 When the squab is returned to an upright position, the seat returns to the original starting position stored in its memory. 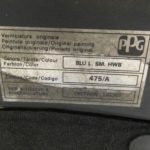 The system is safe as well as useful and convenient because if the seat encounters any obstacle when moving forward or backward, it locks and moves 15 mm in the opposite direction. 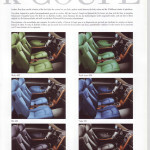 All other settings of the Lancia k Coupé front seats are electrically controlled, as one would expect. 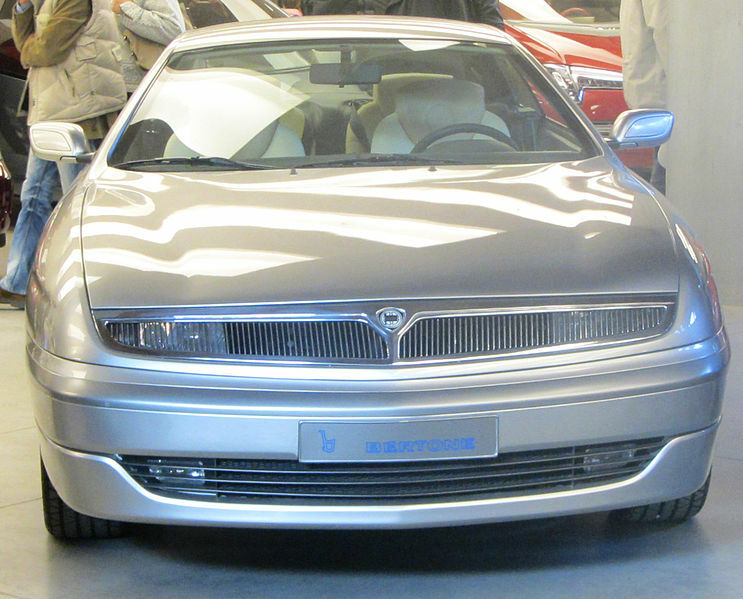 This unique car is special even for a Lancia k: the Coupé comes in just one version. 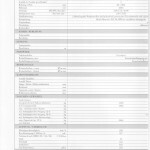 This offers one of the most comprehensive specification packages on offer, with the following available as standard: driver and passenger airbag, automatically operated anti-glare rear view mirrors, headlamp washers, foglamps, automatic climate control system, provision for a car radio with eight speakers and amplified aerial with several filaments sunk in the back window, provision for a radio-telephone with aerial and hands-free connection on the speaker, remote controlled door opening and closure and exclusive design light alloy wheels with wide tyres. 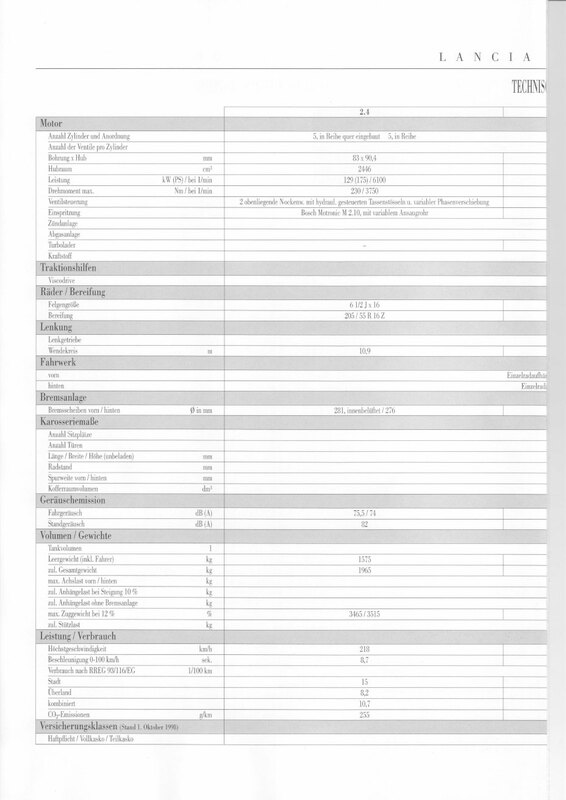 The option list has accordingly been pared down to the following: electrically-operated sunroof, anti-theft device, radio with CD player, gas discharge headlamps (already discussed), Poltrona Frau Kaleidos leather interiors (described later) and electronically controlled damping. 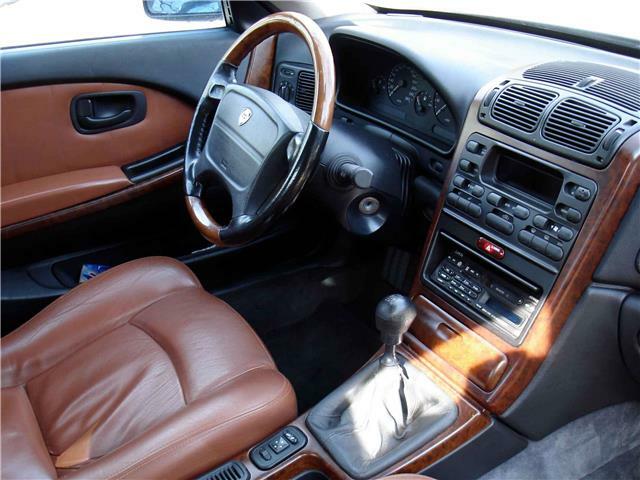 The latter system, (complete with special dampers), adopts different settings in accordance with vertical body acceleration, steering wheel rotation angle and speed, car speed and braking action. 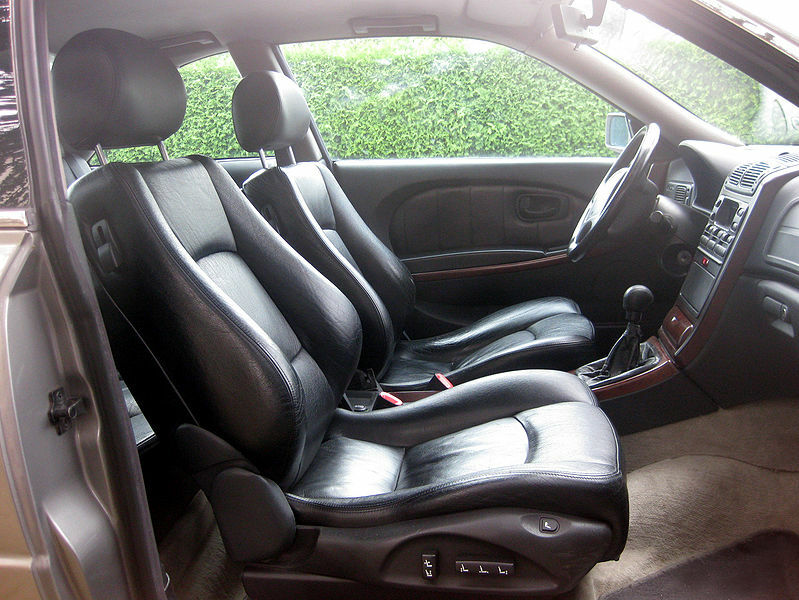 It can be set to two position: “Auto” to automatically ensure the most effective compromise between comfort and safety under all conditions; and “Sport” to ensure maximum safety during a sporty drive at any speed. 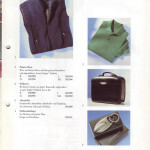 A host of accessories may be selected to satisfy personal needs and tastes. 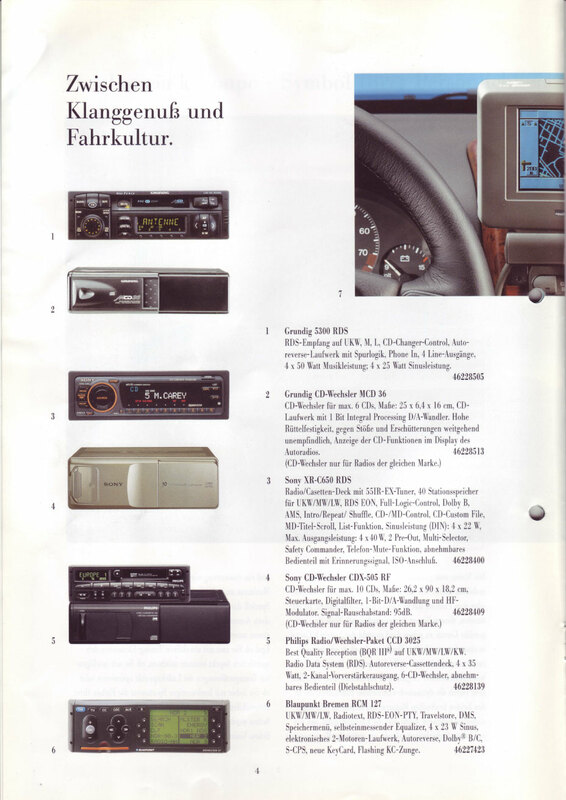 These are divided into the categories “hi-fi”, “utility”, “aesthetics”, “safety” and “promotional items” and include highly sophisticated devices such as Viasat, an innovative satellite-locating safety and rescue system marketed and controlled by Viasat Assistance and Route Planner, a sophisticated electronic navigation device from Magneti Marelli. Viasat is an advanced device controlled by the GPS (Global Positioning System) satellite network and capable of providing an exact geographical position at any time. 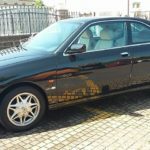 It also allows the car to be traced if stolen and ensures that rescuers can find the correct position immediately in the case of breakdown or accident, or if the driver becomes ill. 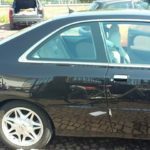 The device communicates with an operating centre which acts as a bridge to the satellite system, through a small terminal in the car. The rescue system is activated automatically if the car crashes or an attempt is made to steal the vehicle. 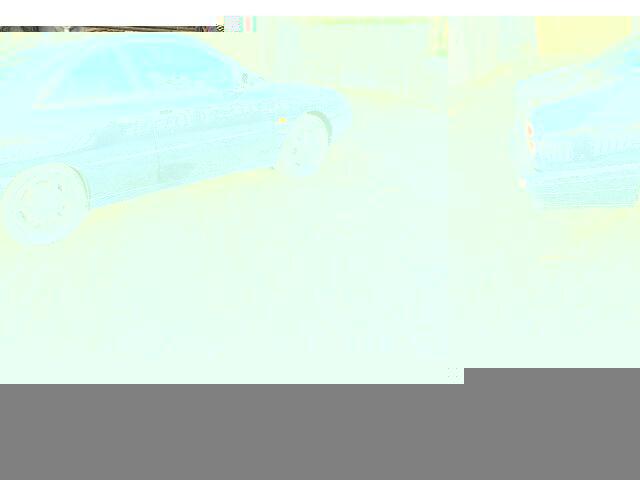 The device can also be set off voluntarily by the driver when in difficulty. 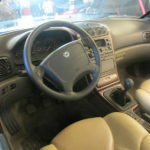 The driver can use a key-pad with function keys to request assistance manually, and a liquid crystal display showing messages sent to or received from the Centre. 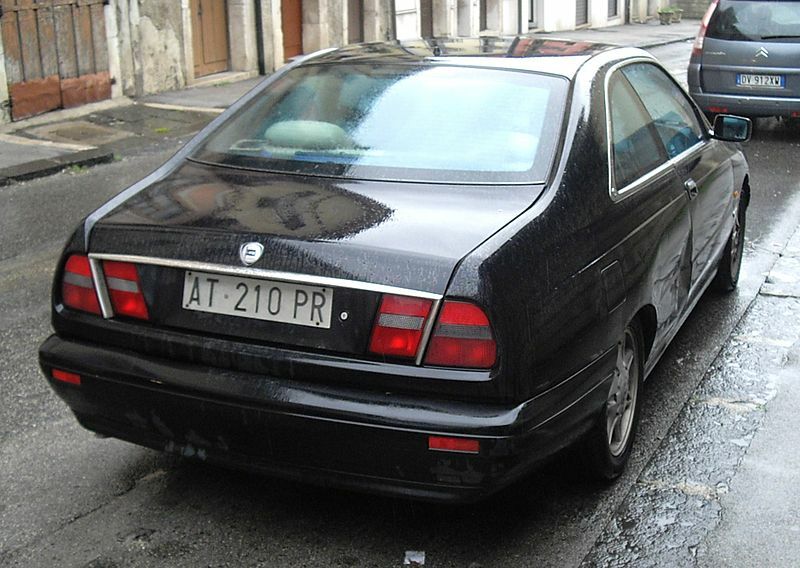 The Viasat key-pad may also be used as a normal fixed car phone. Complete with a hands-free function, it allows the driver to speak to the Operating Centre during assistance and to make or receive personal calls. 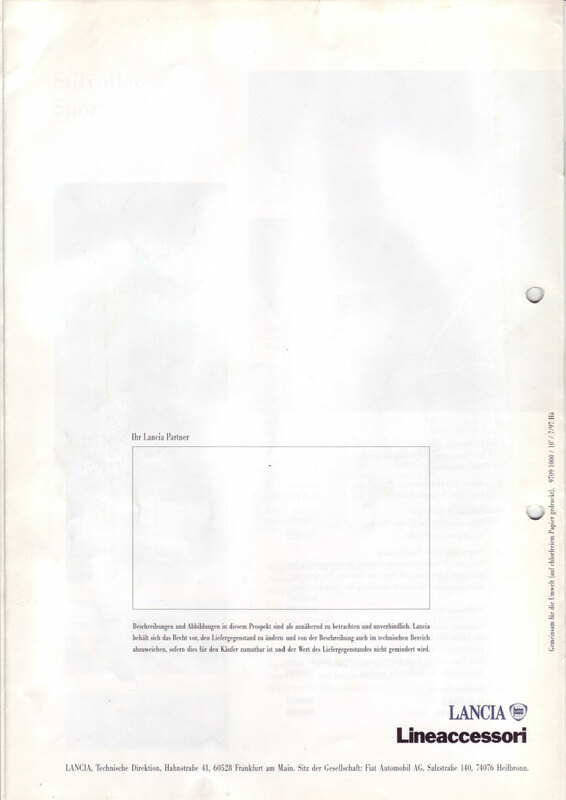 When connected to a personal computer, it may also become a mobile office from which data, programs and faxes may be sent out and received through the telephone network or Internet. The innovative satellite radio location system/service developed by Viasat Assistance offers maximum reliability due to the support of leading companies within various sectors (Nuova Telespazio, Monisat and Europ Assistance). the system can communicate with the Operating Centre at all times due to total coverage: even the most remote locations can be reached by a network of 24 low-orbit satellites. the certainty of being able to count on a year-round, round-the-clock Operating Centre able to intervene anywhere effectively and quickly. 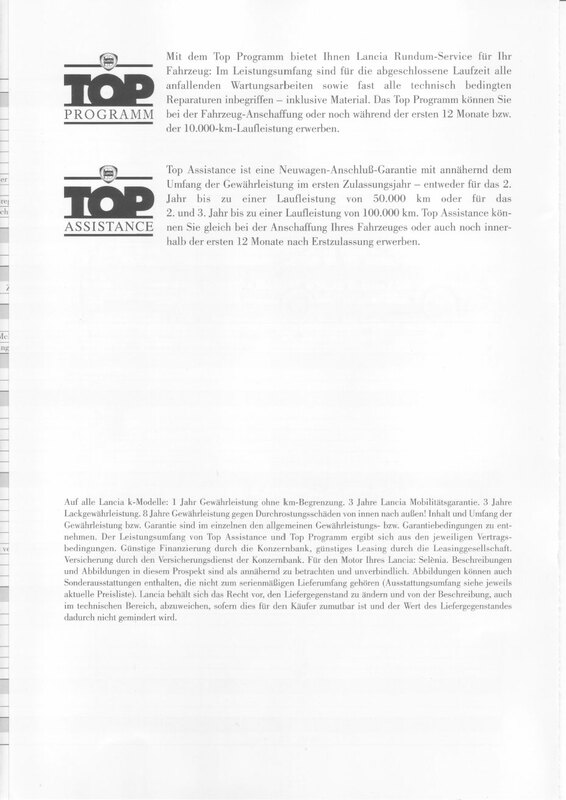 The service offers more than 1000 telephone lines (140 hotlines and links with 18,000 first-aid, roadside rescue and medical centre organisations throughout Italy). 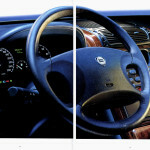 the keypad is simply designed for easy use when the driver is under stress. 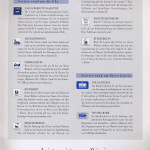 Each rescue service can be summoned by its own button: roadside rescue, medical assistance or assistance against attack. Moving from electronics for emergency use to electronics for everyday use, Route Planner is an ultra-modern navigation system able to steer drivers to any destination as quickly and safely as possible. 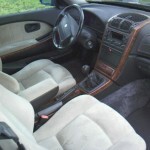 The device acts as a computerised co-pilot keeping the driver continually up-to-date on car position and the best road to follow. 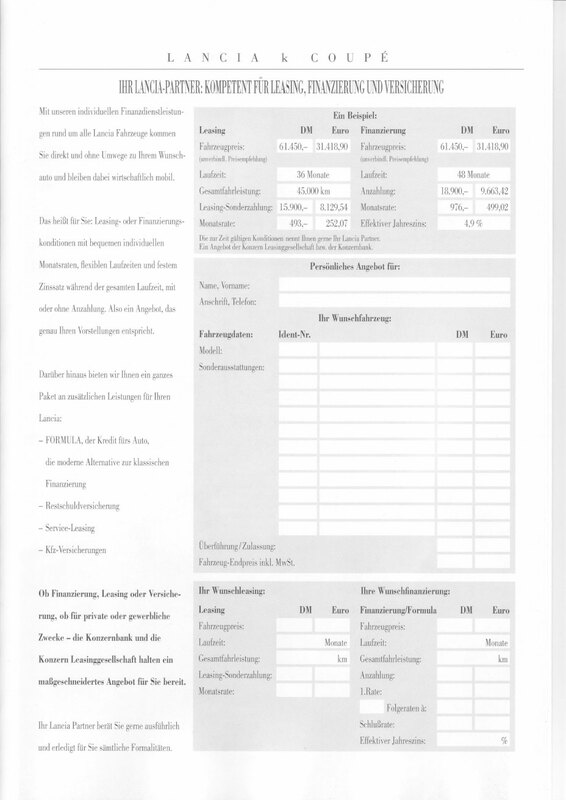 An electronic road map also provides a visual guide.Useful to anyone during holidays or over long, demanding trips on unknown roads, and in particular for people who drive thousands of kilometres a year for professional reasons, Route Planner is also easy to use. 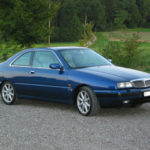 The driver establishes a destination using a remote control device and the car monitor displays a map of the area where the car is currently located showing vehicle position. Until arrival, the motorist is then given advance warning of direction changes using visual and vocal messages (a choice of six languages is available).The navigation system, produced by TECmobility, a unit of Magneti Marelli, also lets the user know where hotels, restaurants, service stations etc. are located. 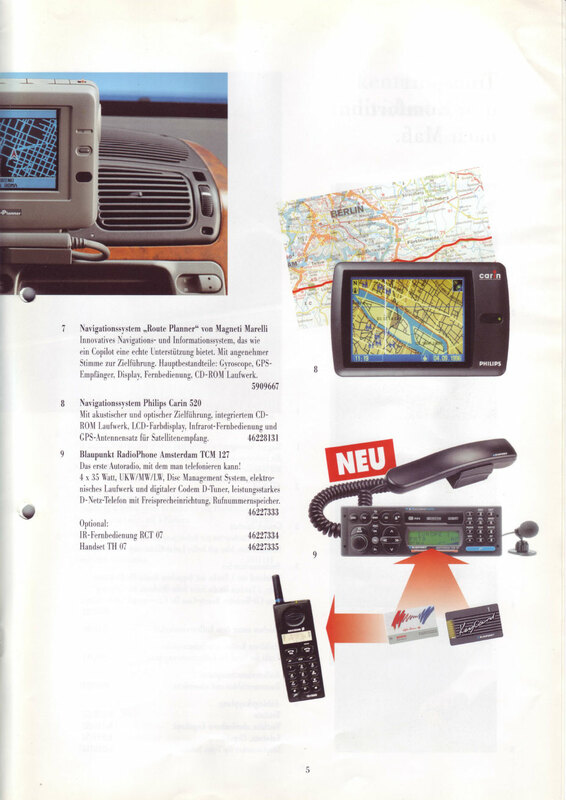 The main components of Route Planner are a gyroscope, (which records the direction of motion), GPS receiver, display, remote control and computer with CD Rom drive. 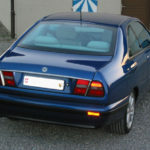 The car computer updates the car’s position continually by combining signals from global positioning system satellites, the gyroscope and the distance sensor. The display (LCD screen with high definition colours) is removable and displays the route and menus for the various functions. The remote control device can be used to activate these functions. 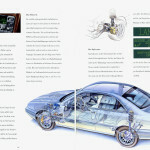 The CD Rom drive allows access to digital maps of road networks and useful services. If the driver deviates from the route indicated by the system, the Route Planner immediately reprogrammes an alternative route. 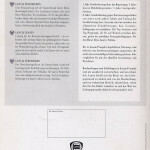 CDs containing route planner maps may also be read using a normal MS DOS compatible personal computer with a CD Rom drive so that trips can be planned at leisure, either at home or in the office. 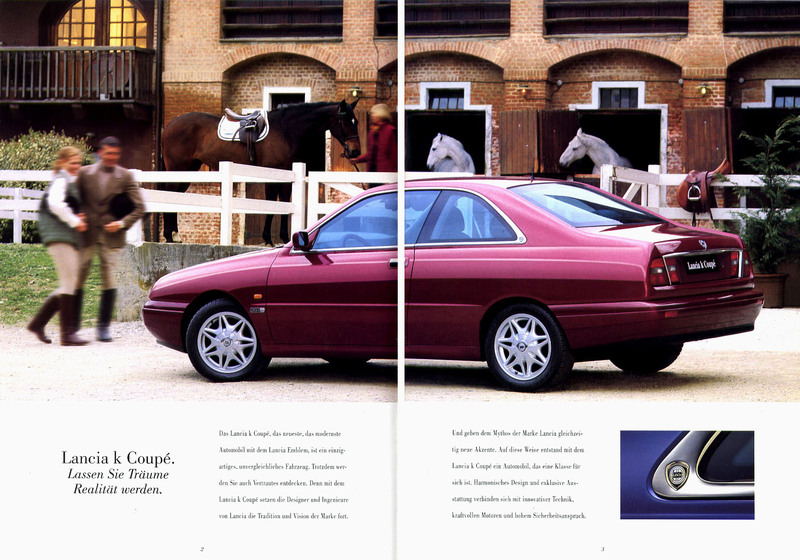 Shapes, colours, materials: each detail of the Lancia k Coupé oozes attention to detail and exclusivity. 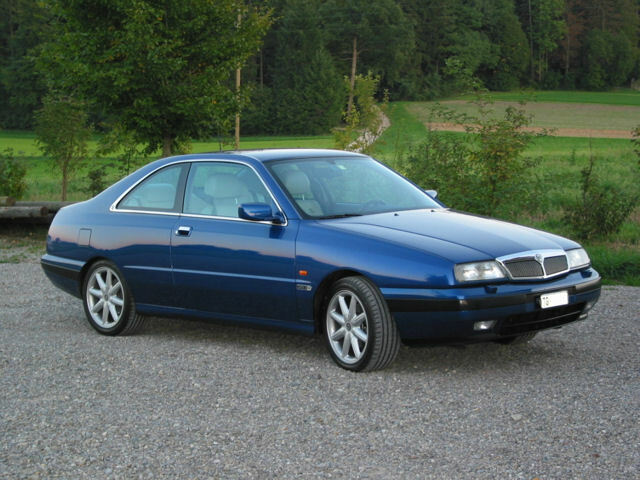 The seven body shades are all metallic (except the traditional Lancia Blue), and all offer glowing brightness and great perspective depth. 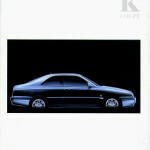 Four colours are reserved exclusively for the k Coupé, as follows: Black Storm, Energy Blue, Power Red, and Saturn Blue. 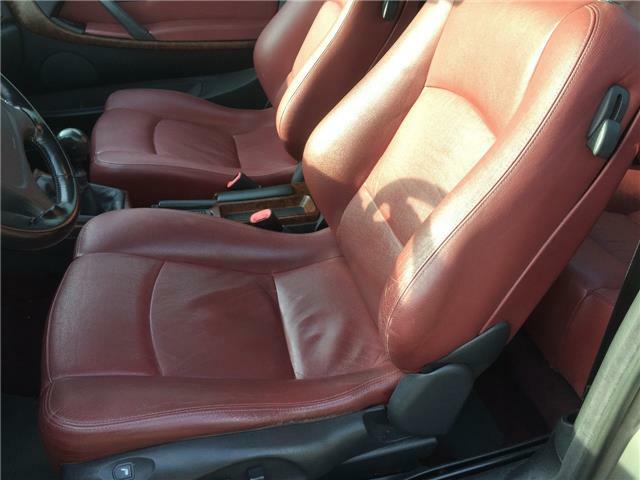 Exterior colours may be combined with seat and panel trim in four shades of Alcantara, also exclusive to this car: green, ice, bordeaux and anthracite grey. 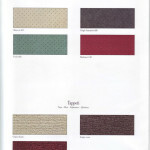 The interior is completed by carpets in three shades, selected for a tasteful match with the other trim. 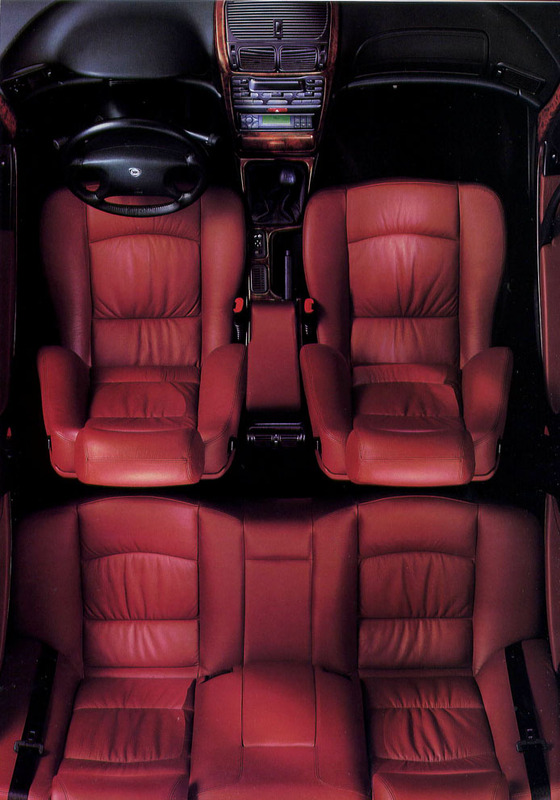 A special mention should be made about the leather interiors, upholstered with craft-standard care by Poltrona Frau for Lancia. 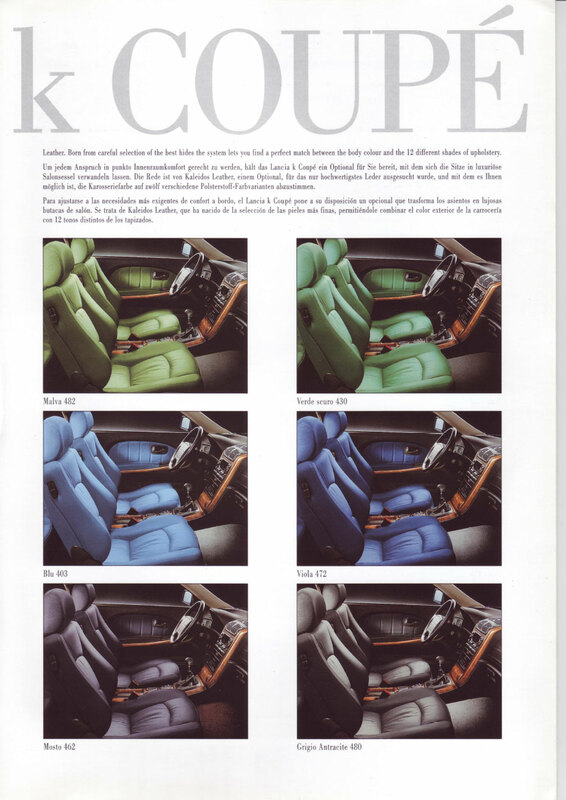 In an unprecedented move, the entire range is included in the Kaleidos leather by Poltrona Frau option, which offers leather upholstery in no less than 12 different colours: now everyone can own their own sophisticated, exclusive and personal Lancia k Coupé. 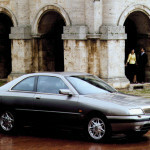 – Lancia k Coupé: on sale since May, it marked Lancia’s return to the prestigious market niche of large saloon-derived coupés. 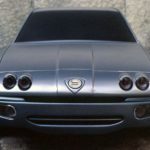 The model completes the Lancia k family, a car with a sophisticated personality which not only competes on a par with the best cars in this élite category, but also adds a little something in terms of comfort, driving enjoyment, safety and the personalisation possible with a range of exclusive options. 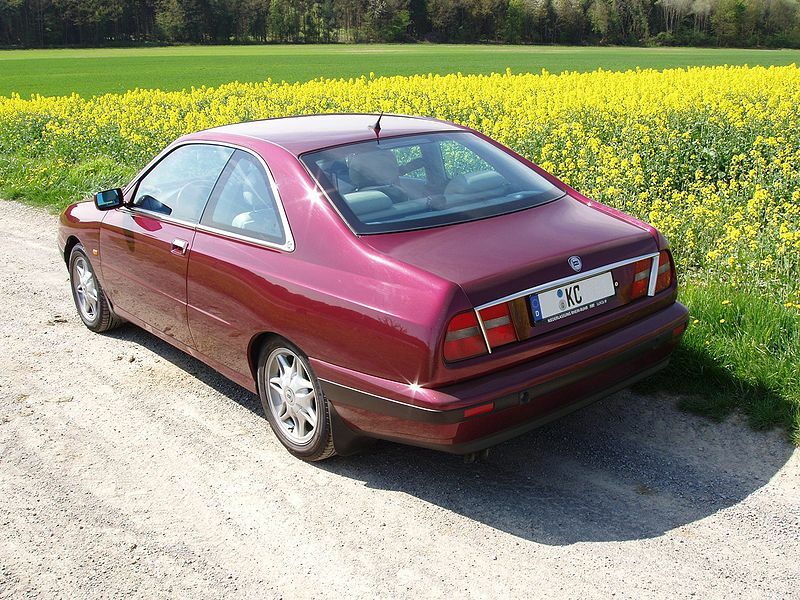 On sale since May, the Lancia k Coupé is the queen of the stand. 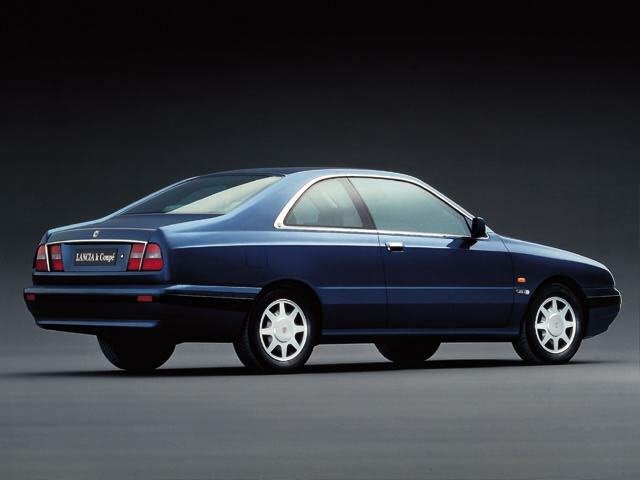 The jewel in the crown of Lancia production, the car that marks the make’s return to the prestigious bracket of large saloon-derived coupés, it nonetheless combines the excellent qualities of the basic model with a strong personality of its own. 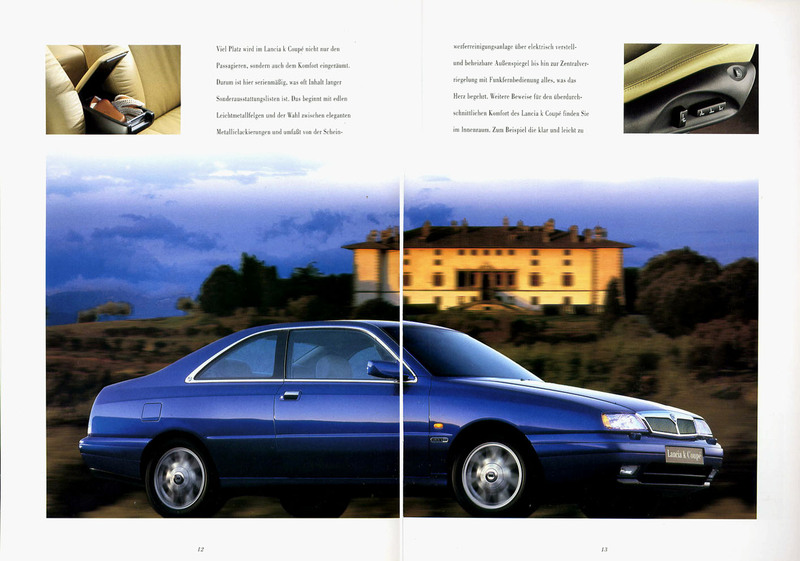 In other words an original line, sophisticated technology (controlled damping suspension and gas discharge headlights), comfort (four comfortable Recaro seats and a boot worthy of a saloon), safety (a torsional rigidity of 160,000 kgm/rad) and the possibility of personalising the car with exclusive options like the 12 colours of the Kaleidos leather upholstery designed exclusively for Lancia by “Poltrona Frau”. 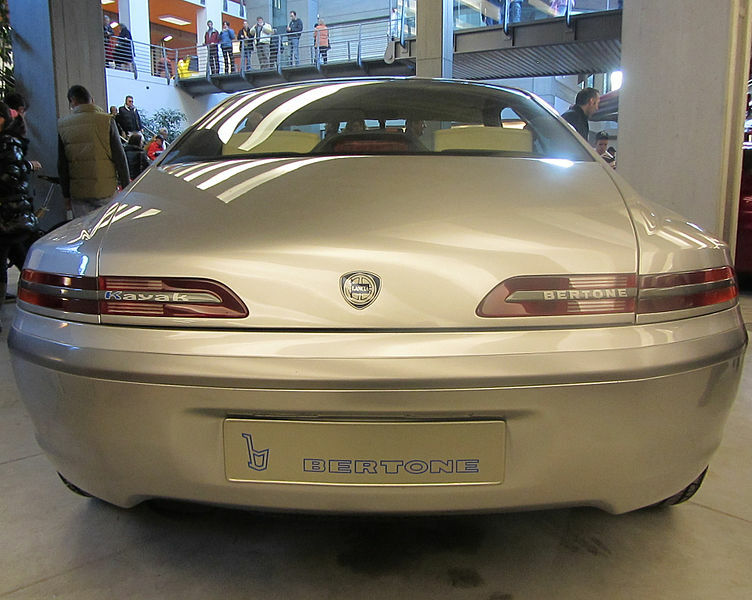 The line is modern, but includes attractive references to classic Lancia styling elements, more evident in the rear which recalls the line of the Flaminia Coupé. 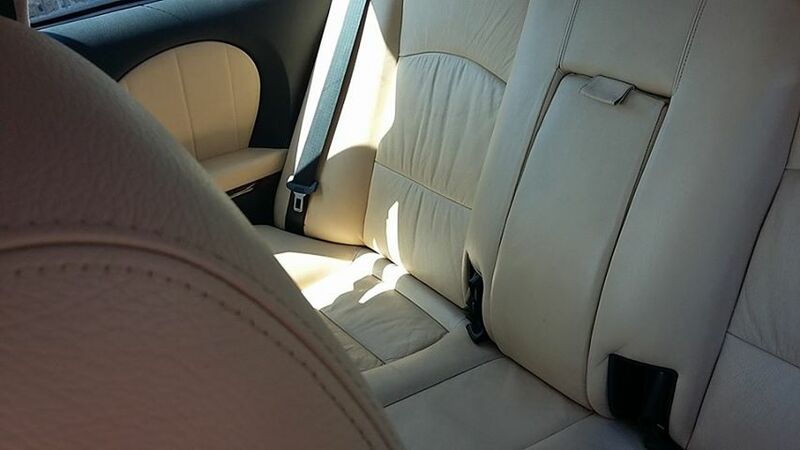 Inside the car one is immediately aware of the atmosphere of refined luxury created by exclusive materials such as Alcantara and Poltrona Frau leather. There is a single specification, on which comfort is a standard feature, in addition to airbags for the driver and passenger, automatic climate control, telephone and radio wiring, remote control door release, light alloy wheels, Recaro electrically adjusted seats with Alcantara upholstery, and metallescent paint. 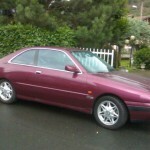 The customer also has a choice of controlled damping suspension, an electric sunroof and futuristic accessories such as Viasat, an innovative safety and satellite location system or the Route Planner computerised navigation system. 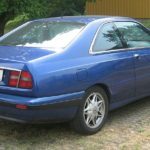 The engines are the most powerful of those on the saloon: the 2.4 five cylinder unit delivering 175 bhp, with mechanical gear shift, the 3.0 V6 with automatic transmission delivering 204 bhp, and the 2.0 four cylinder turbo 16v, producing 205 bhp. 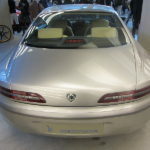 Great attention also went into the details and manufacturing quality of the Lancia k Coupé, a car designed for the more sophisticated motorist. A car built to give the utmost in every area, from performance to comfort, safety and the exclusive outfits, but without losing sight of the sense of balance that is the main quality of a truly high class car. 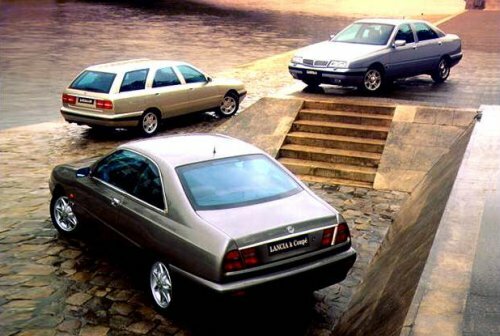 The Lancia k saloon, Station Wagon and Coupé are sophisticated, noiseless, flexible, powerful cars with a vice-like grip on the road destined to carry on Lancia’s long tradition within this segment. 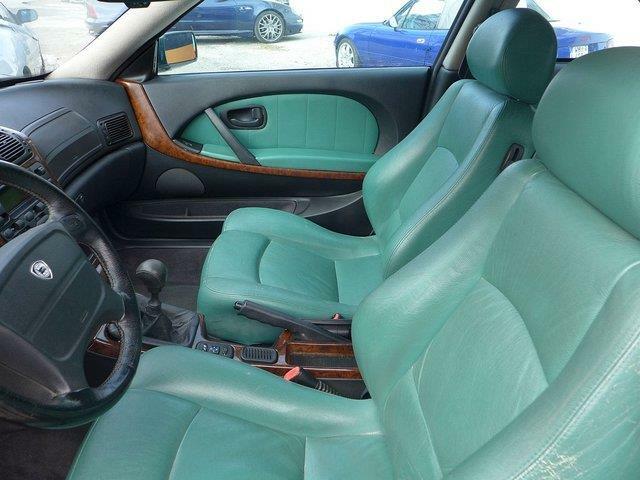 The cars offer demanding customers all the physical and mental wellbeing experienced only on board a car of great style, where the high level of engineering and performance enhance overall comfort. Quality of life on board is assured by the choice of top-quality materials, user-friendly seats and a high level of soundproofing. 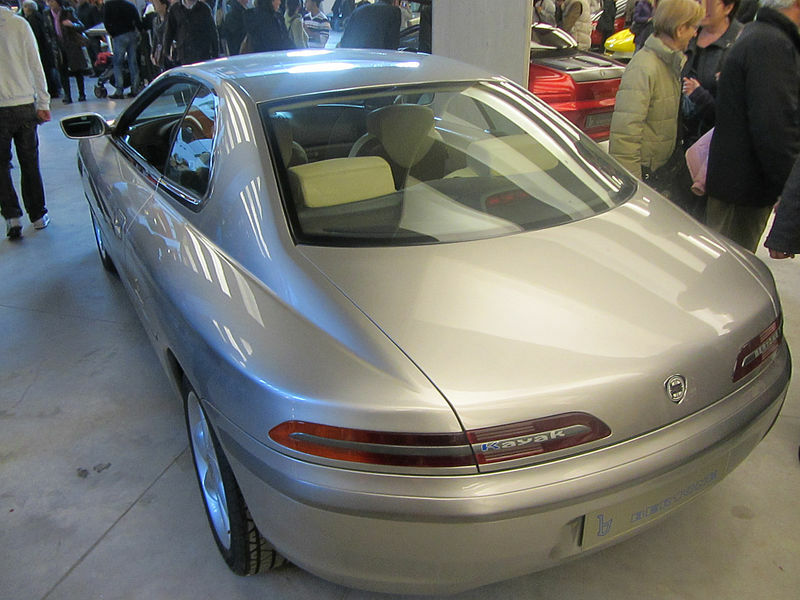 Three models out of the extensive range (22 versions in all) are on view at the Motor Show: the Lancia k 2.0 saloon (LS specification), Lancia k Station Wagon 2.0 turbo and Lancia k Coupé 3.0 LX. 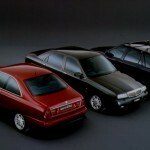 The Lancia k saloon and k Station Wagon are available in five engine versions: a petrol-driven 2.0 five cylinder 20 valve unit (155 bhp-114 kW), a 2.0 turbo 16 valve petrol engine (205 bhp-151 kW), 2.4 five cylinder 20 valve petrol engine (175 bhp-129 kW), 3.0 six cylinder V-shaped 24 valve petrol unit (204 bhp-150 kW) and a 2.4 five cylinder turbodiesel (124 bhp-91 kW). 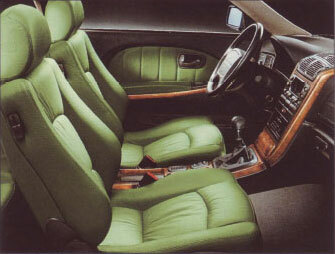 The Lancia k Station Wagon, in particular, features great handling and an outstanding saloon-standard level of comfort. 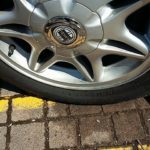 This result has been achieved through the adoption of effective engineering solutions, such as a ‘Boge Nivomat’ hydropneumatic self-levelling suspension system. This is designed to maintain the suspension at an optimum level whenever the load changes. 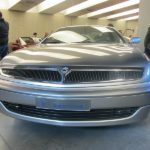 The main attraction on the stand is the Lancia k Coupé, which marks Lancia’s return to the glamorous big saloon-derived coupé subsegment. 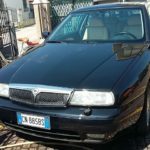 This car is Lancia’s pride and joy and brings its own understated personality to the excellent basic features of the original model. 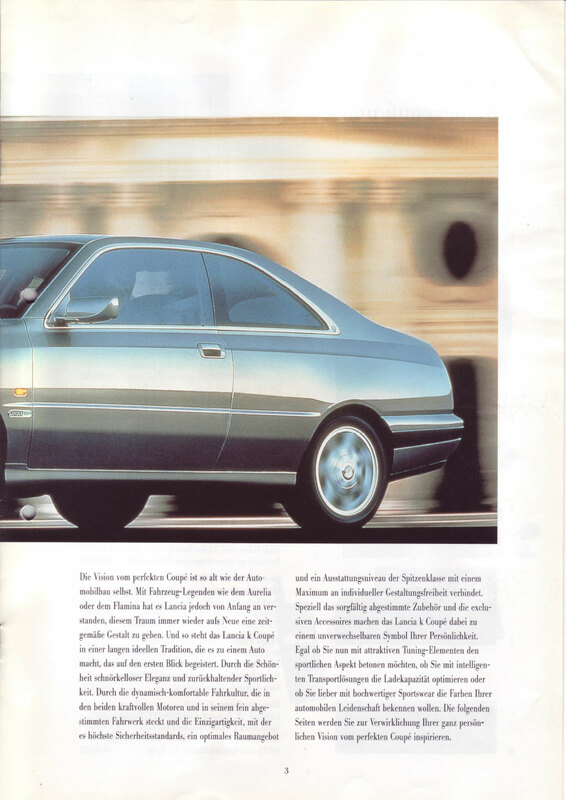 In other words: original styling, sophisticated engineering (controlled damping suspension and gas discharge headlamps), comfort (four can be accommodated in comfort on Recaro seats and the boot is saloon-sized), safety (torsional rigidity of 160,000 kgm/rad) and the possibility of customising the car with truly exclusive options, such as the 12 different kaleidos leather interiors produced specially for Lancia by Poltrona Frau. 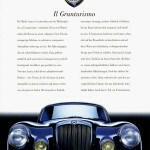 The up-to-date styling includes evocative references to classic Lancia style. 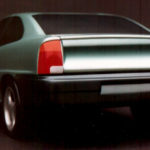 This is particularly apparent at the rear, where the styling is reminiscent of the Flaminia Coupé. 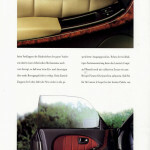 Passengers inside the car imbibe an atmosphere of refined luxury due to the use of exclusive materials such as Alcantara or Poltrona Frau leather. 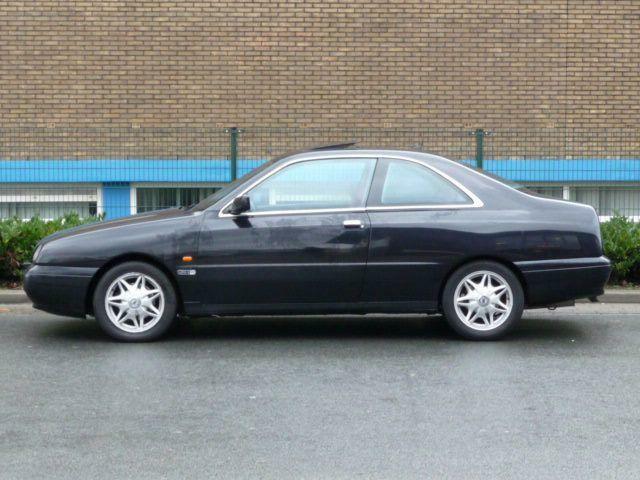 Everything has been achieved without ever losing sight of the sense of proportion typical of a top-quality car. 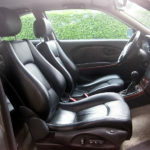 The single specification includes the following standard items: airbags for driver and passenger, automatic climate control system, provision for car phone and radio, remote control door opening/closure, light alloy wheels, electrically-controlled Recaro seats in Alcantara fitted with a special automatic mechanism for better access to the rear seats, and metallescent paintwork. 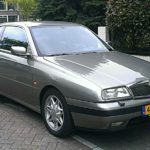 The engines are the most powerful members of the saloon range: 2.4 five cylinder (175 bhp-129 kW, 218 km/h), 2.0 four cylinder turbo 16 valve (205 bhp-151 kW, 235 km/h) and a 3.0 V6 with automatic transmission (204 bhp-150 kW, 220 km/h). 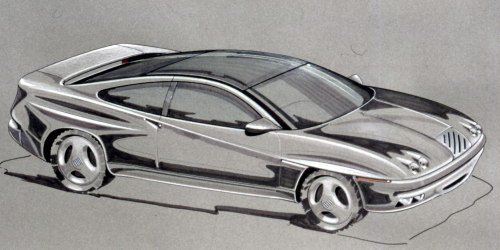 From the Lancia of the future to the Lancia of today. The stand at the 67th Turin International Motor Show also houses the entire Lancia k range: saloon, Station Wagon and Coupé. 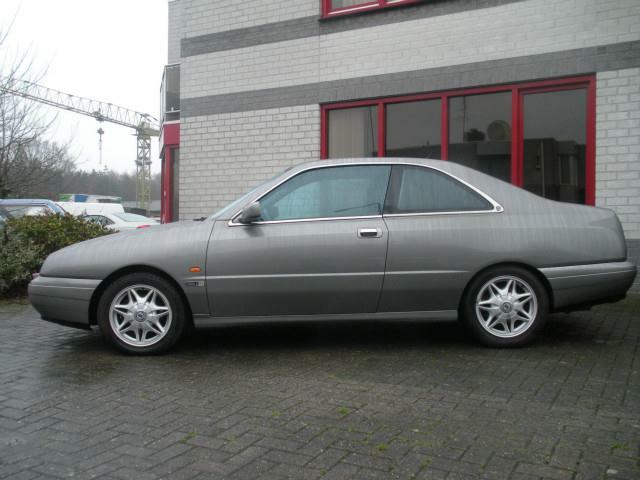 Stylish, refined, reliable cars able to ensure an excellent quality of life on board and great driving satisfaction. 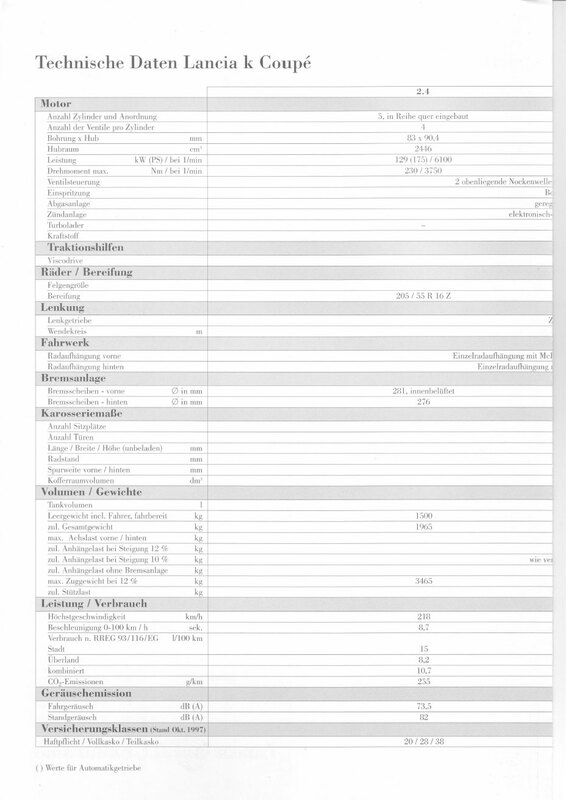 Satisfaction and performance will be raised to even greater heights by the adoption of two new engines: a five-cylindered 2.0 turbo petrol 20 valve unit and the five-cylindered 2.4 JTD. 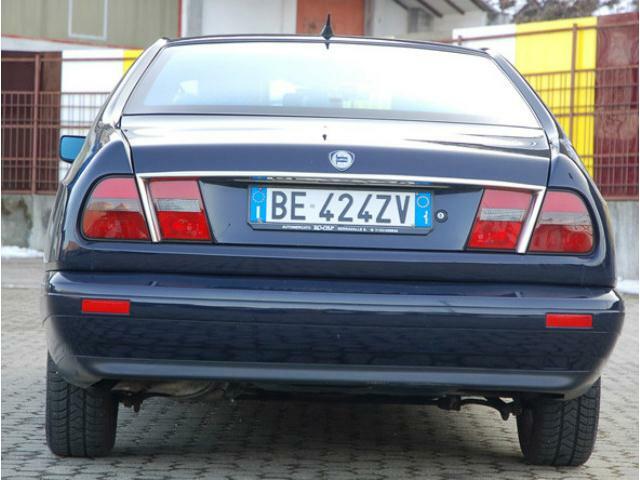 The Lancia versions of these two power units will have their first outing at Turin. 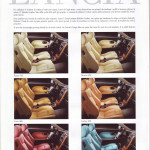 They feature state-of-the-art technology typical of all Lancias. 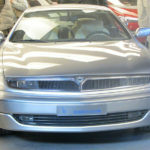 We expect no less from a Marque which is always careful to offer its customers the most advanced engineering solutions. 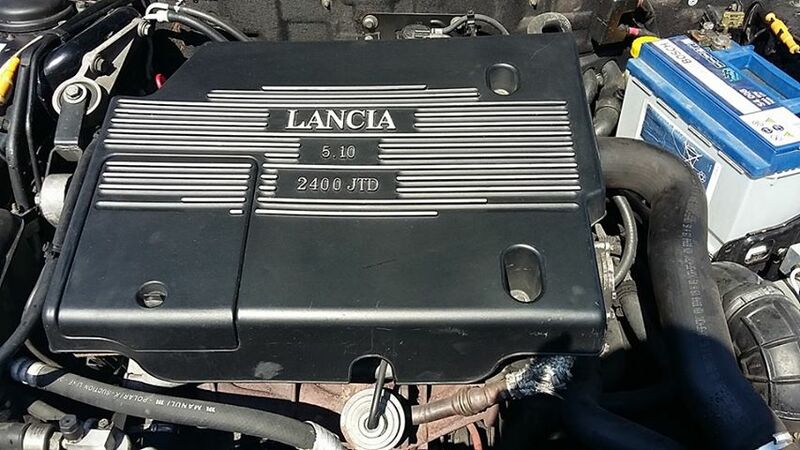 The 136 bhp 2.4 five cylinder JTD engine will be fitted to the Lancia k saloon and Station Wagon. 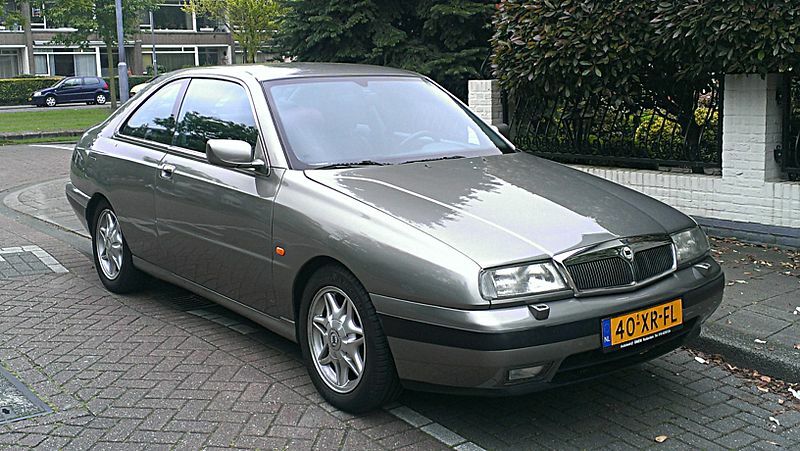 It replaces the earlier 124 bhp 2.4 turbodiesel unit. 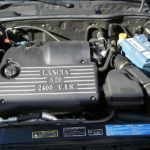 The 220 bhp five cylinder 2.0 turbo 20 valve unit will be available on all three Lancia k models (saloon, Station Wagon and Coupé). 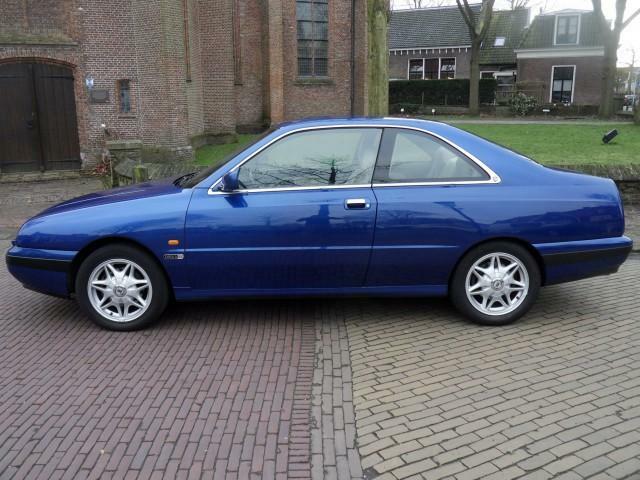 It will replace the current 205 bhp four cylinder 2.0 turbo 16 valve unit. 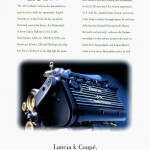 These new engines allow the Lancia k to strengthen its image and extend the range available to its customers. These new powerful and noiseless power units offer excellent performance and superlative driving comfort. 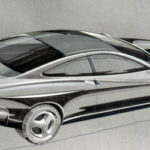 The Motor Show will offer a preview of these versions, which will be available at the end of May in Italy and from the first half of June abroad. 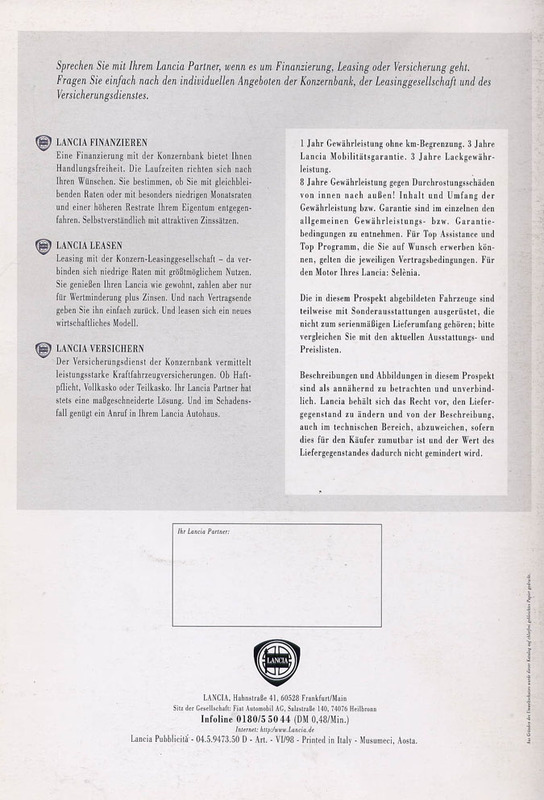 Lancia has always proposed the most advanced engineering and technological solutions and could hardly overlook the revolutionary Unijet direct injection system produced by Fiat research and manufactured by Robert Bosch. 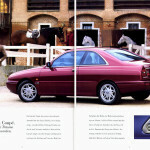 This world first was first fitted to a standard production model with the advent of the Alfa 156. It heralds a new era for diesel engines. Compared to conventional engines, JTD diesel engines run more smoothly, produce fewer emissions and consume less fuel. 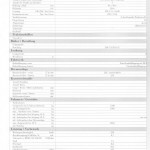 They are also more noiseless (up to 8 dB less) and perform better. 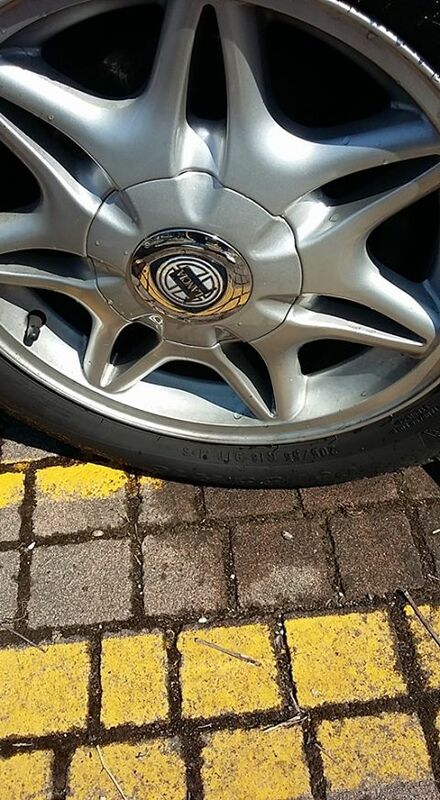 These attributes are perfectly in keeping with Lancia style: its great saloons are designed to ensure élite comfort and great performance – delivered smoothly and gradually. 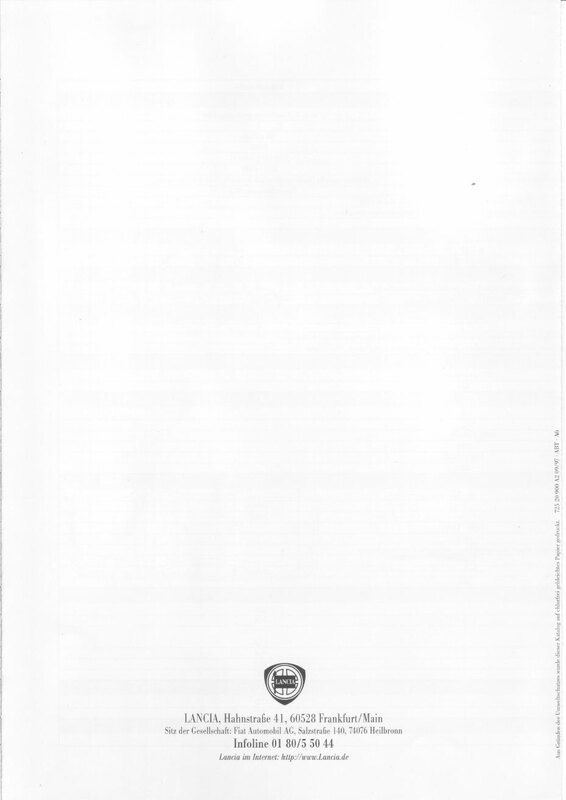 This was the thinking behind the decision to replace the current turbodiesel with the five cylinder 2.4 JTD. The new unit increases power (from 124 to 136 bhp) and torque (from 25.5 to 31 kgm) for improved performance. 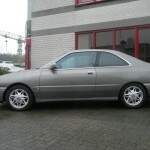 Top speed increases from 193 to 202 km/h and time taken to accelerate from 0 to 100 km/h drops from 10.7 to 10 seconds. Fuel consumption also drops: from 12.6 l/100 km to 10.2 over an urban cycle; from 6.5 to 6.2 l/100 km out-of-town; from 8.7 l/100 km to 7.7 over a combined route. The secret behind the 2.4 JTD’s ability to achieve results that are normally mutually incompatible (increased performance and reduced fuel consumption) lies concealed within the Unijet system. In the new system, injection pressure does not depend on engine rpm but is managed independently by an electronic control system. Pre-ignition also takes place, due to a very short pilot injection of diesel fuel. In current systems (whether prechamber or direct injection type), the injectors are supplied by a mechanical pump (often electronically controlled) and injection pressure increases in direct proportion to engine rpm. This property means that combustion cannot be improved on past a certain level – and the same therefore applies to performance, noise levels and emissions. In the Unijet system, injection pressure is independent of engine rpm and load (accelerator position) because the injection pump generates pressure by build-up. The electronic pump and injector control system also makes it possible to optimise injection pressure and the amount of fuel injected at each engine service point. The electronic control system makes it possible to use very high injection pressure and deliver minimal fuel quantities, i.e. to produce a pre-injection pulse known as a pilot injection. 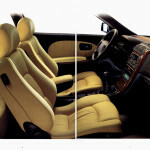 Two features of this system offer great benefits to the driver. The first (build-up) allows more effective combustion and thus improved efficiency and performance. The second (pilot injection) greatly reduces noise and combustion levels. The high pressure value allows a significant reduction in fuel consumption and smokiness, while the pilot injection sets up ideal temperature and pressure conditions in the combustion chamber for the main injection pulse to take place. By preheating the combustion chamber, the pressure gradient throughout the cycle is drastically reduced. This gradient is responsible for combustion roughness and the typical metallic noise produced by conventional direct injection engines. 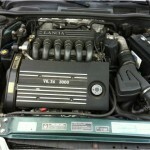 The Lancia k will also now be fitted with a lively five cylinder 20 valve petrol turbo unit. 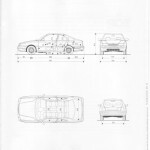 This has been reviewed and adapted by Lancia engineers to meet new requirements. Compared to the previous 16 valve, four cylinder unit of corresponding capacity, the new engine offers higher power (from 205 to 220 bhp), torque (from 30.4 to 31.5 kgm) and top speed (from 235 to 243 km/h). 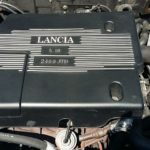 Yet the most telling feature is the delicate work carried out by engineers to adapt the exuberant nature of the engine, so far only used on an out-and-out sports model, to the type of performance customers expect from a Lancia. 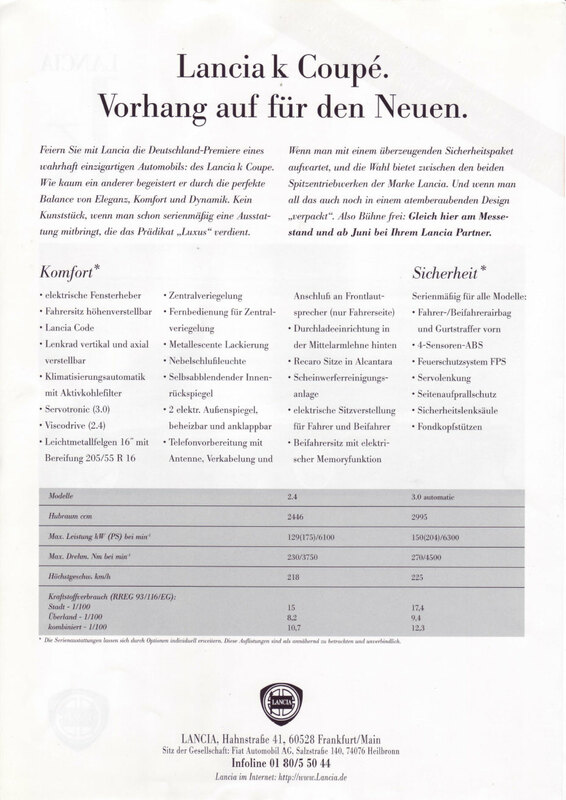 This refinement has been carried out to make power delivery smoother and more gradual while simultaneously improving comfort and noise levels. 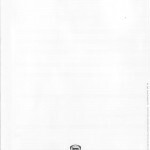 One change has been the adoption of a flexible subframe to dampen noise and vibration transmitted to the body (a new compound has also been adopted to improve the efficiency of the rubber mounting pads). Another new feature is the addition of a split timing system: on the Lancia k, the system is controlled by two belt drivers, one driving the coolant pump and the other driving the auxiliary components. The vane compressor has also been replaced with a much quieter variable displacement unit. 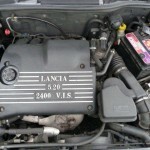 Noise has also been reduced on the Lancia k by a much more rational air supply system. 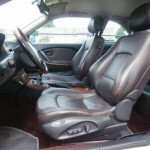 Air is taken in beneath the front beam by a broad manifold and follows a very direct route to the air intake manifold. 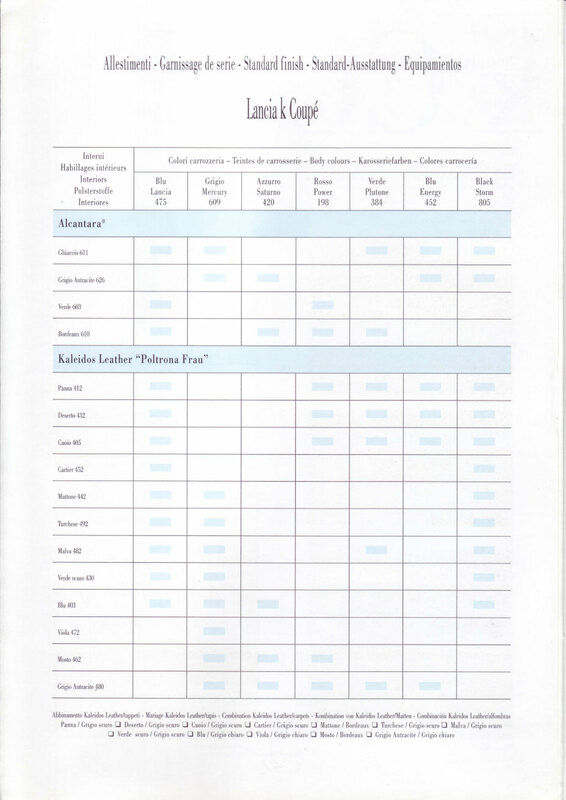 This helps the engine to breathe better (no load is lost) for more efficient, noiseless running. An extra device (quarter wave resonator) has been added immediately after the filter. This reduces the noise of the incoming air column still further. A bigger, highly effective exhaust silencer has also been added. Comfort means silence and lack of vibrations. A dual mass damping flywheel has therefore been fitted on the clutch to reduce cyclic engine irregularities and eliminate all running noise. 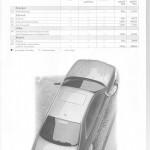 The engine control unit setting has also been changed to ensure a flatter torque curve. The torque figure is unchanged, but delivered in a much more linear and gradual manner. 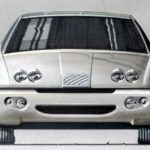 Lastly, the intercooler is specially configured to reduce maximum coolant temperature by four or five degrees (compared to the situation before Lancia intervened) and ensure more effective cooling. 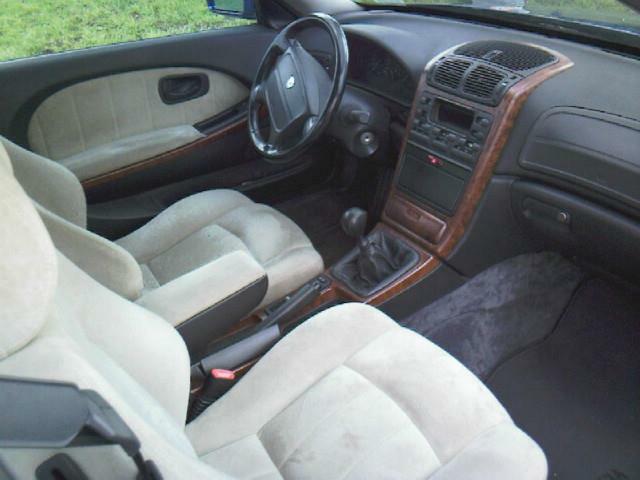 All this benefits reliability and engine life. All this horse power is harnessed to produce a docile power output. 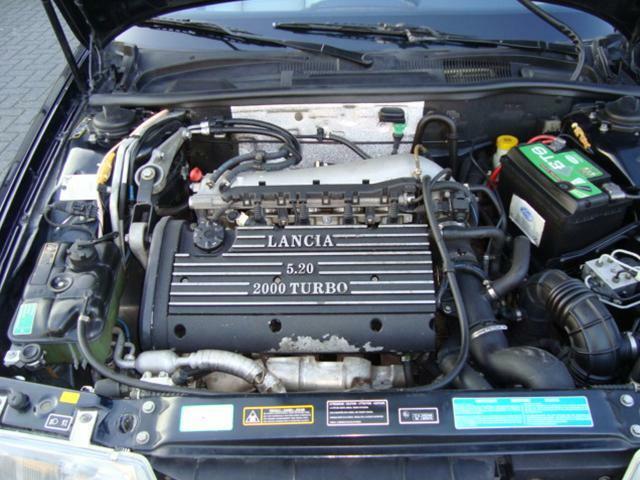 Even cars fitted with the 2.0 20v turbo engine handle well and are as easy to drive as any other Lancia. 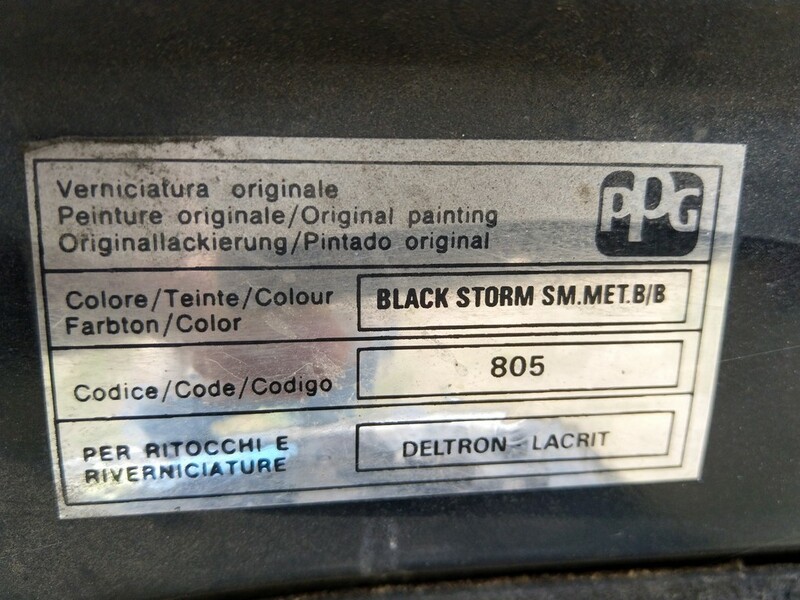 The basic attributes of this power unit naturally remain unchanged. It still offers very smooth running (comparable to the performance of a six cylinder in-line unit) and a sophisticated turbocharging unit: a turbine-compressor system with an incredible air output of more than 700 m3/h. 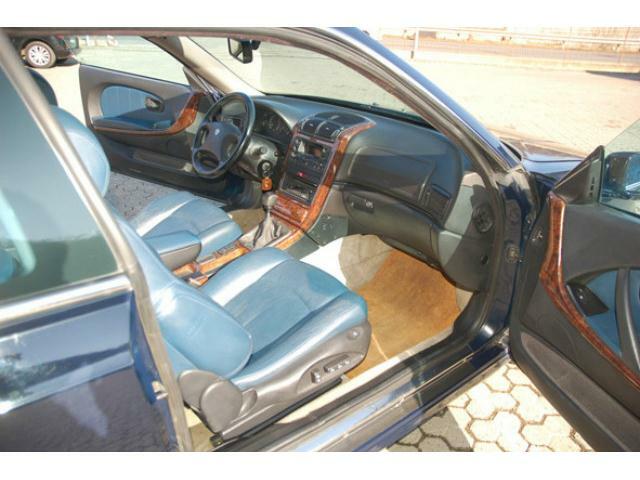 Apart from this, the unit also eliminates turbo-lag, i.e. 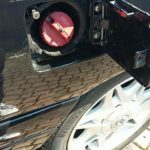 the delayed response typical of many turbocharged engines when the driver calls on the engine to produce power quickly when the engine is running at low speeds. 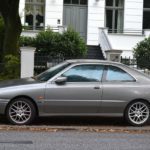 On the 2.0 five cylinder 20v turbo, this fault has been overcome by adjustments to timing, the electronic control unit and also intake and exhaust valve geometry. Turbocharger unit inertia has also been reduced. 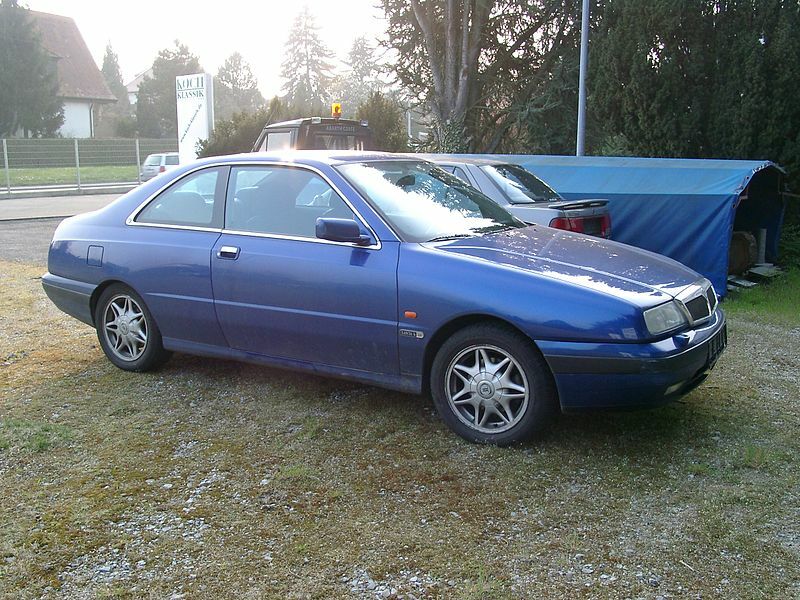 The Lancia k saloon, Station Wagon and Coupé. 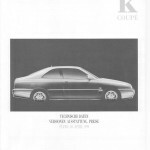 Stylish, refined, reliable cars designed for outstanding motoring quality. The high performance levels will be raised to even greater heights by the adoption of two new engines: the five cylinder 2.0 turbo 20 valve petrol unit and the five-cylinder 2.4 JTD. 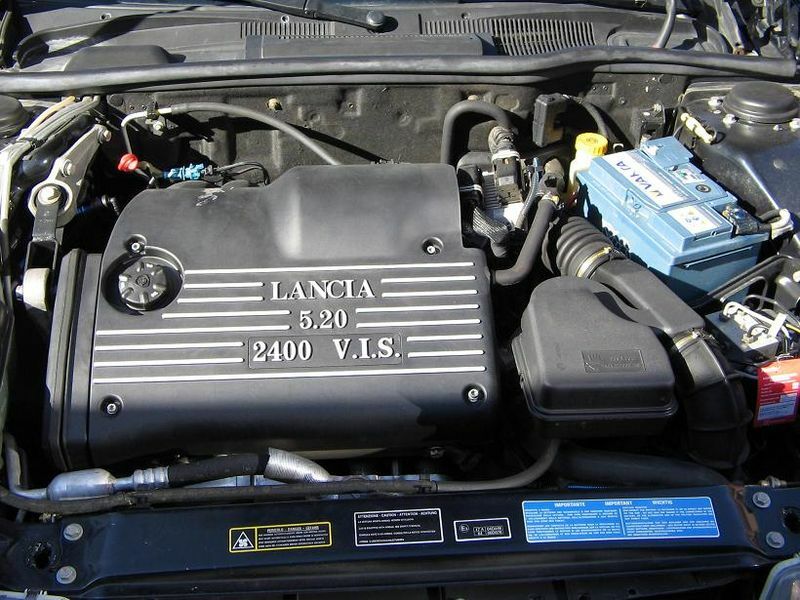 The 2.4 five-cylinder JTD engine is available only on the Lancia k saloon and Station Wagon. It replaces the former 124 bhp 2.4 diesel unit. 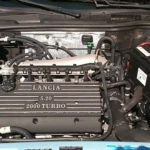 The five-cylinder 2.0 turbo 20 valve unit will be available on all three Lancia k models and will supersede the current four-cylinder 2.0 turbo 16 valve unit. 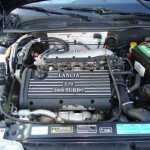 Lancia versions of both these two power units have been previewed at the Turin Motor Show. 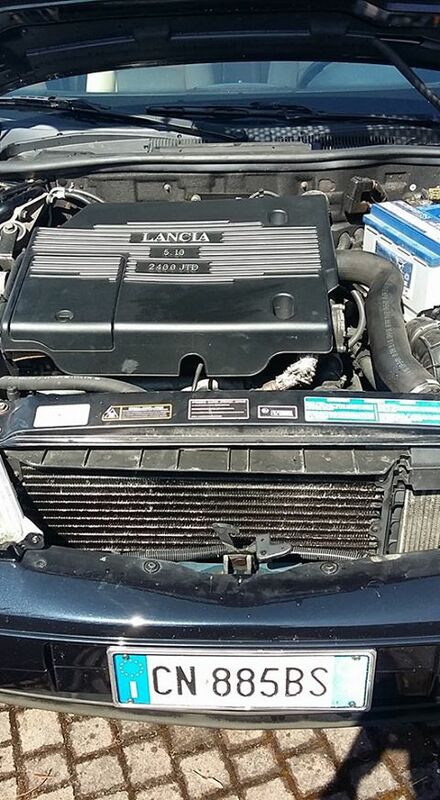 These high-tech engines are part of a great Lancia tradition – because Lancia is always careful to offer its customers state-of-the-art solutions. 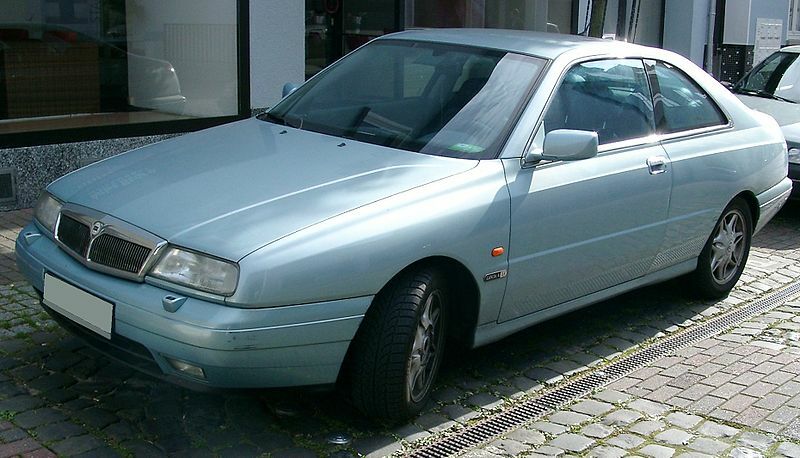 The attractive choice of engines is matched by an equally special array of élite high-tech options: xenon headlamps, radio navigator (the Lancia k is the first Italian car to be fitted with this Bosch device), side airbag and passenger presence sensor, which detects whether the seat next to the driver is occupied and will only allow the front and side airbags to inflate if someone is sitting there. This enticing range of options will be joined in the autumn by other sophisticated devices: a self-adaptive, sequential electronic automatic transmission for the 3.0 V6 engine and cruise control. 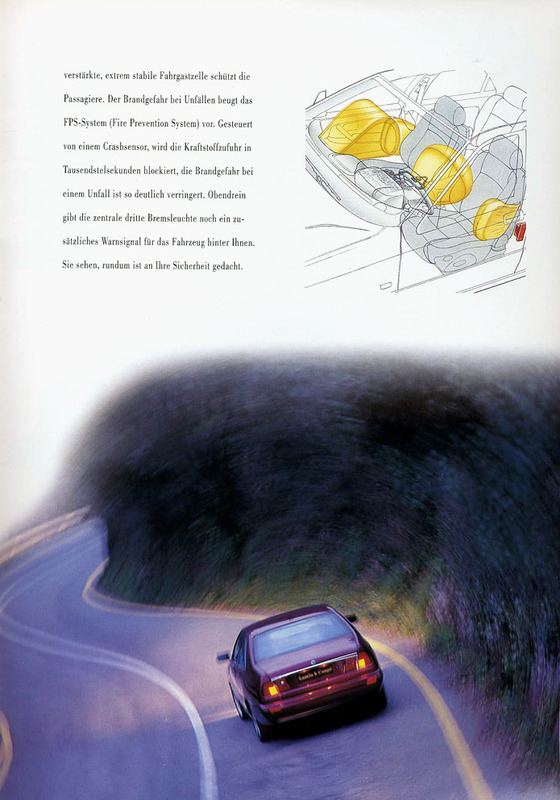 From a mechanical viewpoint, the braking system has been improved on cars fitted with more powerful engines: the 2.0 turbo 5-cylinder 20 v (220 bhp) and the 3.0 V6 24v (204 bhp). This new system offers the best assurance of safety even under extreme driving conditions. 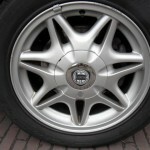 It was developed in conjunction with Brembo, world leader in the sector. Advantages of the new system include: brake efficiency improved by 10%, lining duration increased by some 30% and lower service temperature. For the customer, these attributes mean more responsive, modular braking, consistent pedal response (pedal load and travel has been reduced) and greater fade resistance. 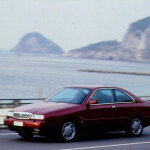 2.0 five-cylinder, 20v, turbo – petrolThis broad and diversified range will help the model reinforce its position on Italian and European markets. 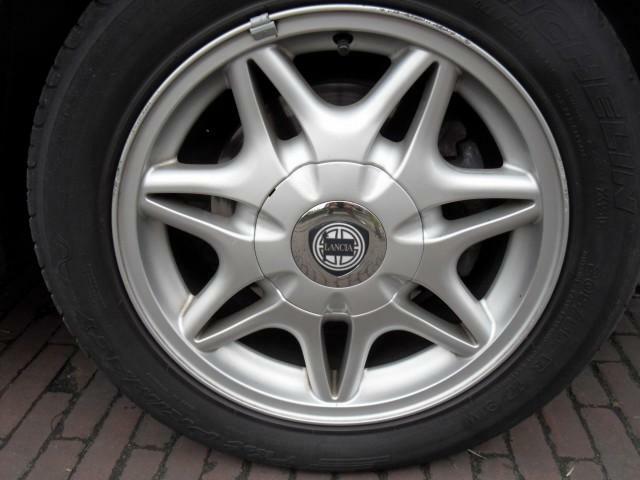 In Europe, the Lancia k’s market segment has fluctuated over the past five years. 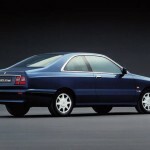 This trend is at odds with the steady increase experienced by the market as a whole: sales rose from just over 11 million in 1993 to more than 13,260,000 last year. 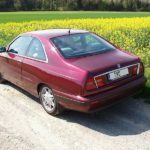 The Lancia k’s band rose initially (from 1993 to 1995) and then fell over the last two years and now represents 8.53 per cent of European sales. 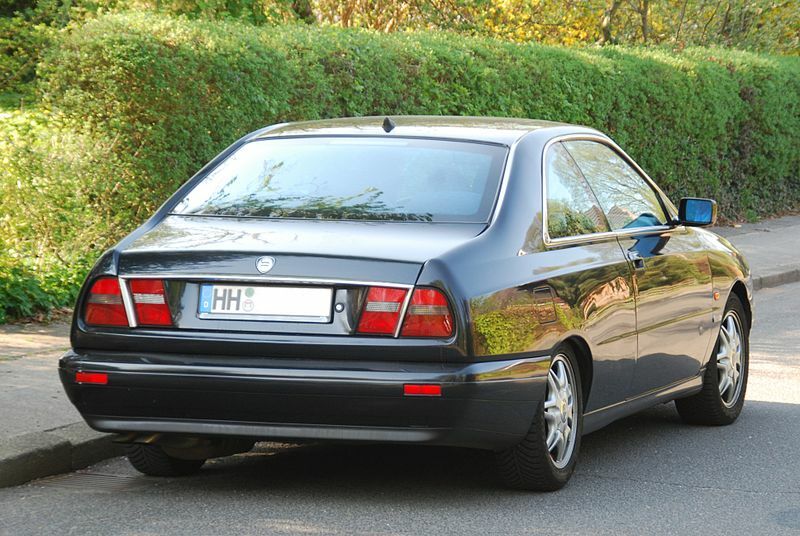 Against this backdrop, the Lancia k has managed sales of some 80 thousand since its launch. 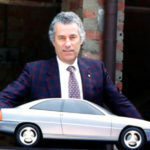 Some 50 thousand of this total were recorded during the last three years in Italy, where Lancia achieved a total sales figure of 11,500 cars in 1997 with a 12 per cent market share. 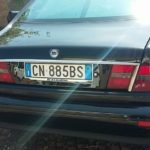 Lancia has always opted for the most advanced engineering and technological solutions and could hardly overlook the revolutionary Unijet direct injection system produced by Fiat research and manufactured by Robert Bosch. 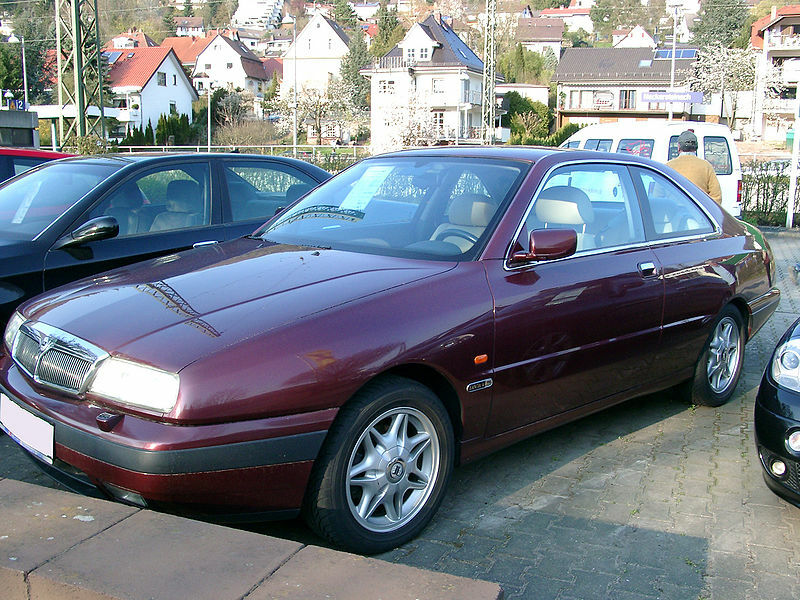 This world first was first fitted to a standard production model with the advent of the Alfa 156. It heralds a new era for diesel engines. Compared to conventional engines, JTD diesel engines run more smoothly, produce fewer emissions and consume less fuel. 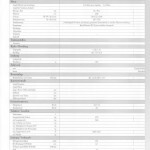 They are also more noiseless (up to 8 dB less) and perform better. 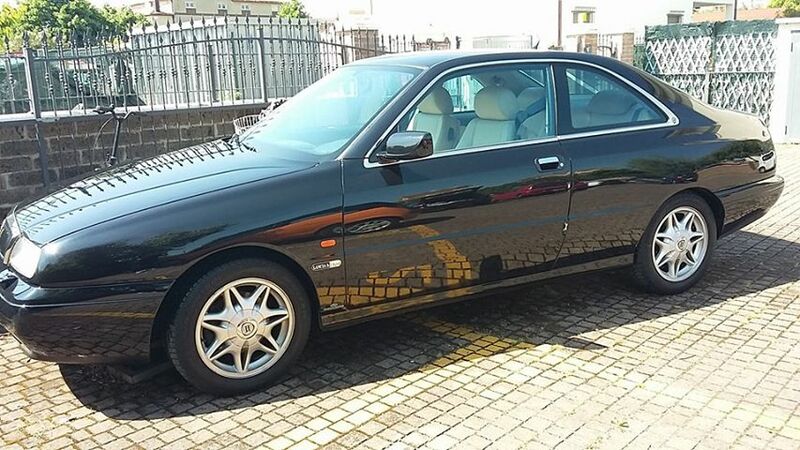 These attributes are perfectly in keeping with Lancia style: its great saloons are designed to ensure high comfort and performance – delivered smoothly and gradually. 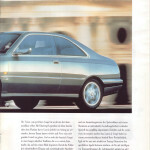 This was the thinking behind the decision to replace the current turbodiesel with the five-cylinder 2.4 JTD. 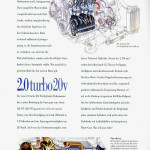 The new unit increases power (from 124 to 136 bhp) and torque (from 25.5 to 31 kgm at 2000 rpm) for improved performance. 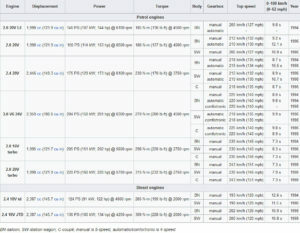 Top speed increases from 193 to 202 km/h and time taken to accelerate from 0 to 100 km/h drops from 10.7 to 10 seconds. Fuel consumption also drops: from 12.6 l/100 km to 10.2 over an urban cycle; from 6.5 to 6.2 l/100 km out-of-town; from 8.4 l/100 km to 7.7 over a combined route. In the Unijet system, injection pressure is independent of engine rpm and load (accelerator position) because the injection pump generates pressure by build-up. The electronic pump and injector control system also make it possible to optimise injection pressure and the amount of fuel injected at each engine service point. 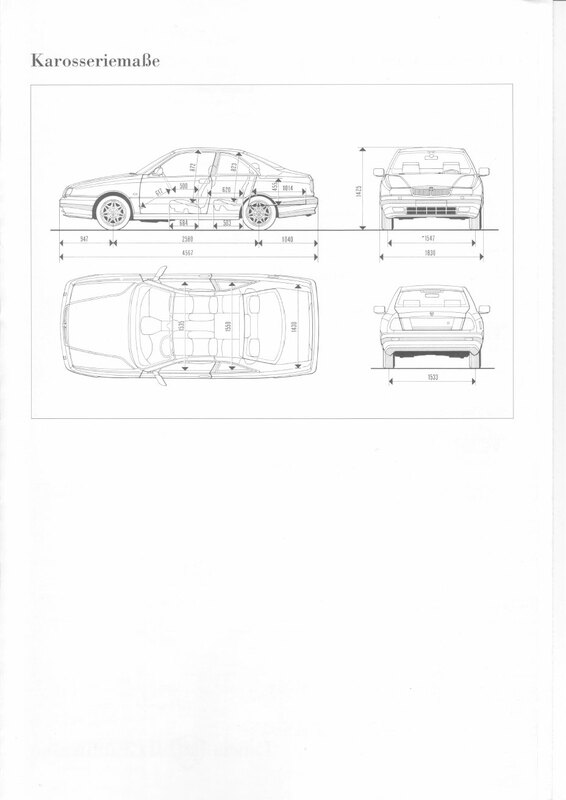 Other attributes of the 2.4 JTD’s construction include a multilayer steel cylinder head gasket for an effective seal, a close deck ductile cast iron crankcase with integral cylinder liners and a light alloy cylinder head. Inside the crankcase, the pistons feature an omega-shaped combustion chamber and the cylinder head contains spiral intake ducts that swirl the air round to promote mixing with the fuel. The two valves per cylinder, parallel and vertical, are operated directly by a single overhead camshaft. There are no prechambers, naturally, because the entire combustion process takes place in the combustion chamber within the piston. 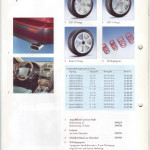 The auxiliary drive pulley is double-acting, i.e. 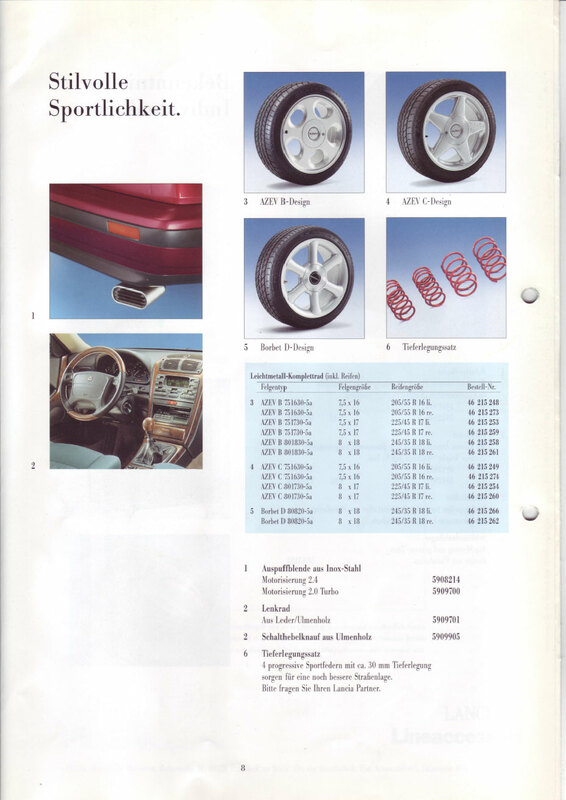 it can reduce crankshaft torsional vibrations and also stress on the belt and driven auxiliary components. Turbocharging is performed by a variable geometry turbocharger that ensures high peak power and excellent torque at low speeds. 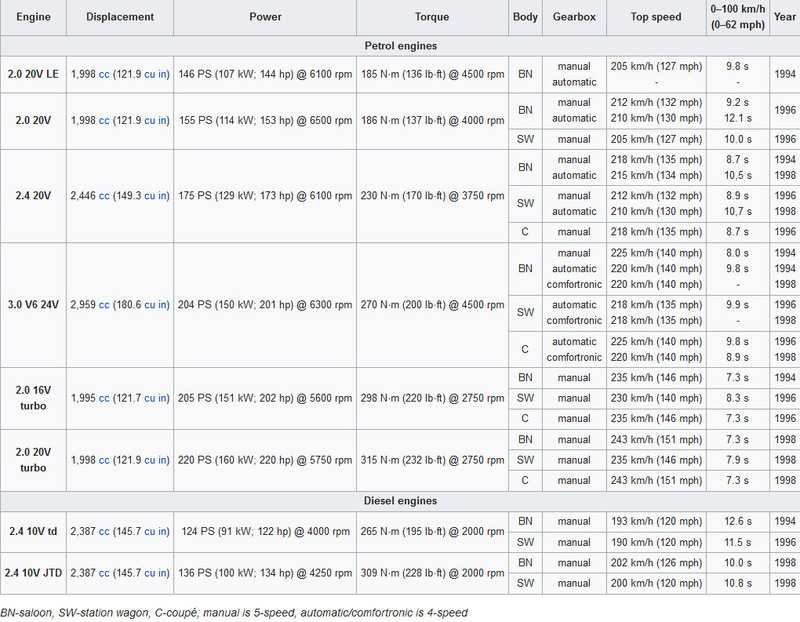 As the name suggests, the drive may alter vane angle to speed up or slow down gas speed and hence turbine speed. 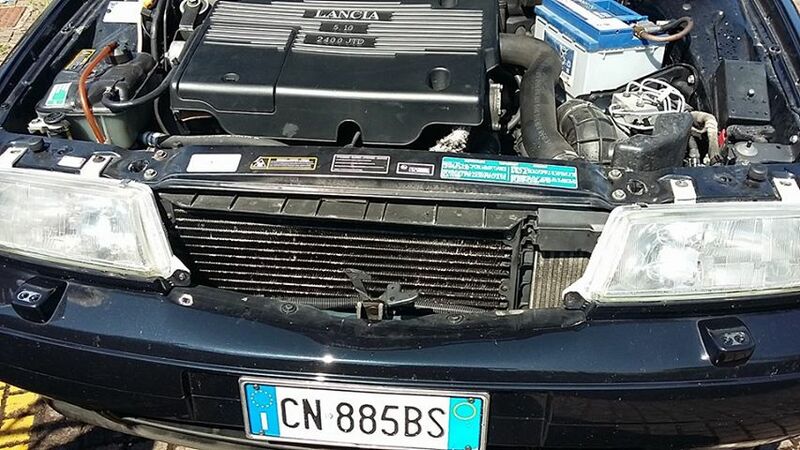 It is connected to an intercooler. The 2.4 JTD is also fitted with a dual mass flywheel (one mass integral with the crankshaft and the other with the gearbox mainshaft). 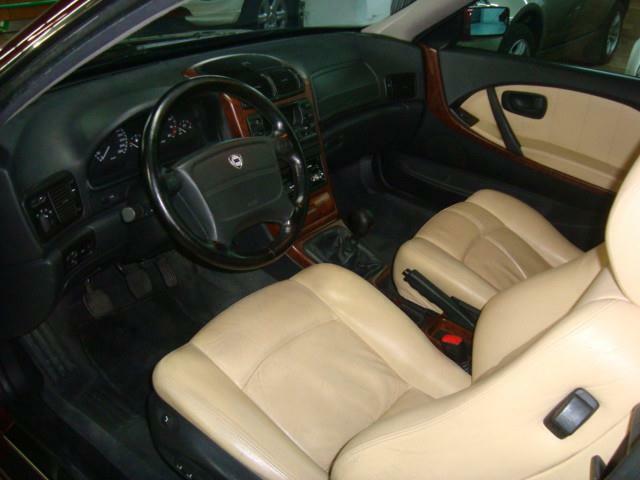 This reduces vibrations at low speed for quieter transmission and greater driving comfort. This factor is also increased by a counter-rotating balancer shaft that further reduces noise and vibration. 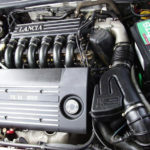 Lancia k’s will also now be fitted with the lively turbocharged five-cylinder unit already well-known for its exuberant performance. Compared to the previous unit of corresponding capacity, the new engine offers higher power (from 205 to 220 bhp), torque (from 30.4 to 31.5 kgm at 2750 rpm) and top speed (from 235 to 243 km/h). 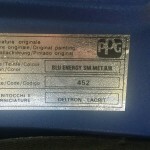 The basic attributes of this power unit remain unchanged. It still offers very smooth running (comparable to the performance of a six-cylinder-in-line unit) and a sophisticated turbocharging unit: a turbine-compressor system with an incredible air output of more than 700 m3/h. 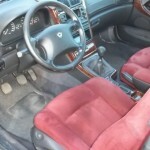 Apart from this, the unit also eliminates turbo-lag, i.e. 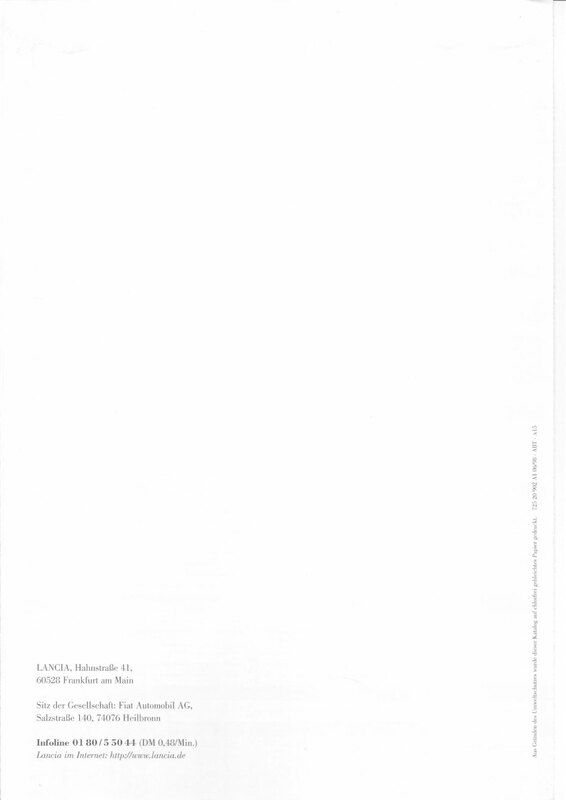 the delayed response typical of many turbocharged engines when the driver calls on the engine to produce power quickly with the engine running at low speeds. 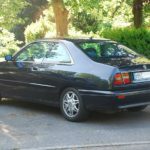 On the 2.0 five-cylinder 20v turbo, this fault has been overcome by adjustments to timing, the electronic control unit and also intake and exhaust valve geometry. 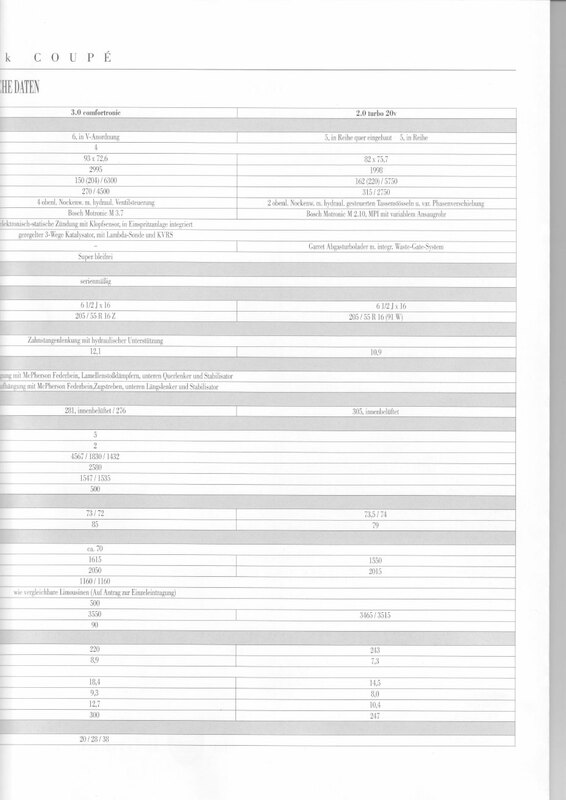 Turbocharger unit inertia has also been reduced. Comfort means silence and lack of vibrations. A dual mass damping flywheel has therefore been fitted on the clutch to reduce cyclic engine irregularities and eliminate all running noise. 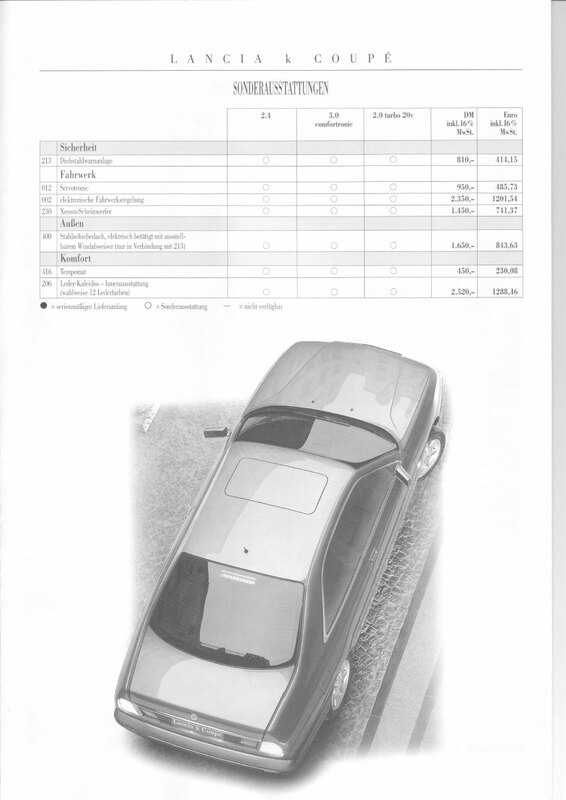 The engine control unit setting has also been changed to ensure a flatter torque curve. 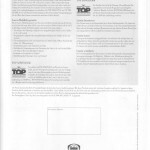 The torque rating is unchanged, but it is delivered in a much more linear and gradual manner. 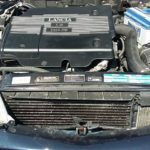 Lastly, the intercooler is specially configured to reduce maximum coolant temperature by three or four degrees and ensure more effective cooling. 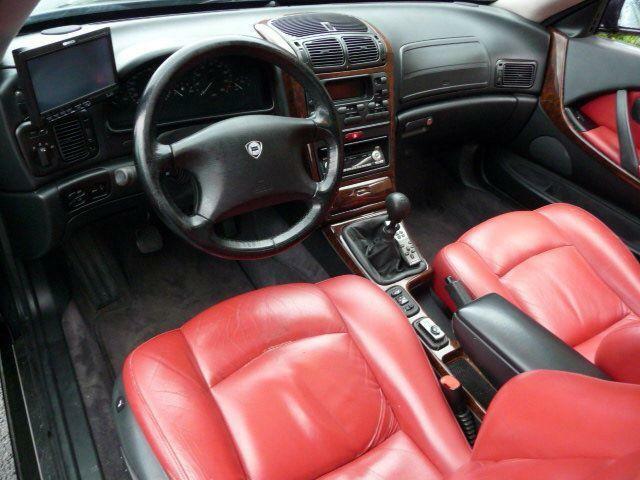 All this benefits reliability and engine life. All this horse power is harnessed to produce a controlled power output. 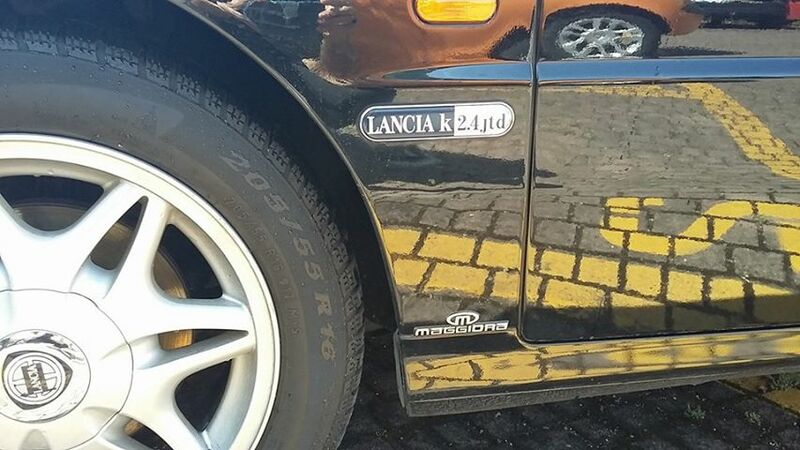 Even cars fitted with the 2.0 20v turbo engine handle well and are as easy to drive as all other Lancias. 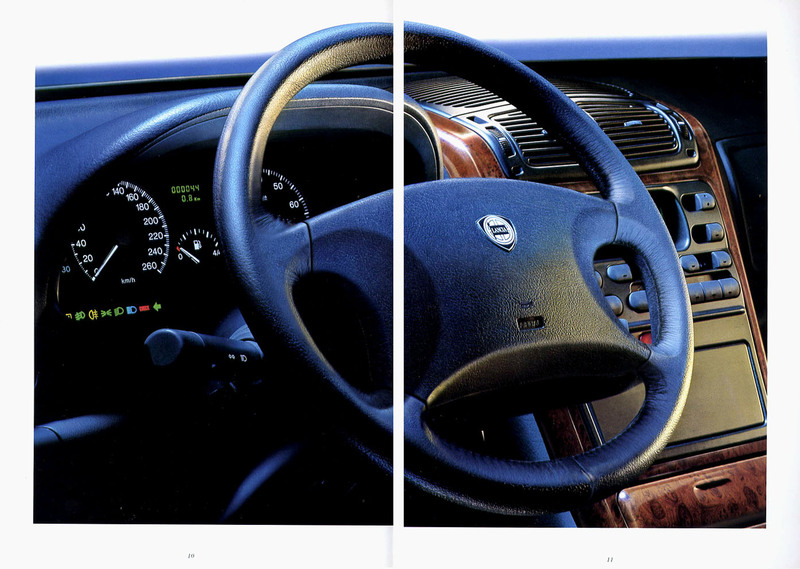 The image of the Lancia k saloon and Station Wagon is essentially unchanged. 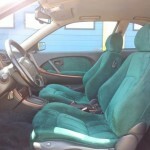 A very few minor changes have been introduced to accentuate the car’s elegance and comfort. 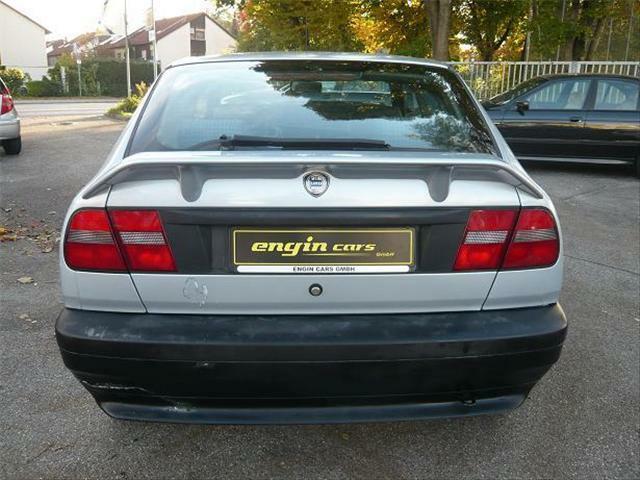 On all versions, the front and rear bumper strip is now painted in the same colour as the car (it used to be black). 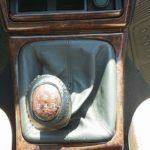 The gear lever knob and gaiter are leather trimmed. The steering wheel is now fitted with a rocking horn cover so that the entire steering wheel centre is pressure-sensitive. The facia and trim colour has been changed. Now they are a uniform anthracite grey. The walnut effect of the new central console is no longer opaque but glossy. 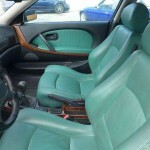 A new adjustable armrest has also been added between the front seats. 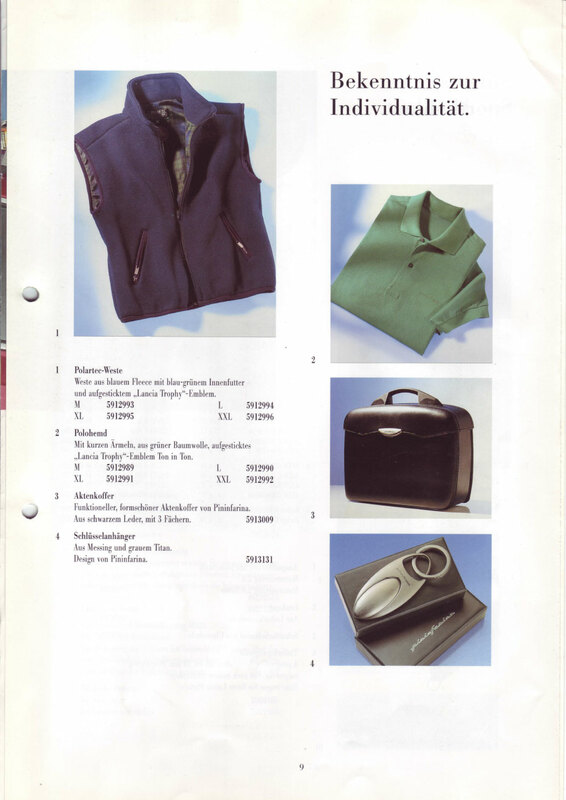 It is secured to the central console and the car floor pan with a roomy oddments compartment inside. 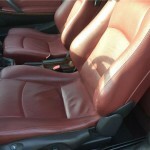 The compartment is hidden by a cover trimmed in the seat material. 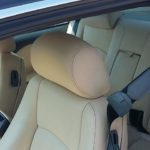 The armrest may be raised from its normal horizontal position until it has reached the required height. It can be released by pressing a switch and pushing down. 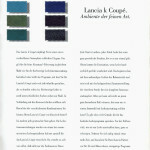 The range of body shades has been extended by two brand new colours: ivory and Venus grey (both metallescent). 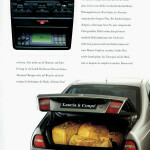 The standard equipment package common to all Lancia k cars now includes a remote control door opening unit. 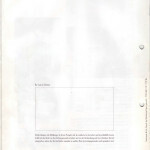 Individual versions have undergone further changes. 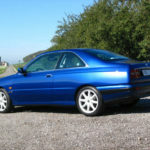 The saloon 2.0 turbo and 3.0, for example, are fitted with stylish 16″ alloy wheels with 5 studs and 6 1/2″ tread as fitted on the Coupé. 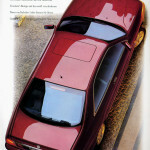 The saloon 2.0 turbo version deserves a section to itself. This lively performer now comes with a different specification. 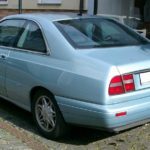 This underscores the car’s sporty temperament – also accentuated by a limited colour range that includes the five most vivid colours: Apollo Blue, Uranus Grey, Pluto Green, Black and Noble Red. 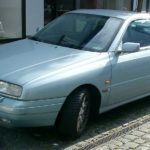 Outside, the car can be easily identified by the moulding surrounding the side windows (now in gun-barrel coloured anodised aluminium), the body-coloured door handles – and the 16″ alloy wheel trim. 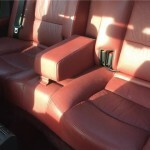 Inside, perforated Alcantara trim comes as standard. 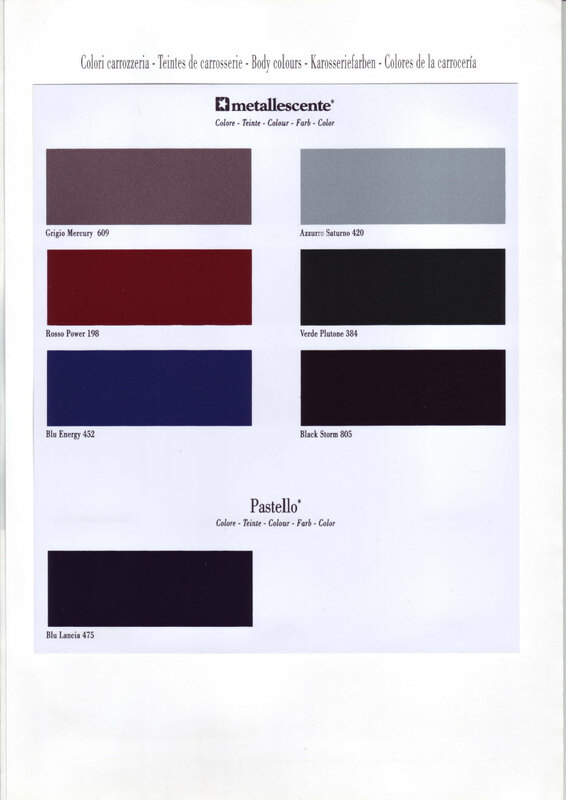 A choice of anthracite grey, beige or bordeaux is available. 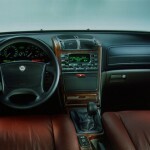 The Lancia k’s options are also extremely high tech. 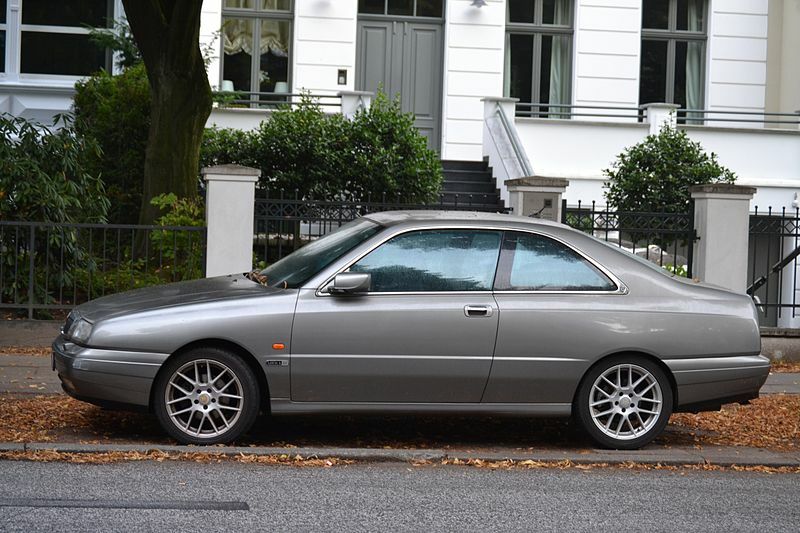 Some of these, such as cruise control and a sophisticated smart automatic transmission (self-adaptive, sequential type) are due to make their appearance in autumn. Others will be available straight away. 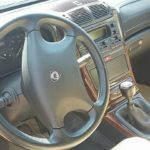 The latter include xenon headlamps, a radio navigator, side airbags and a sensor able to detect the presence of a passenger in the seat alongside the driver. These gas discharge headlamps offer improved emitted light quality and excellent performance under all atmospheric conditions. The bulb of xenon headlamps is brighter than a conventional bulb, distributes the light beam more effectively and lasts longer. Inside the headlamp, the normal filament is replaced by two electrodes spaced a few millimetres apart which generate an electrovoltaic discharge in an environment saturated with low-pressure xenon gas. 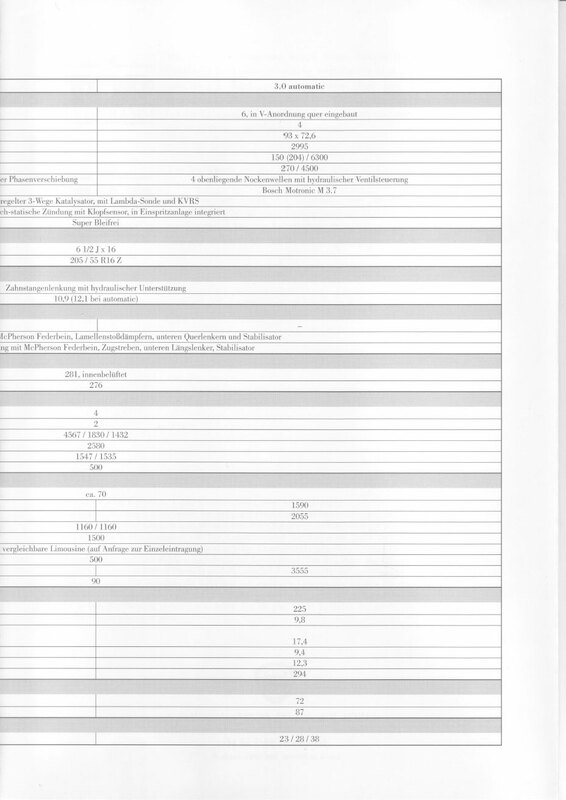 The results achieved by gas discharge headlamps compared to conventional filament headlamps can be summarised in a few lines: the emitted light flow is doubled from 1500 to 3000 lumen, efficiency is virtually quadrupled (from 25 to 85 lumen per Watt) and hours of duration double from 1500 to 3000. Because the new system performs so much better (brighter, more far-reaching light), the xenon headlamps come complete with an automatic headlamp alignment corrector to prevent oncoming drivers from being dazzled. 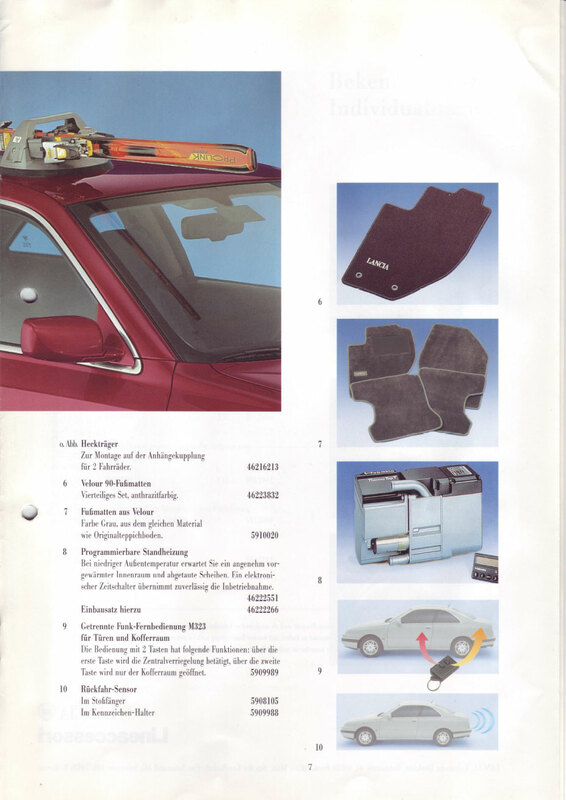 By automatically reversing the response to car static changes (different load on the axes) and dynamic changes (due to acceleration and deceleration), the device also offers greater driving comfort. 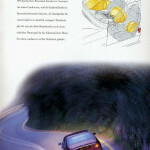 The area lit by the headlamps is also much more constant. 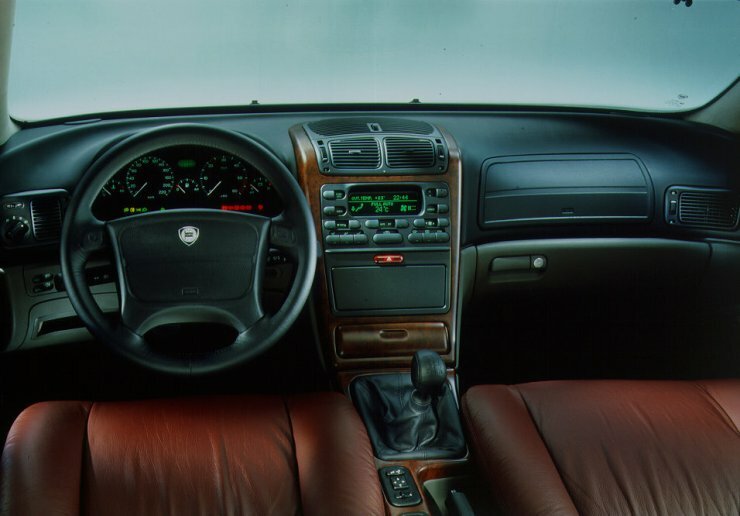 The Lancia k is the first Italian car to be fitted with a combined system that performs both radio and navigator functions. 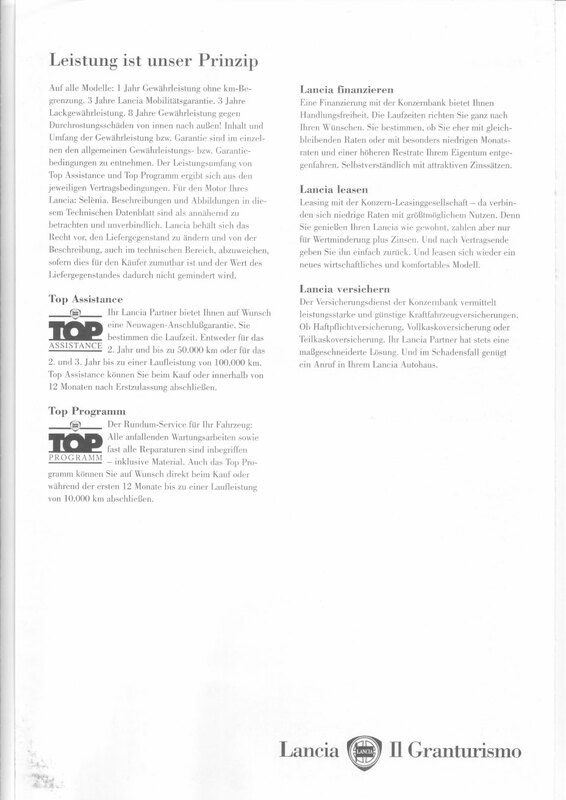 The radio navigator is the Bosch/Blaupunkt RNS 2 system. It is small enough to be built into the facia like a normal radio. 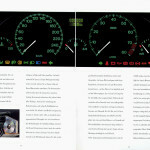 By means of a generous display and vocal messages in six languages (Italian, English, German, French, Spanish and Dutch), the device tells the driver the fastest route to a given destination. The driver simply indicates the chosen destination and the electronic co-pilot immediately takes over and warns the driver in advance (by means of visual and vocal messages) of direction changes. The radio navigator also provides further useful information, such as the number of kilometres to the destination, time required to cover the distance, name of the road along which the car is travelling and the name of the next road. 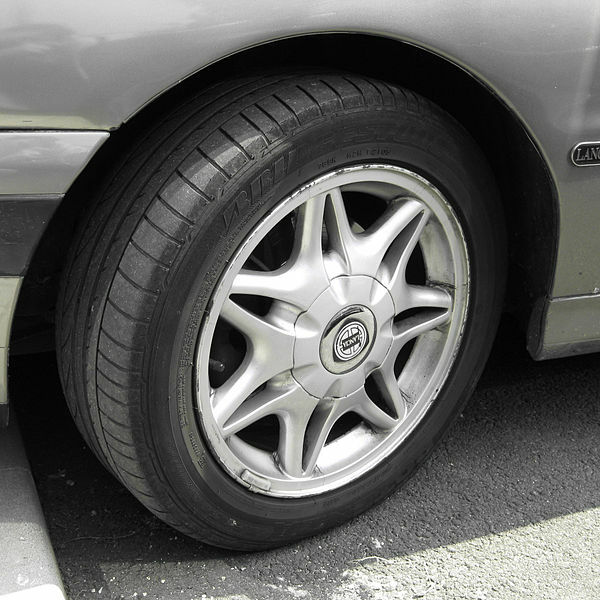 The first indication of car position is received very quickly – less than three seconds after starting up the car. Position is computed by the navigation computer using signals from a satellite GPS aerial and a gyroscope. 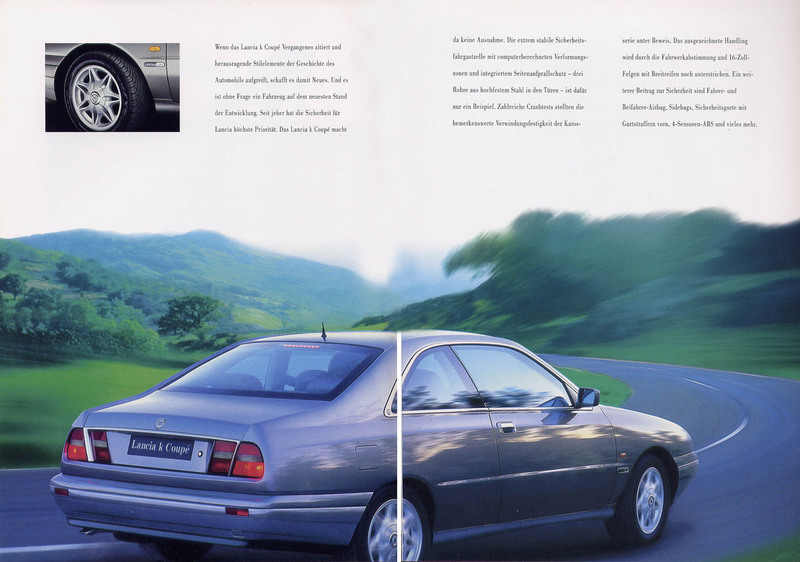 All the necessary navigation software is stored on a CD-Rom. 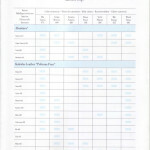 Data can therefore be updated by simply replacing the disc. 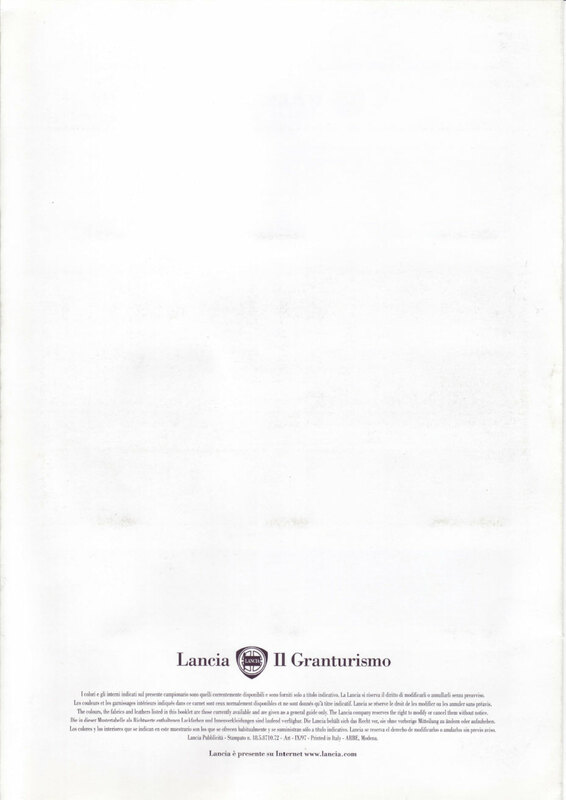 The CD contains a map of all Italy (including the islands). All road categories are not yet fully covered, but the map is continually updated. 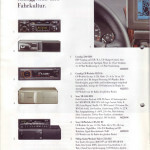 The radio navigator is also designed to allow dynamic navigation in the future. 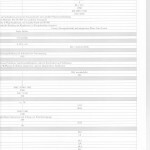 This will be based on data contained in electronic maps and also on traffic information broadcast from the outside via radio or telephone. The RNS 2 is controlled by Direct Software Control (DSC), which is used to establish operating specifications as with a radio. Power and basic audio reception are excellent. The audio reception is extended by two separate RDS receivers that exclude interference and allow for imperceptible frequency changes (while also, naturally, playing important traffic news during the trip). Four high-power channels ensure a clear sound. 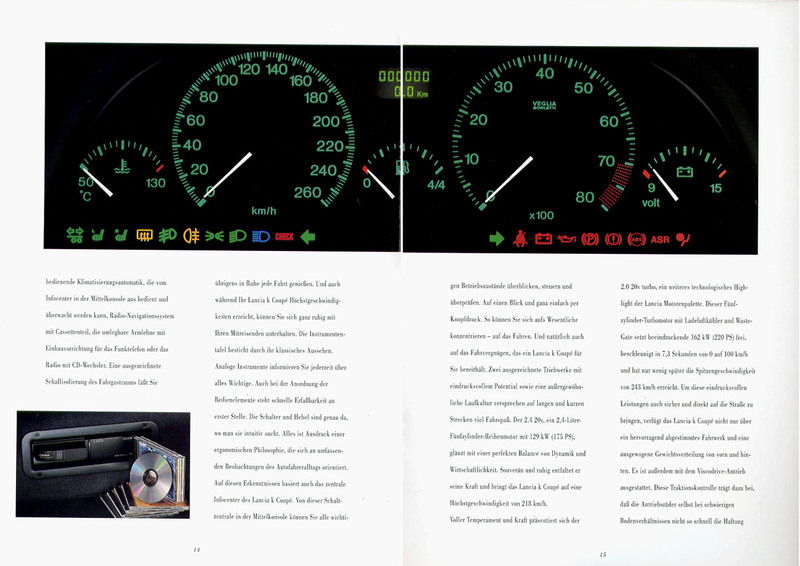 The cassette compartment is concealed behind the power-assisted display – which slides downward when pressed lightly. 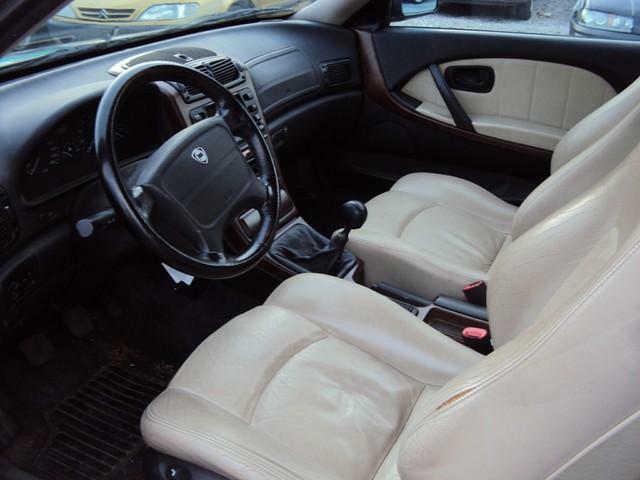 The cassette player may be replaced by an optional CD-changer. 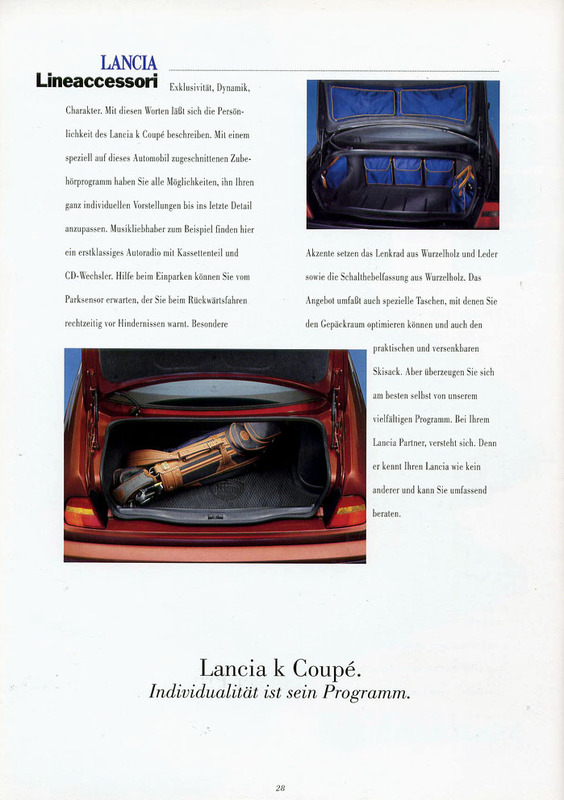 The Lancia k is fitted with side airbags to protect front seat passengers when the car is struck from the side. 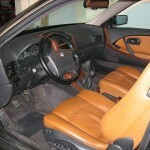 The airbags protect the thorax, the pelvis and part of the head. 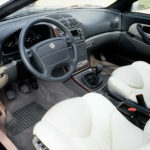 In the version adopted (along with the Alfa 156, Lancia k cars are the first Fiat Group cars to be fitted with this device), the side airbags are housed inside the front seat squab. 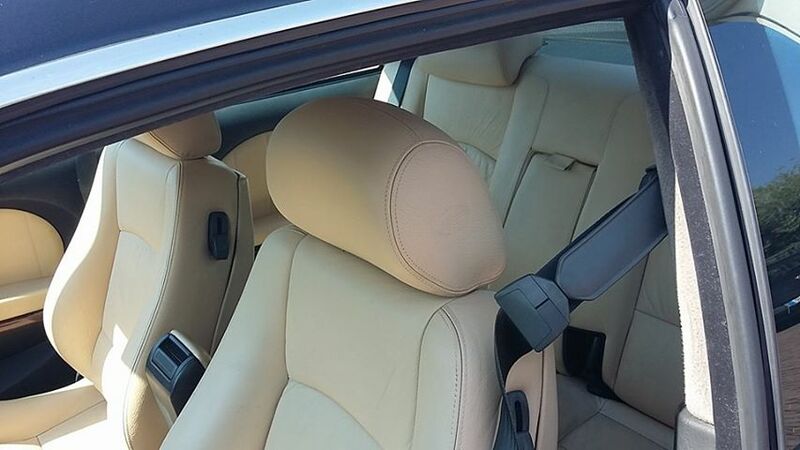 One advantage of the chosen configuration is that airbags are smaller in volume but still offer the same protection as bigger airbags housed in the door. Above all, this airbag offers the best protection to occupants regardless of stature, position and seat setting. 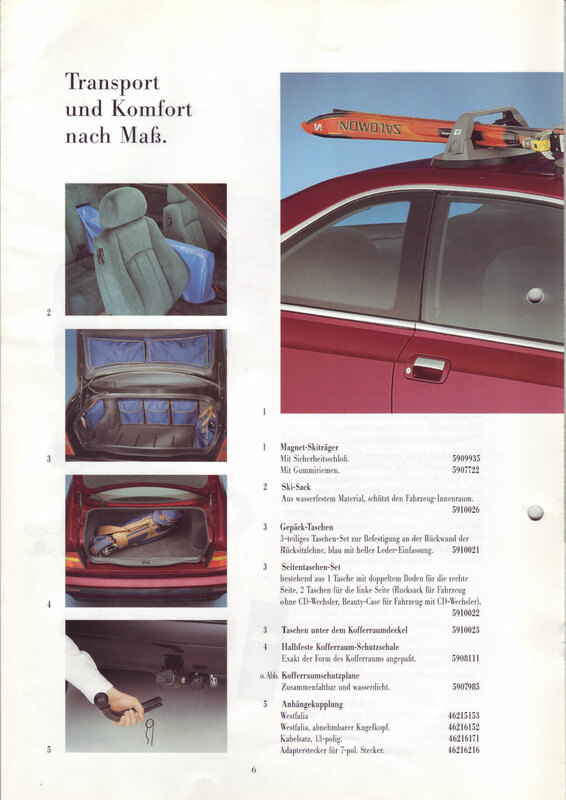 An airbag enclosed in the seat opens in a way designed to minimise the possible consequences of contact between bag and passenger. 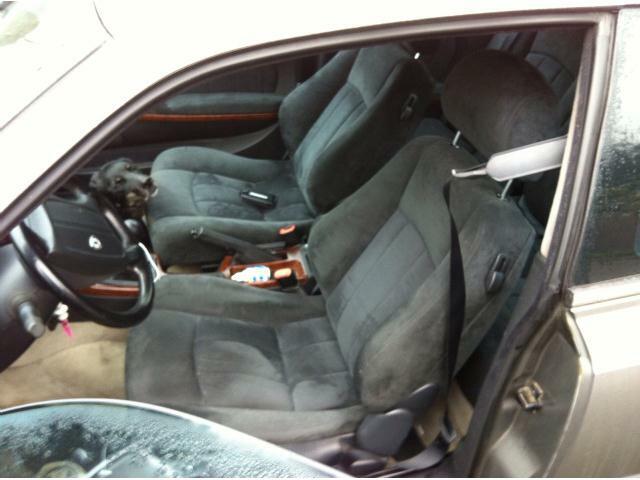 It moves away from passengers instead of moving towards them, as in the case of an airbag housed in the door. 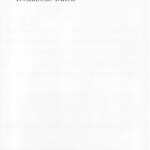 Altogether, the system is made up of three components. Sensors located on the central pillars receive an excessive side acceleration signal upon impact and send it to the electronic control unit. 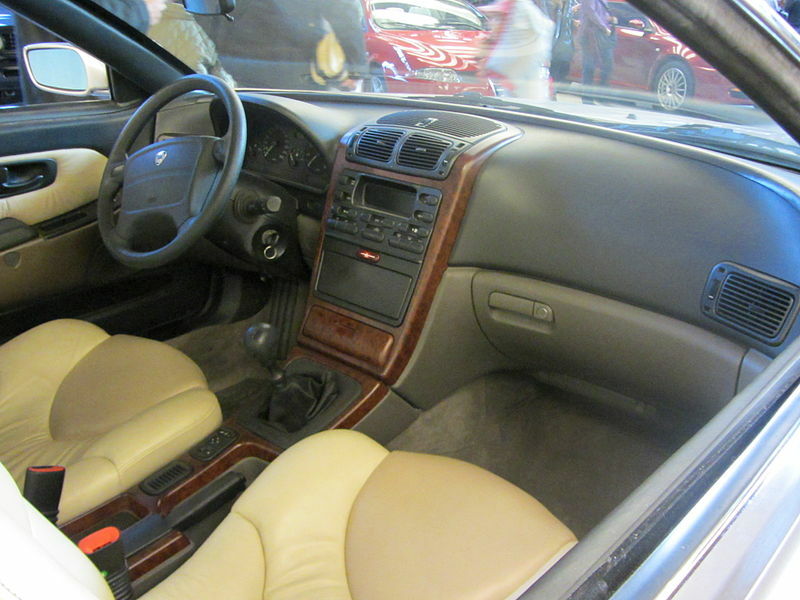 The control unit also receives the acceleration signal independently, compares it with input from the sensors and – when necessary – commands the side airbags to open. 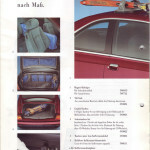 The airbags are nylon, measure about 12 litres in volume and inflate in 5-6 milliseconds. 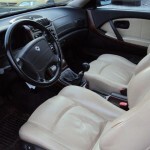 The electronic control unit that controls side airbag opening also controls the front airbags and the seat belt pretensioners. 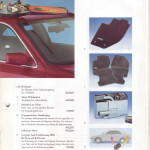 All these devices are controlled as part of an integrated system designed to offer car occupants progressive protection. The system will always respond in a manner consistent with the severity of impact. It will not intervene, for example, in the case of side impact at a speed lower than 15 km/h. 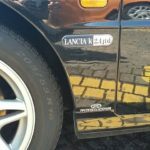 To reduce car repair costs after an accident involving airbag inflation, Lancia k cars can be fitted with a passenger presence sensor. 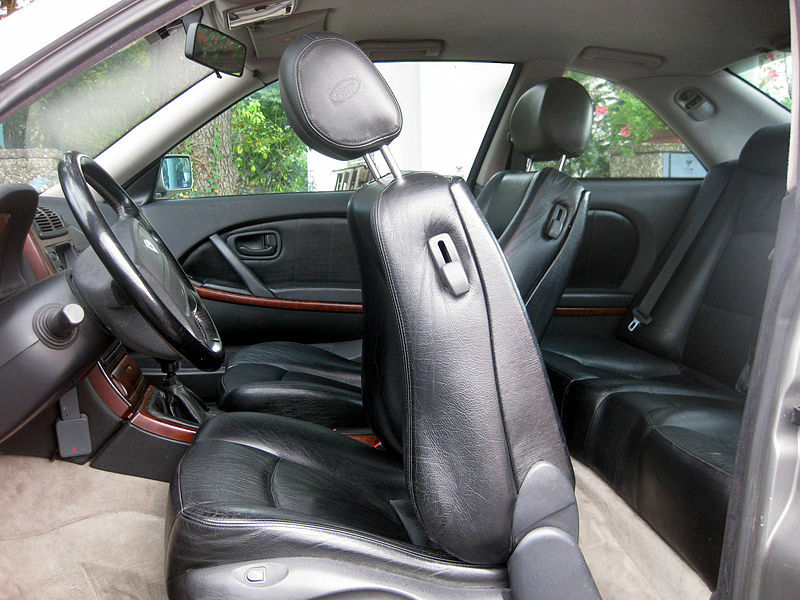 When the seat next to the driver is unoccupied, the control unit (if present) disables the relevant front and side airbags and the pretensioner. 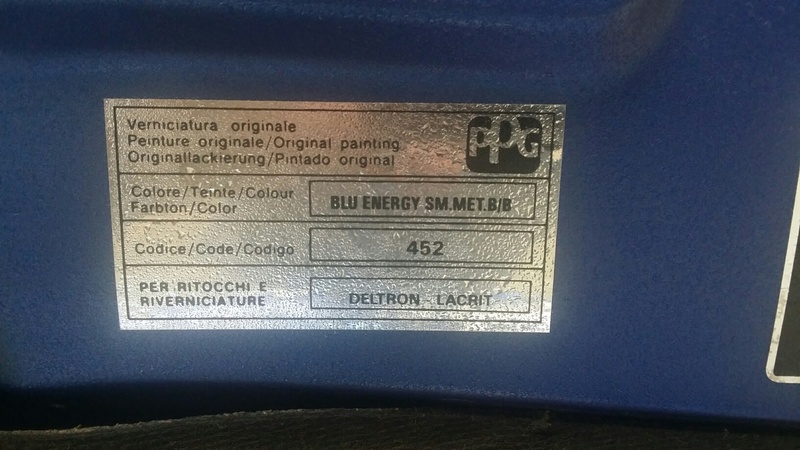 The sensor is fitted between seat padding and trim and covers the entire sitting area (but not the side panels). 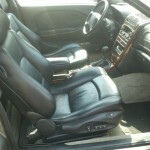 It can detect the presence of a person regardless of the position assumed or whether a seat belt is worn or not. 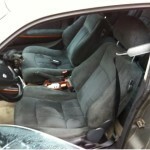 The airbag is deactivated 30 seconds after the seat is vacated. 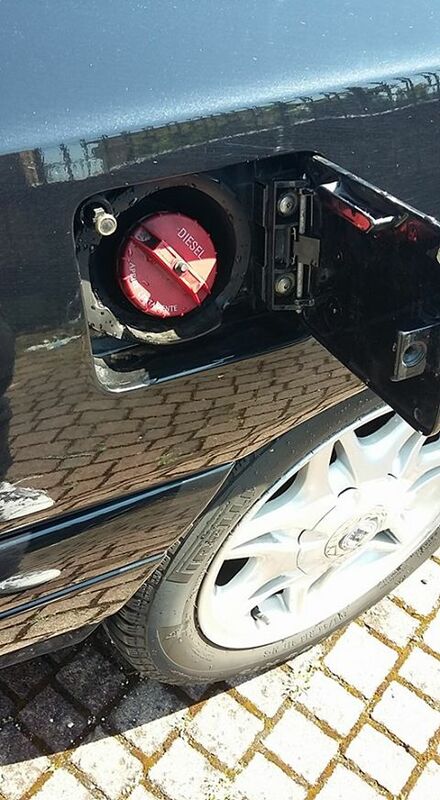 An amber warning light on the control panel comes on to indicate that this has taken place. 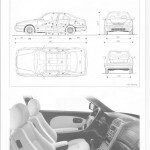 The device is naturally compatible with the seat heater and, like the other airbag system components, is continually monitored by the electronic control unit. If faults occur, signals are ignored and the system behaves like a conventional system, i.e. 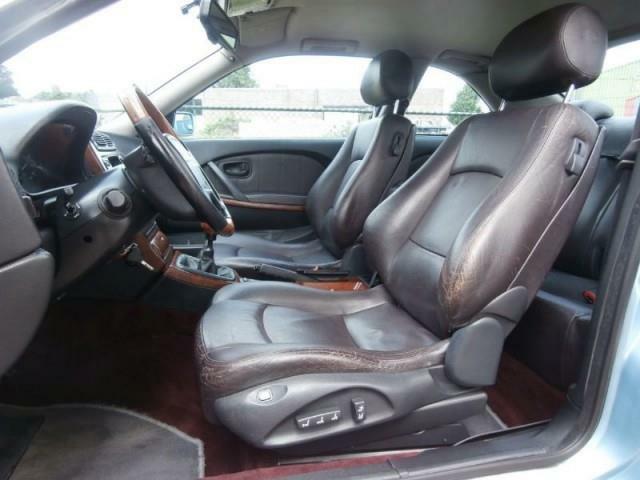 it maintains airbags and pretensioner active. 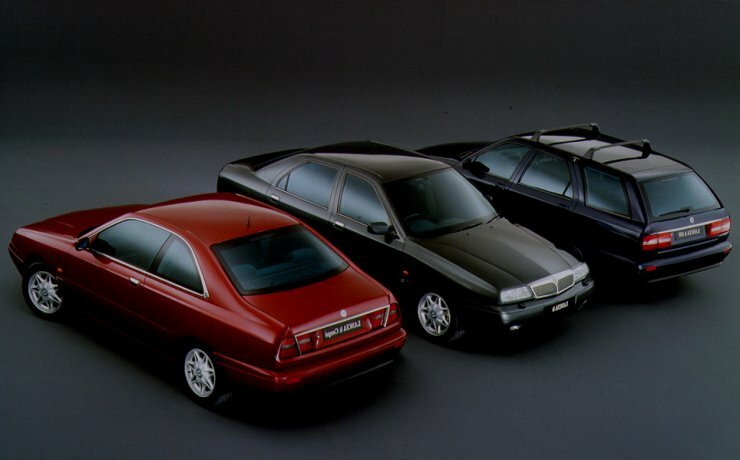 Prestige, power, reliability, quiet running and the ability to guarantee an excellent quality of life on-board: these are the main characteristics of the Lancia k saloon, Station Wagon and Coupé, qualities that make these cars the best possible heirs to the Lancia tradition. 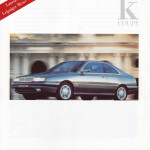 Three models from the vast range (22 versions in all) are exhibited in Geneva: a saloon, the Lancia k 2.4 5-cylinder with automatic transmission, a Station Wagon, the Lancia k with 2.0 5-cylinder 20-valve turbo, and a Lancia k Coupé 3.0 V6 24-valve with automatic transmission. 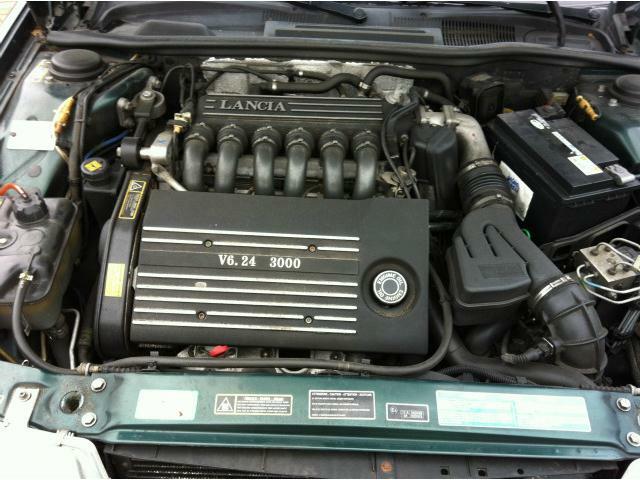 The engines fitted on the Lancia k convert available power into safety, flexibility and outstanding comfort. 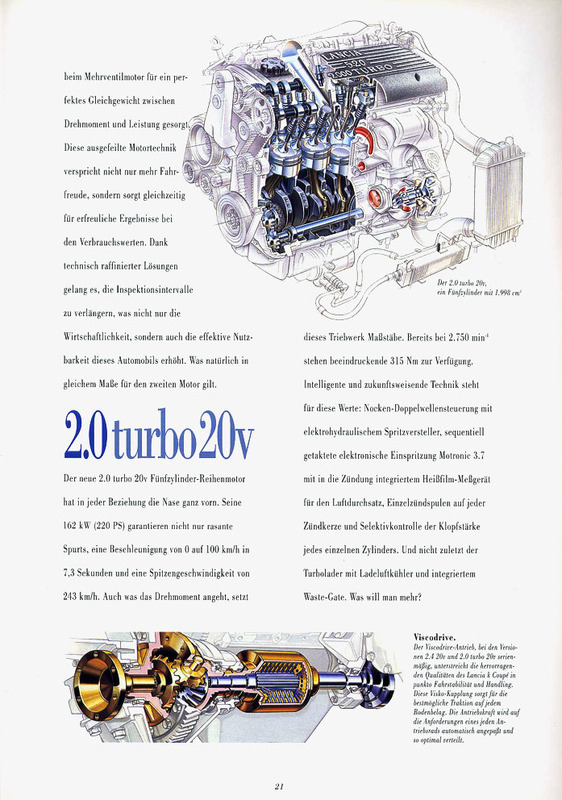 The 2.4 5-cylinder JTD engine delivers 136 bhp (100 kW) and a peak torque of 31 kgm at just 2,000 rpm, and takes the Lancia k saloon to 202 km/h, while the Station Wagon reaches 200 km/h. 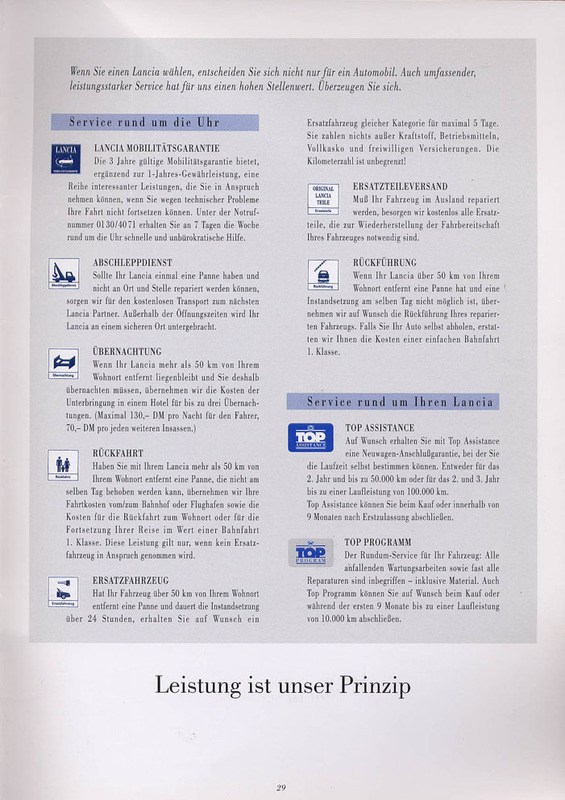 Consumption is sparing: 7.7 litres for 100 km in the combined cycle for the saloon and 7.8 litres for the Station Wagon. 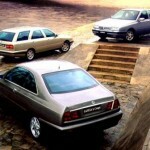 The 5-cylinder, 2.0 20-valve turbo engine is available on the saloon, Station Wagon and Coupé. 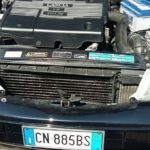 With a power output of 220 bhp (162 kW), torque of 31.5 kgm at 2,750 rpm, this engine takes the saloon and Coupé to a top speed of 243 km/h (235 km/h on the Station Wagon). 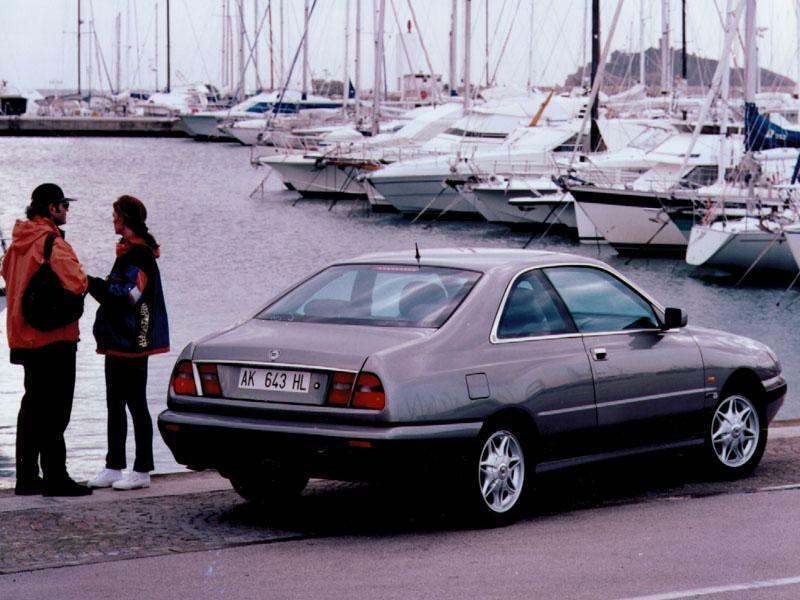 The engine range is completed by the aspirated 2.0 and 2.4 (the former is only available on the saloon and Station Wagon, while the latter is also offered on the Coupé), and the 3.0, available on all three versions. 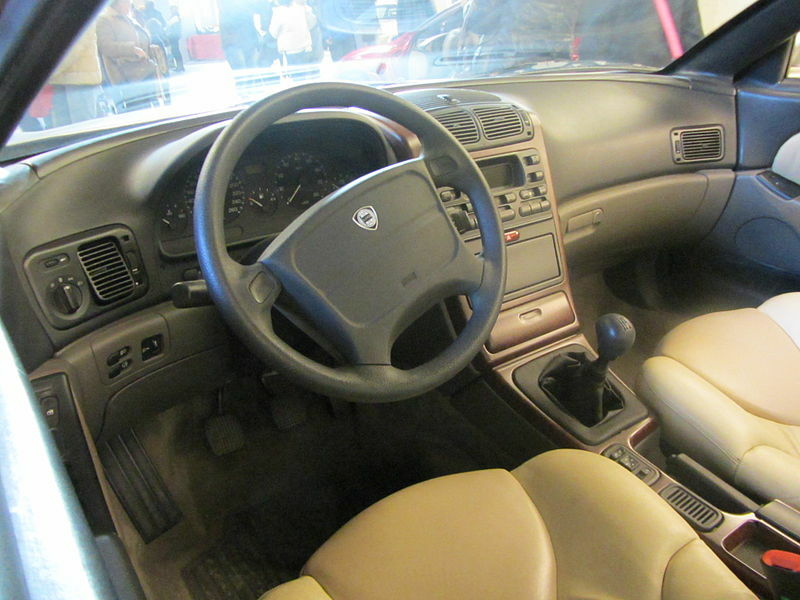 The Lancia k saloon also offers the three engines combined with automatic transmission, the 2.0, 2.4 and 3.0, while the 3.0 engine combined with automatic transmission is also available on the Station Wagon and Coupé. 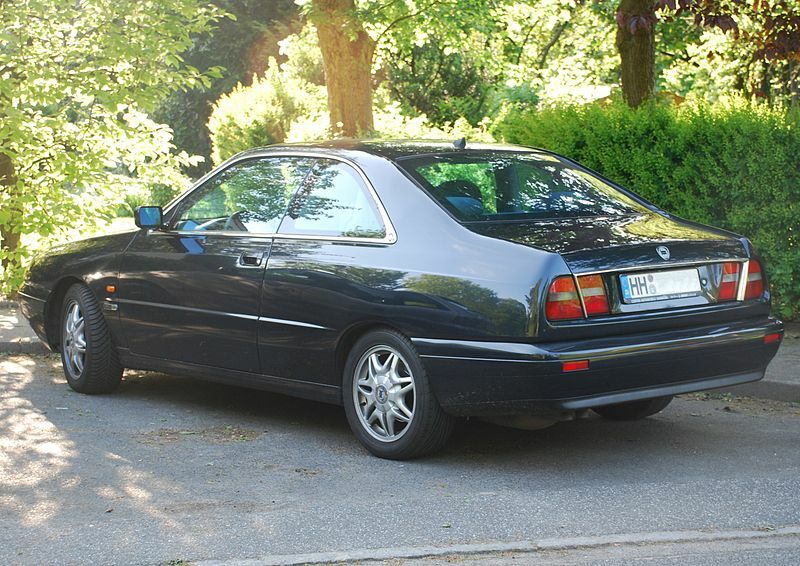 The Lancia k is offered with a choice of three specification levels: the refined, elegant LS and LX and a sportier outfit specifically for the saloon and the 2.0 turbo 20v petrol version of the Station Wagon. 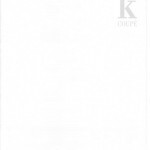 On all versions you breathe a warm atmosphere of refined luxury. 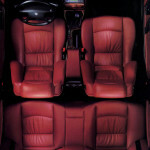 The upholstery is velour on the LS, Alcantara® on the LX and the Coupé, and perforated Alcantara® on turbo versions. 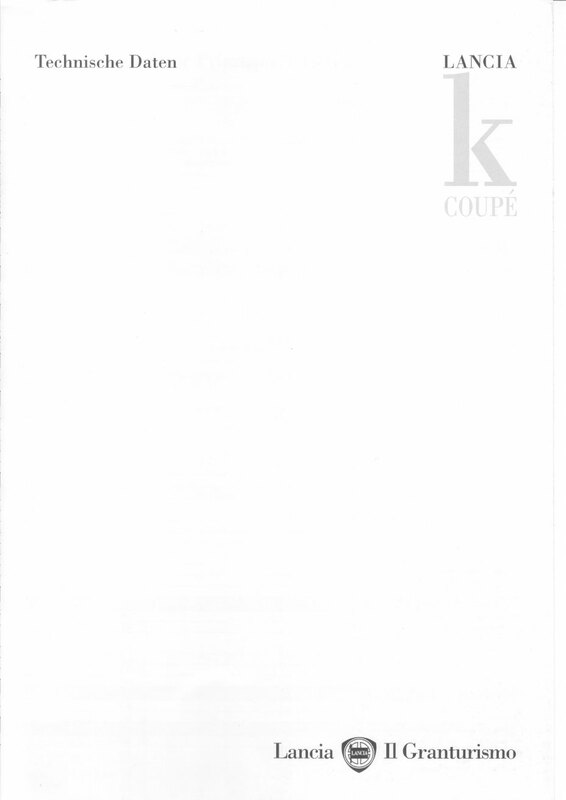 Soft Poltrona Frau leather is available with the specific Kaleidos Leather option on the Coupé. 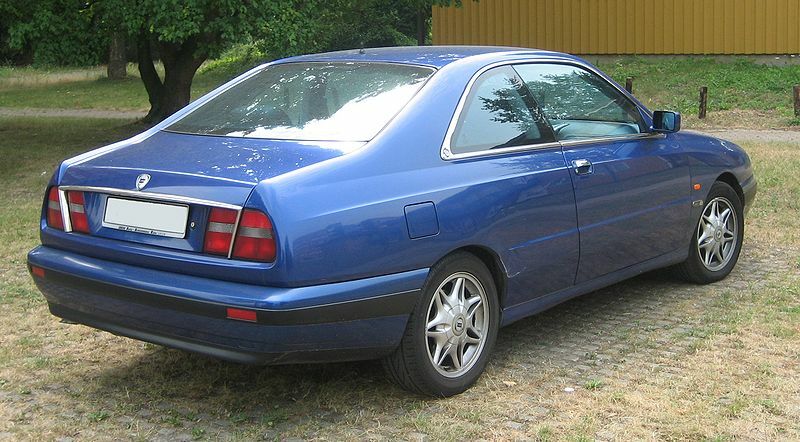 The assertiveness of the 2.0 turbo saloon is accentuated by details such as the exclusive colours, mouldings in gun-barrel grey anodised aluminium around the side windows, the trims of the body-coloured door handles, the 16″ alloy wheels with 5 stud bolts and 6 1/2″ channel (already fitted on the Coupé and now offered on this version as well as on the 3.0 saloon). 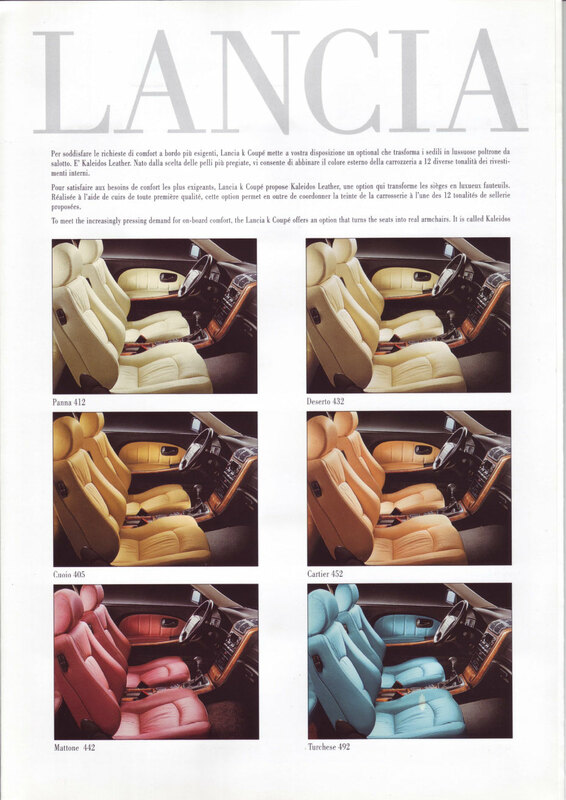 In addition to its great comfort, the different versions of the Lancia k stand out for their original line, which contains some attractive references to Lancias of the past. 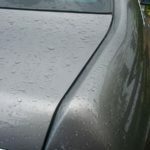 On the outside, the elegance of the cars is underlined by details such as the body-coloured rubbing strip on the front and rear bumpers. 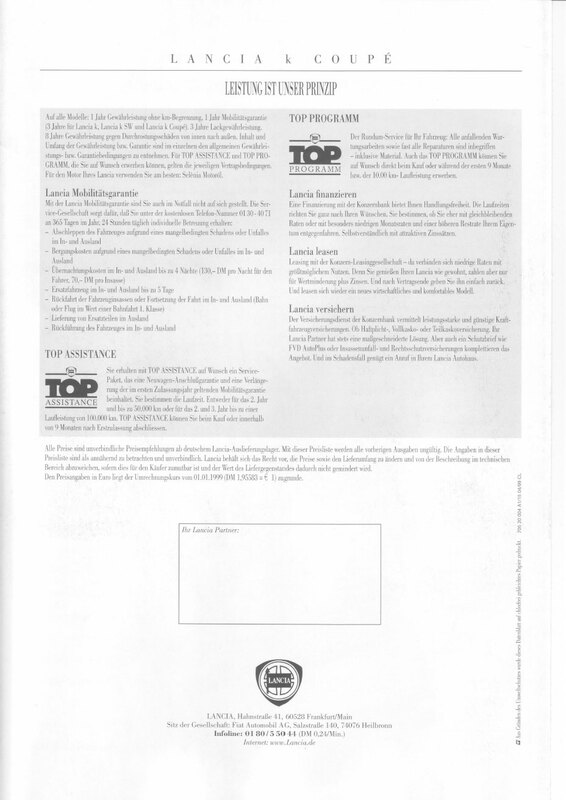 A number of prestigious options ensure a very high level of reliability and safety. 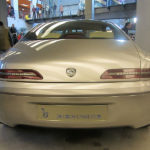 They include the radio-navigation system, sidebags, and xenon headlights with automatic alignment adjustment, which improve night-time visibility but do not dazzle oncoming cars. 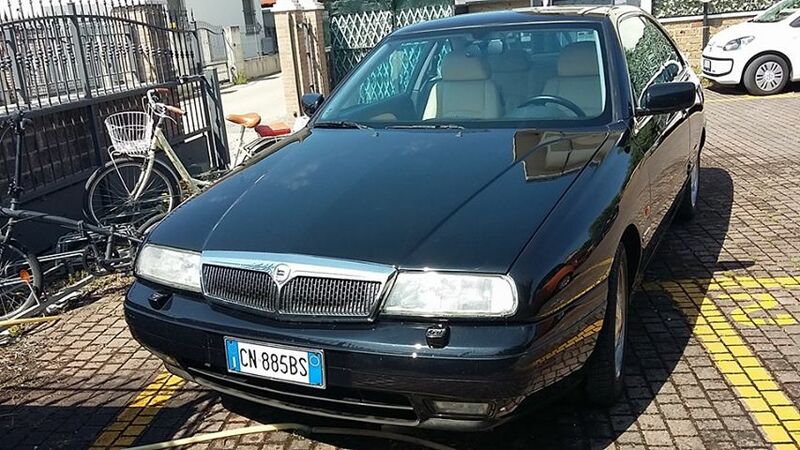 Prestigious, powerful and noiseless, the Lancia k saloon, Station Wagon and Coupé are remarkable for their excellent quality of life on board and their refined style with its pleasing allusions to Lancia’s of bygone days. 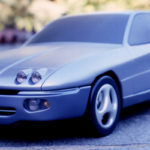 Yet these retro ideas are combined with the most advanced engineering. 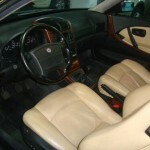 Such as the Comfortronic self-adaptive automatic transmission fitted to the powerful Lancia k 3.0 V6 engines. 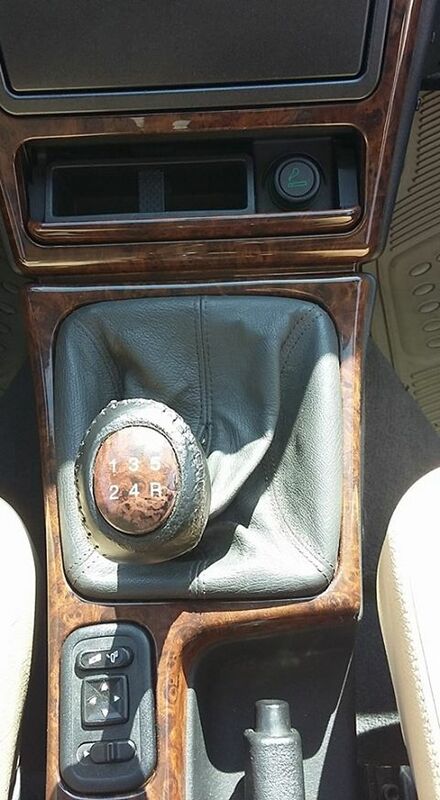 Or Cruise Control, which automatically maintains a cruising speed set by the driver. 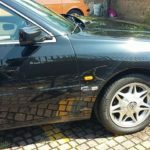 This latter device is available on saloon, Station Wagon and Coupé and comes as standard equipment or as an option, depending on the individual version and market specifications. The state-of-the-art power units are all able to translate great power into safety, driving flexibility and good comfort. 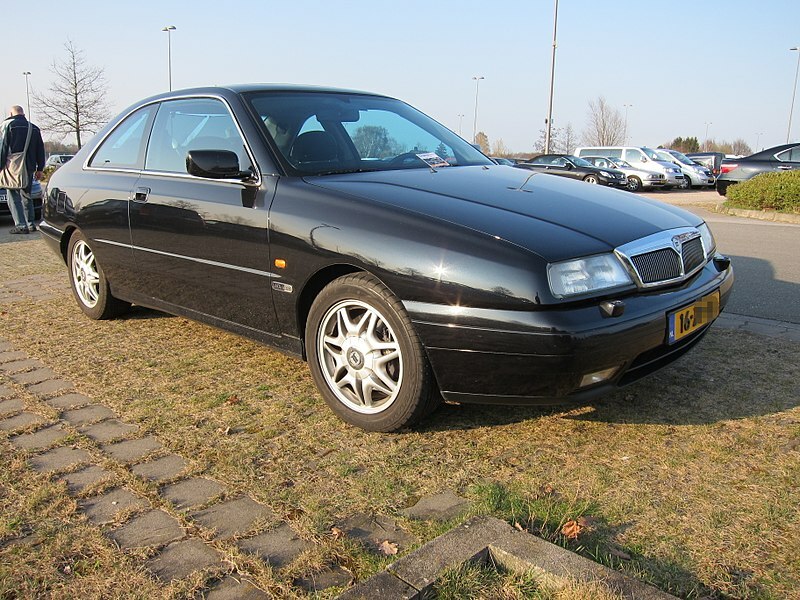 The 100 kW (136 bhp) 2.4 JTD turbodiesel engine is fitted to the saloon and the station wagon while the five cylinder 2.0 turbo 20v petrol unit (162 kW – 220 bhp) is also available on the Coupé. 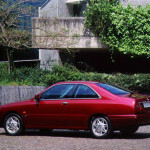 The range is completed by naturally aspirated 2.0 and 2.4 units (the former fitted only to the saloon and Station Wagon, the latter also to the Coupé) and a 3.0 unit fitted to all three versions. 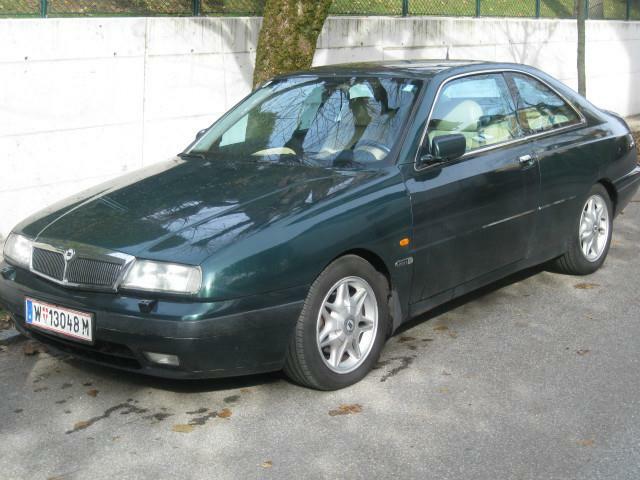 Lastly, the Lancia k saloon offers three engines with an automatic transmission: 2.0, 2.4 and 3.0. 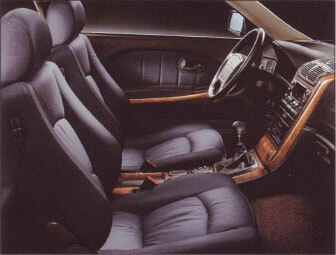 The 3.0 with automatic transmission is also available on the Station Wagon and Coupé. 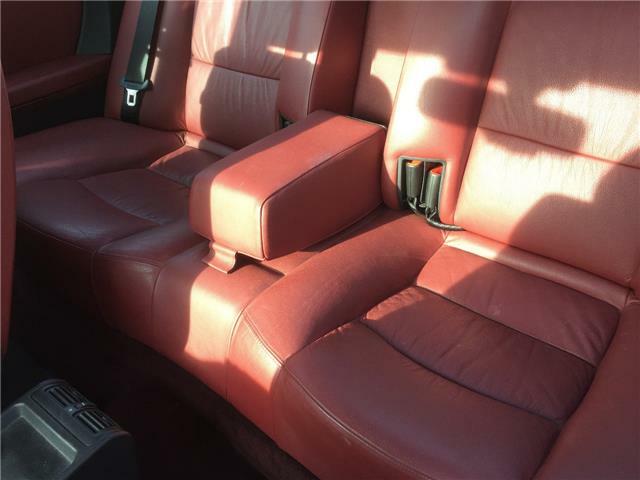 Three trim levels are also available: sophisticated, stylish LS and LX versions plus a sportier outfit designed specifically for the 2.0 turbo 20v petrol saloon and station wagon. 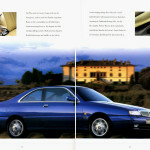 All versions exude a rarefied air of refined luxury. The trim is velour for LS Versions, Alcantara® for the LX and Coupé and perforated Alcantara® for turbo versions. 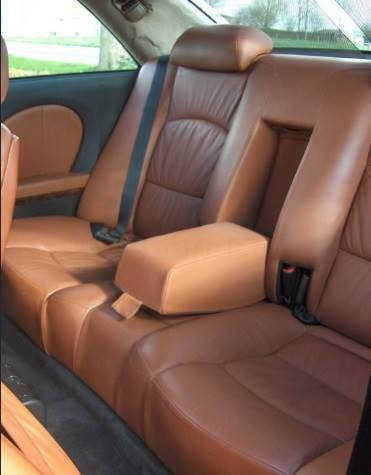 The car can also be optionally trimmed with soft Poltrona Frau leather, and a special Kaleidos Leather option for the Coupé. 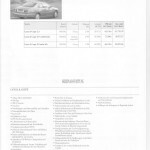 The options, also prestigious, are designed for top reliability and safety. 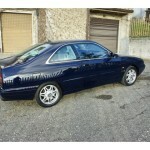 Specific items include: radio navigation system, sidebags and xenon headlights with automatic alignment corrector.